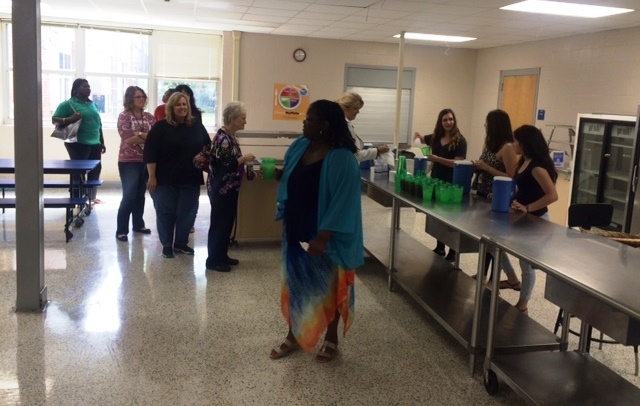 Students in Jason Wheless’ culinary arts program at West Ashley High School prepared and served a tasty lunch to Career and Technology Education Department Chairs from schools throughout the district. 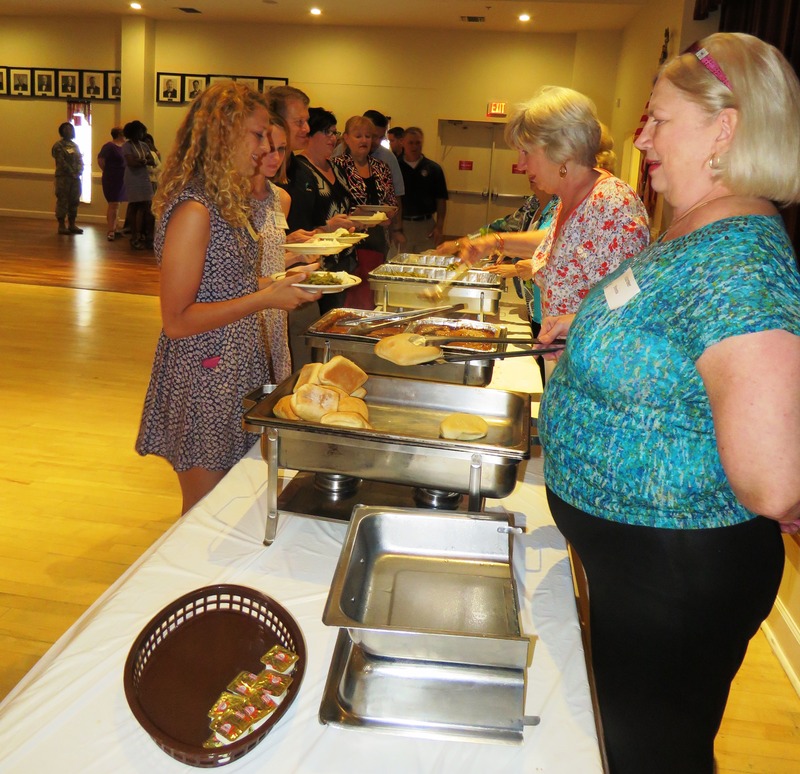 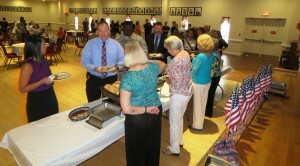 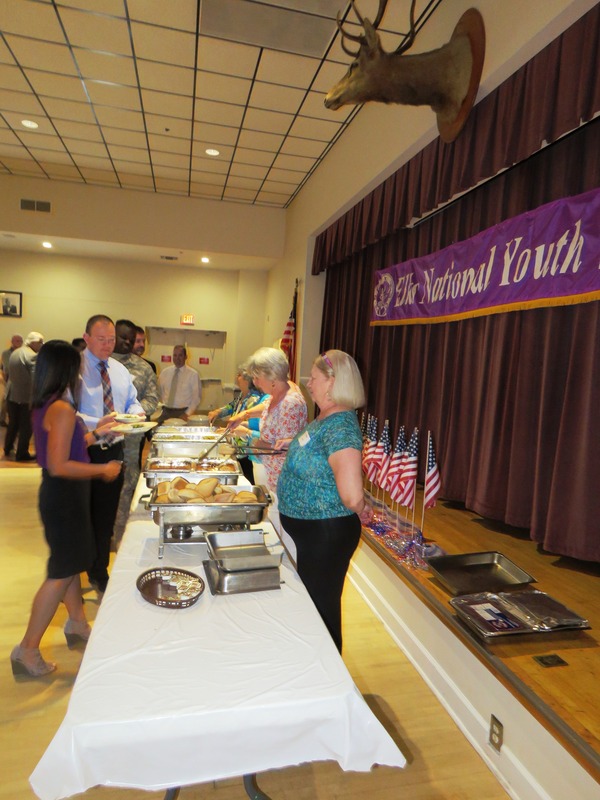 The menu included homemade chicken salad, croissants, pasta salad, fruit, and green salad. 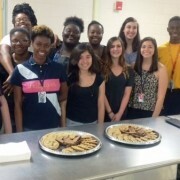 Fresh squeezed lemonade and freshly brewed iced tea complimented the meal perfectly, and freshly baked chocolate chip cookies and espresso brownies were served for dessert. 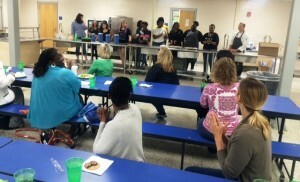 Thank you to Chef Wheless and his amazing students for a wonderful lunch! 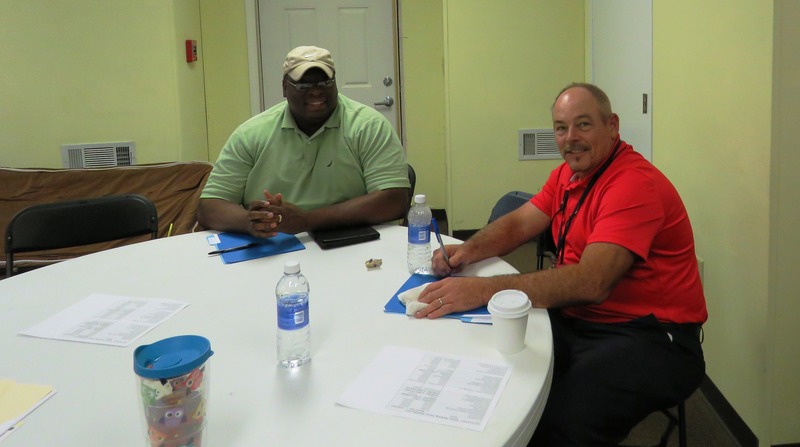 And, thanks to the amazing CTE department chairs for all their hard work ensuring their school’s equipment requests are properly submitted for the local plan! 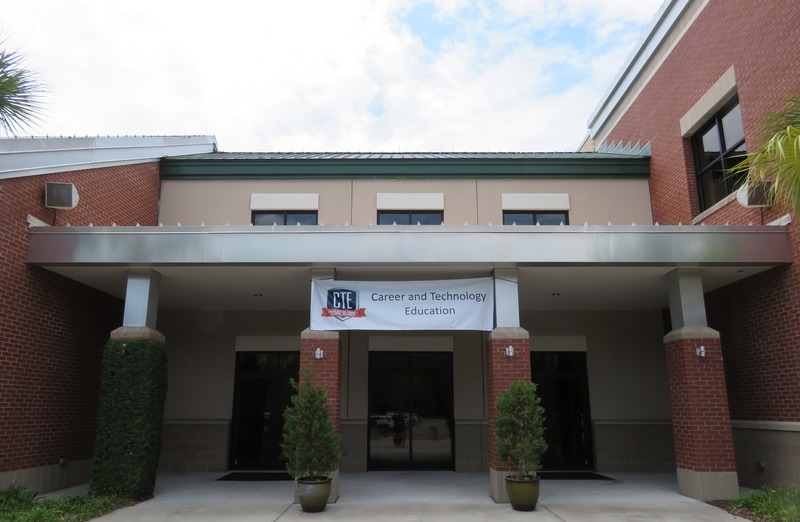 With 39 programs in 11 CCSD High Schools, the Charleston Metro Chamber of Commerce “Career Academy” initiative is kicking off the 15/16 academic year with strong partnerships for CTE programs throughout the district. 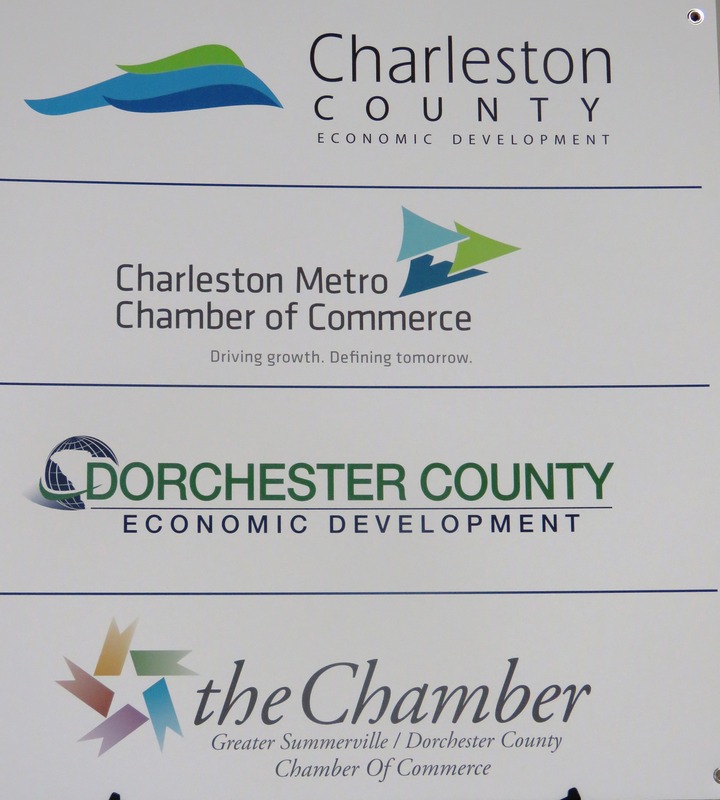 Thanks to all the terrific business partners that have agreed to invest their time and support in Charleston County schools! Link to MORE INFO on Career Academies, including the list of business partners already committed to help. 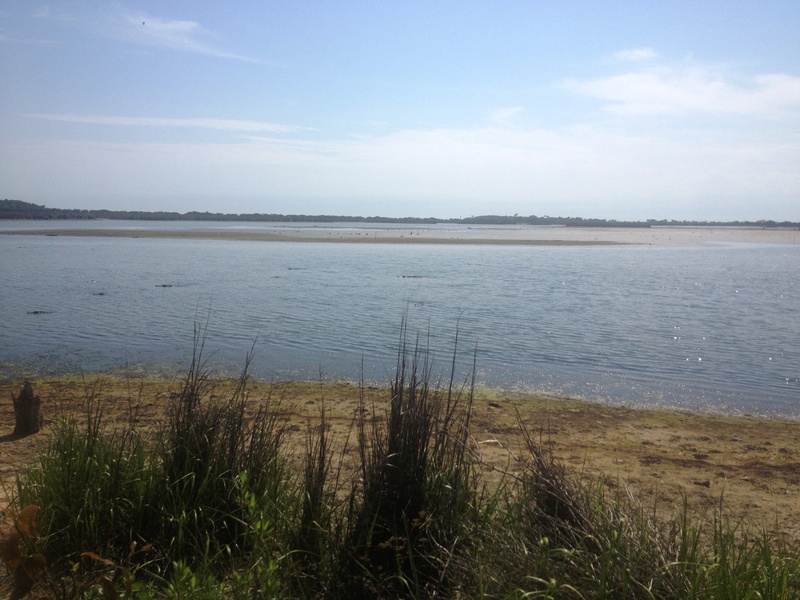 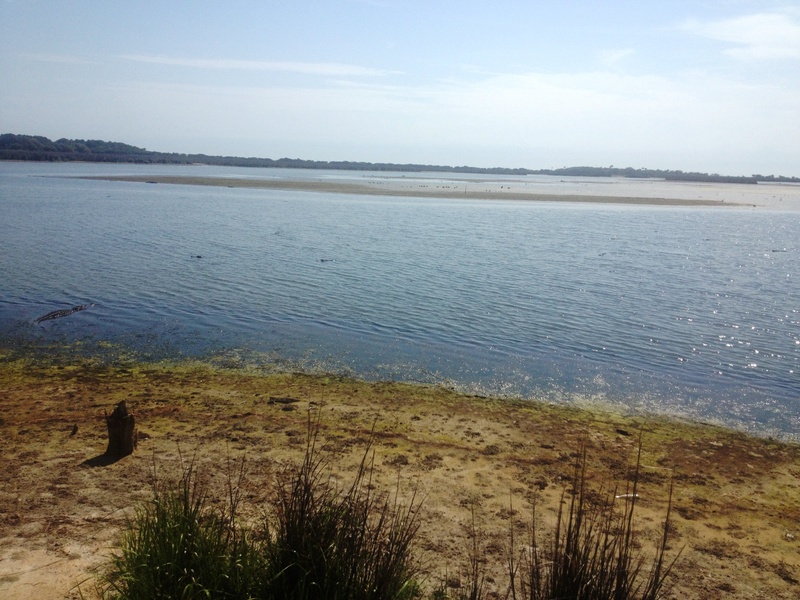 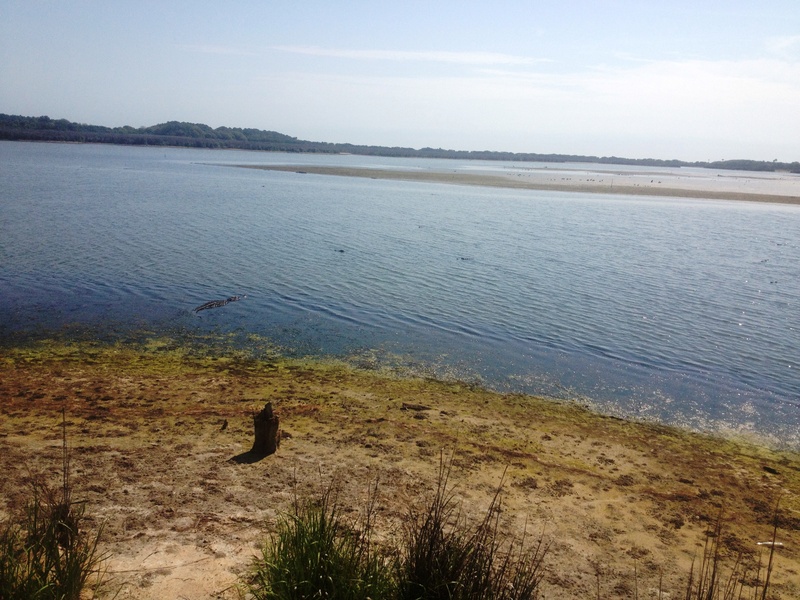 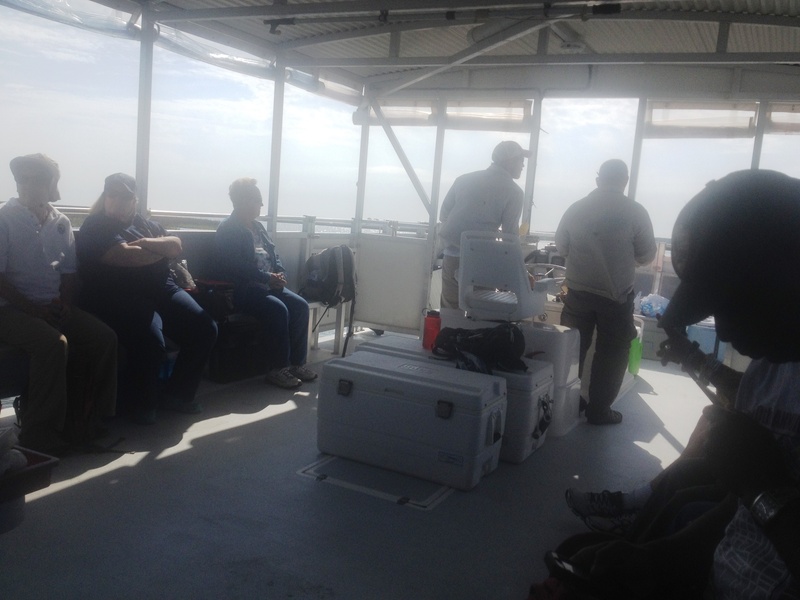 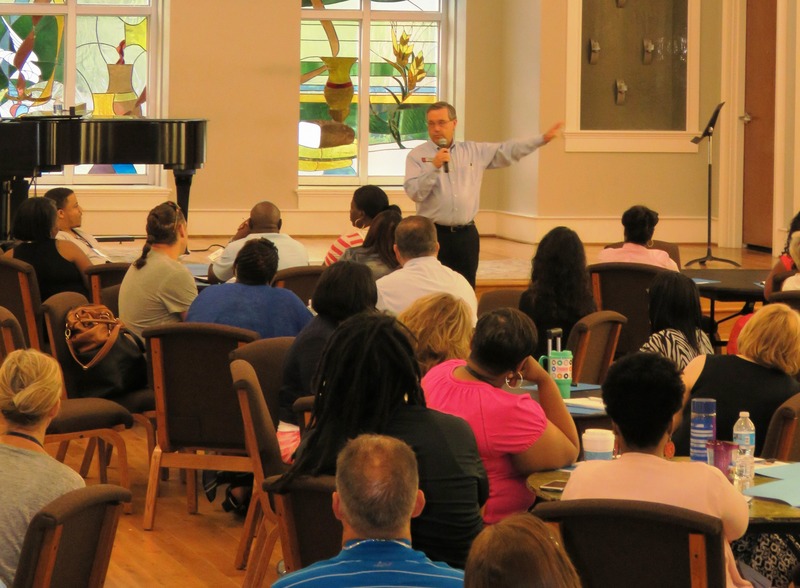 August 11, 2015 – Mt. 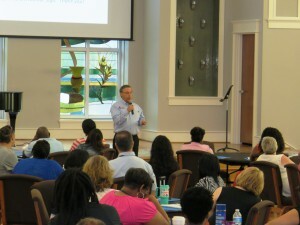 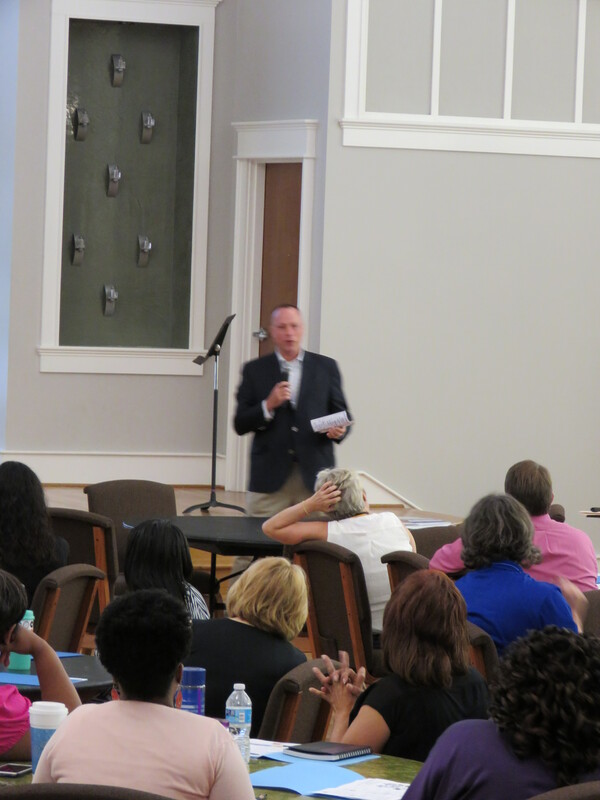 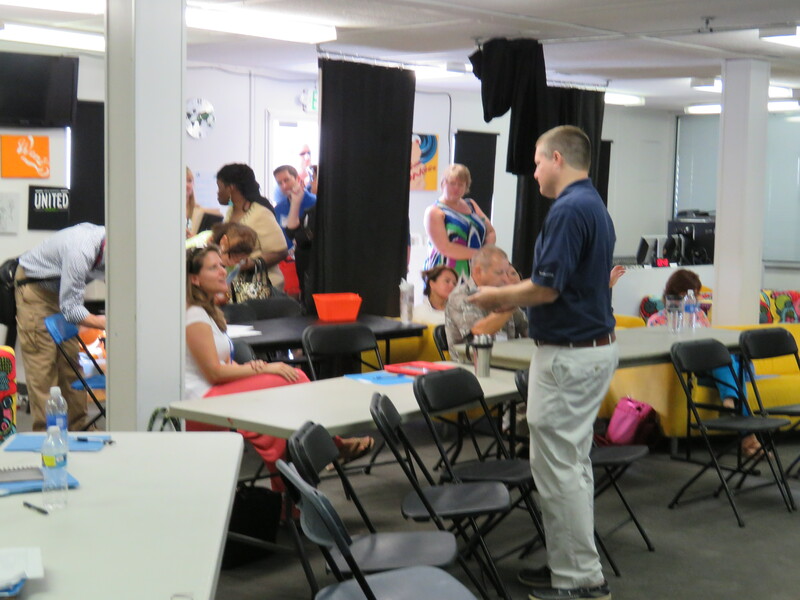 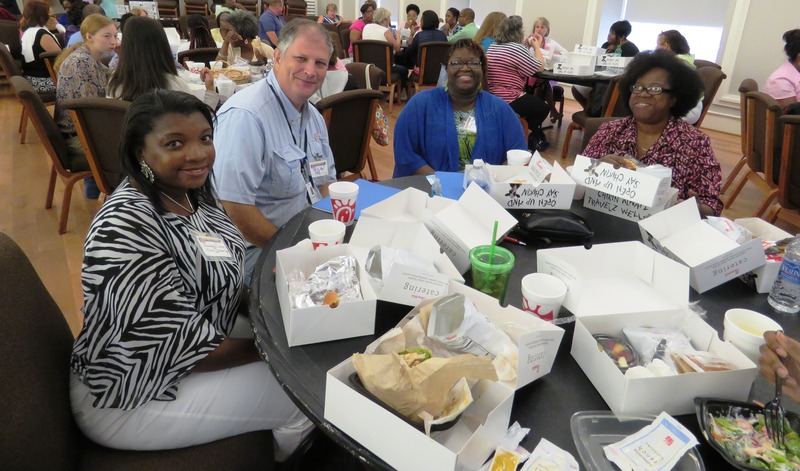 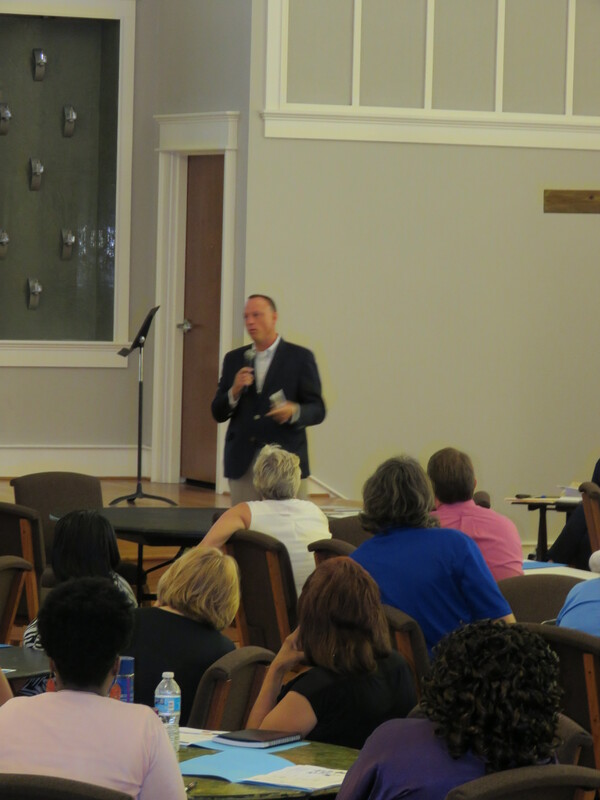 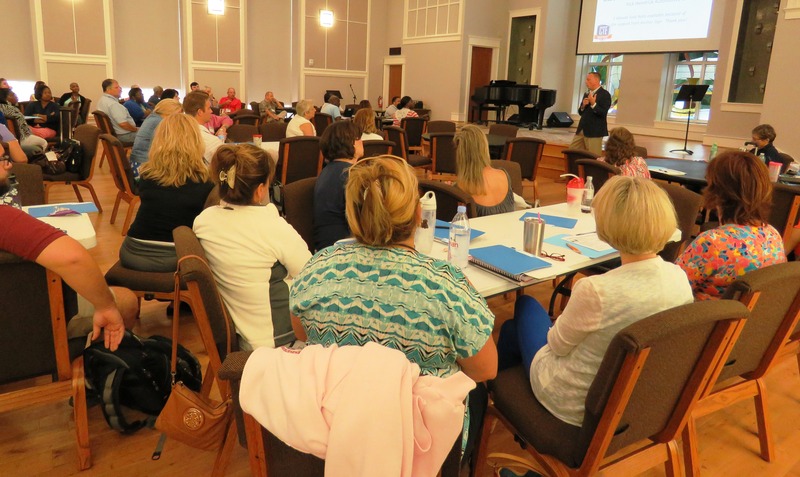 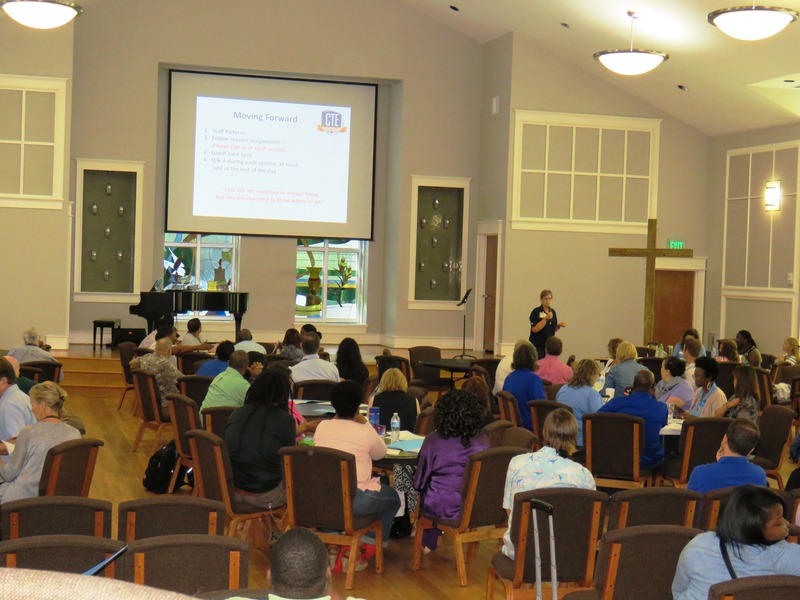 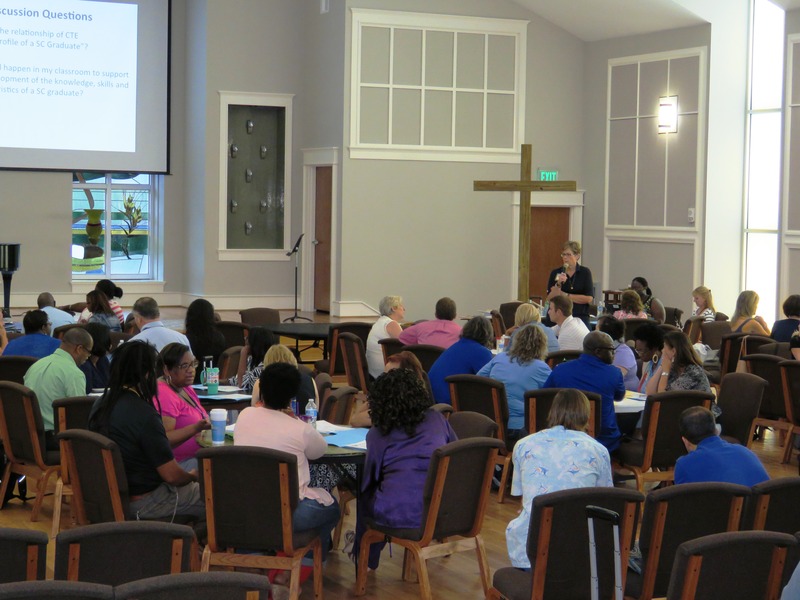 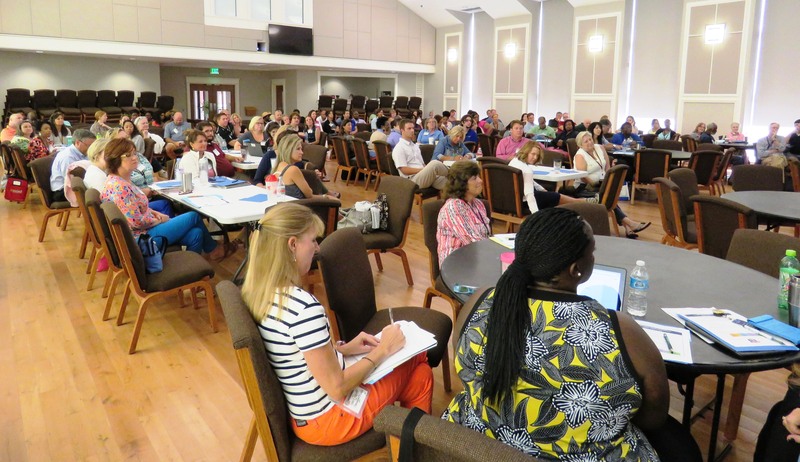 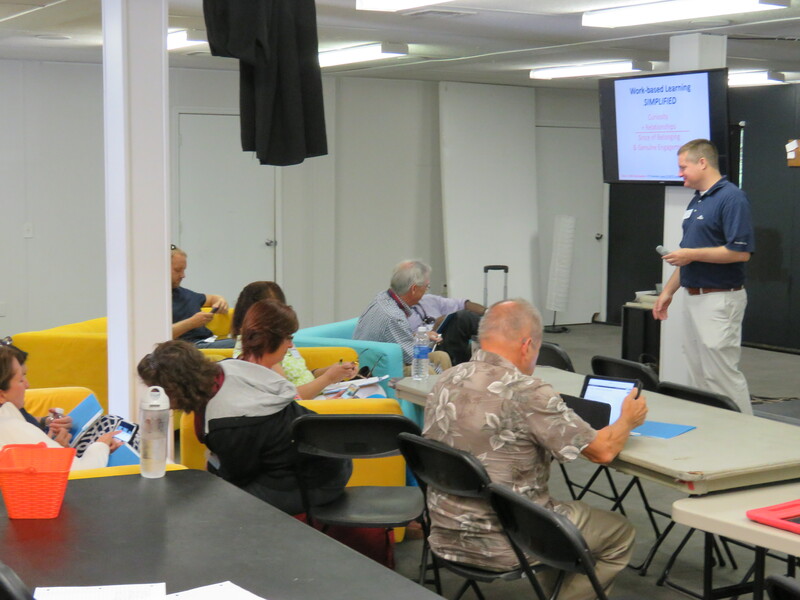 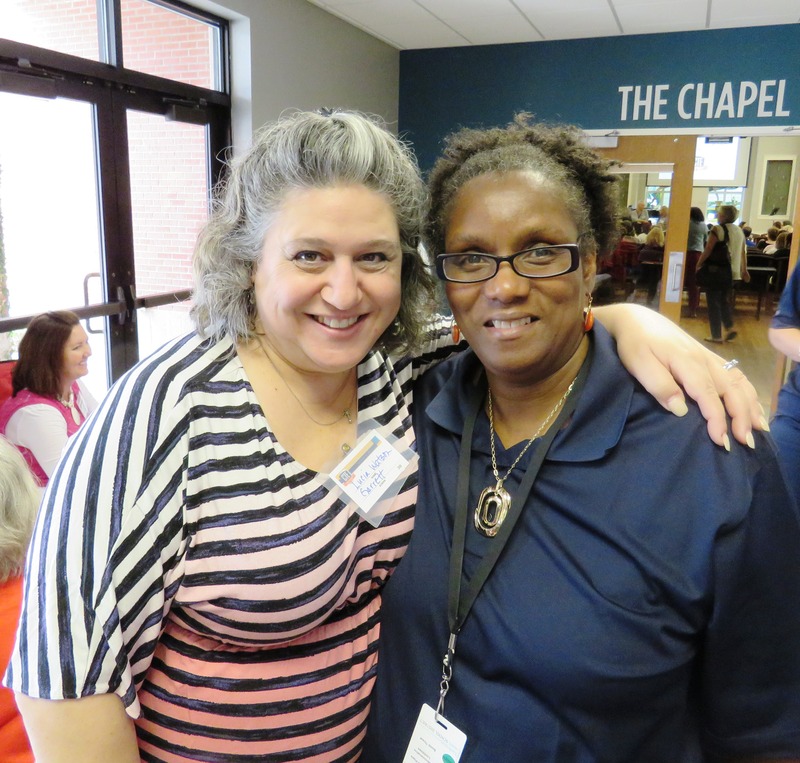 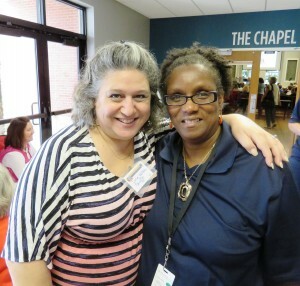 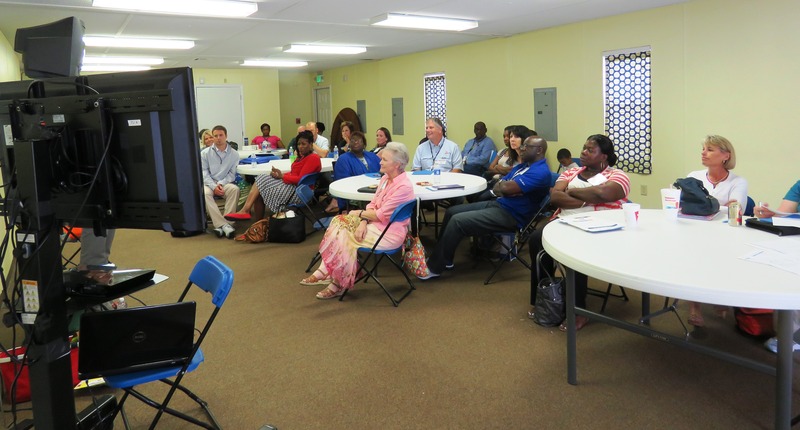 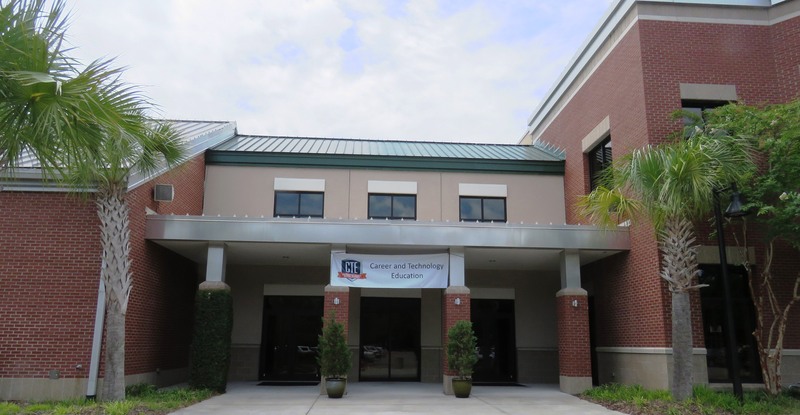 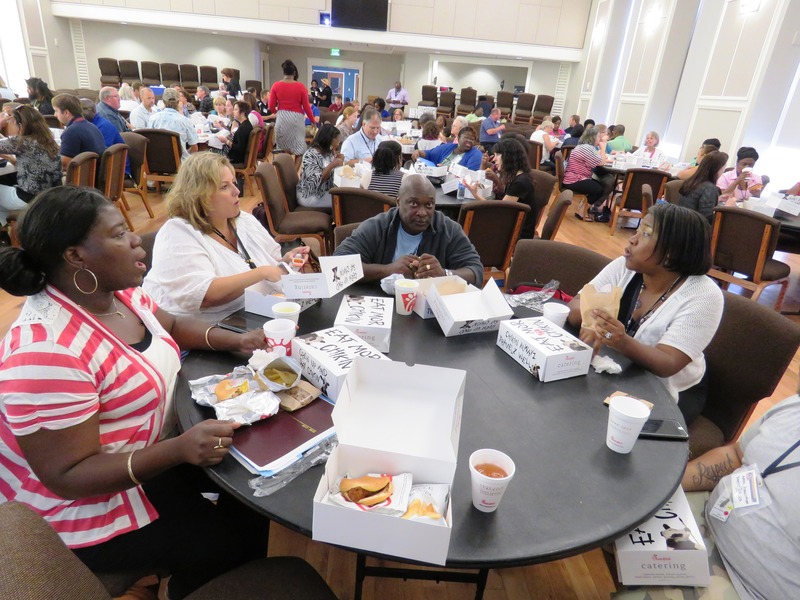 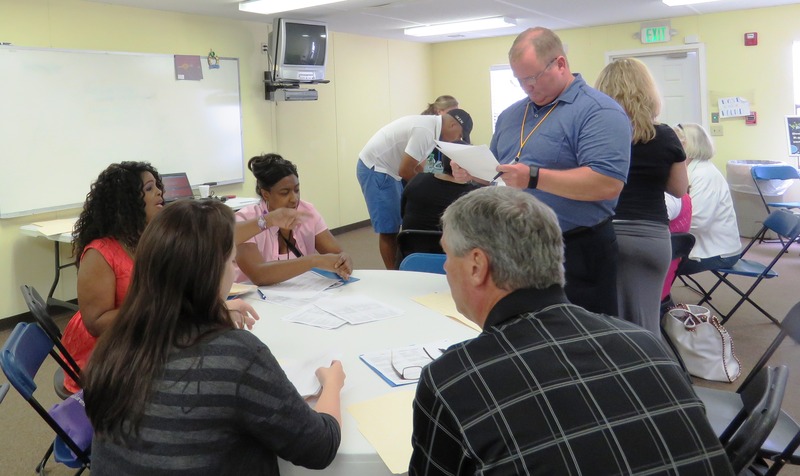 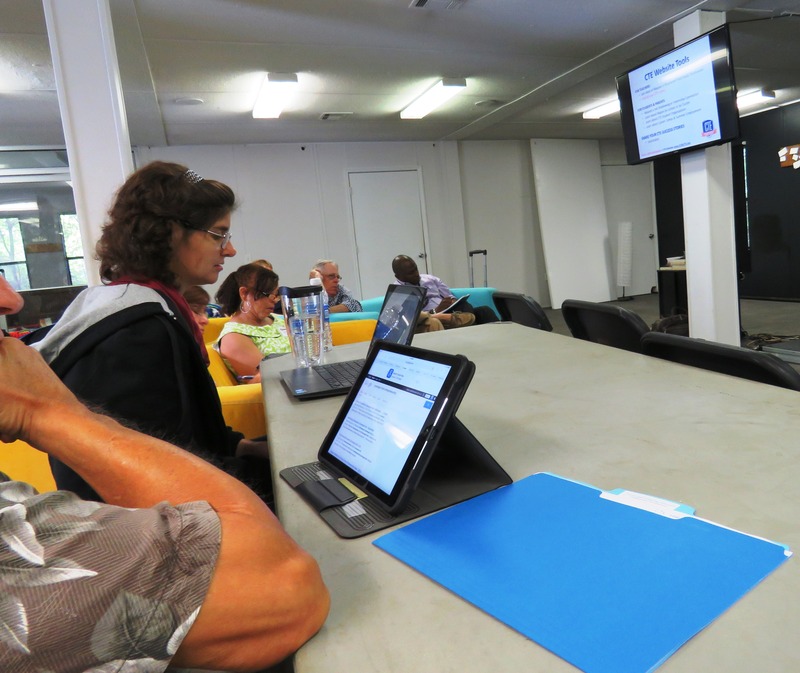 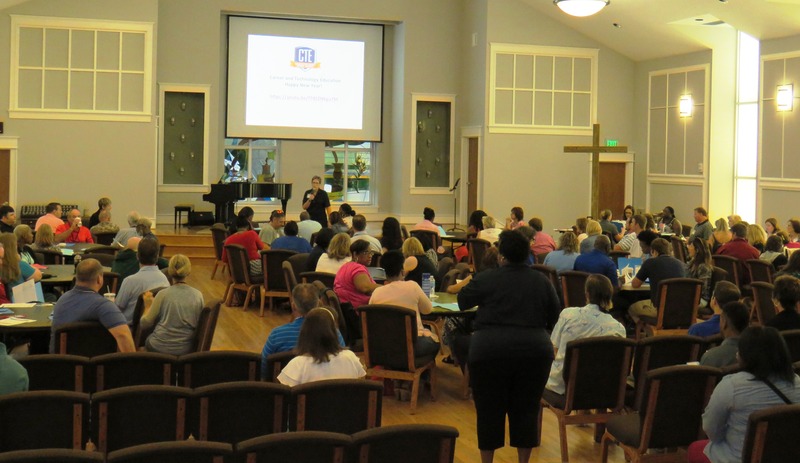 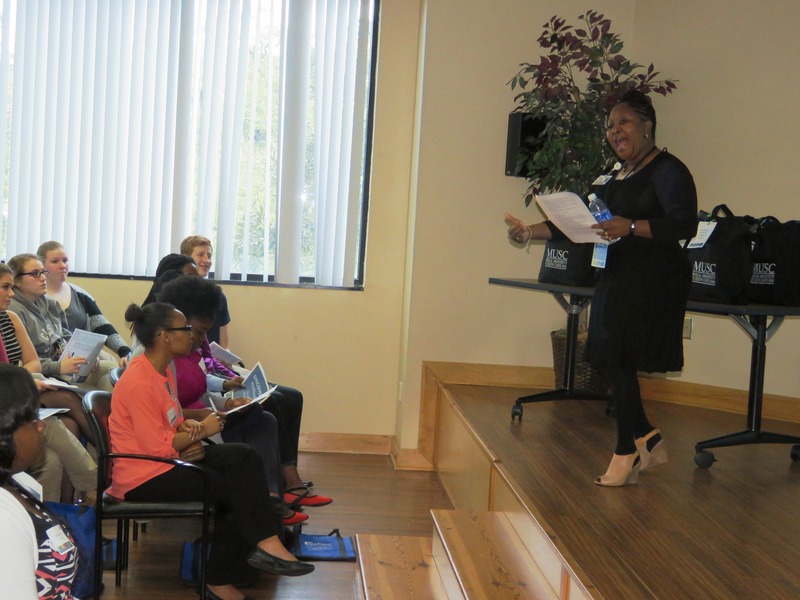 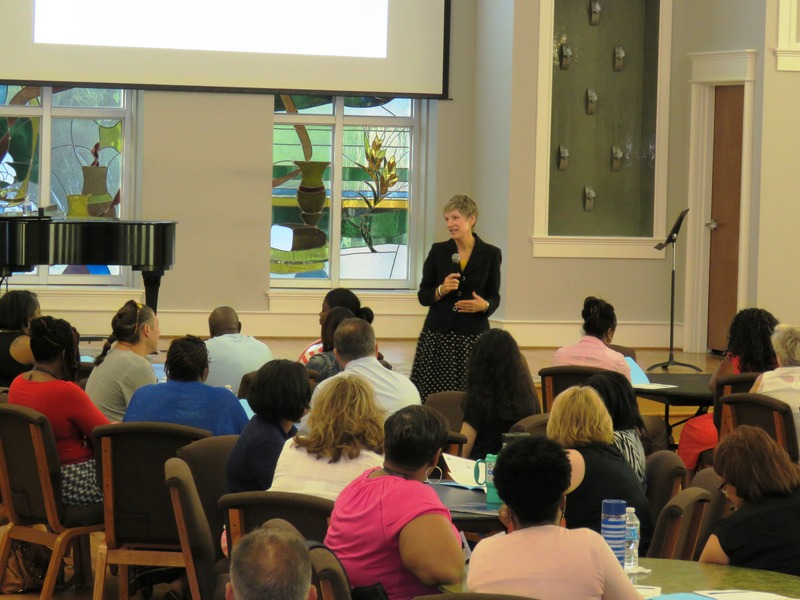 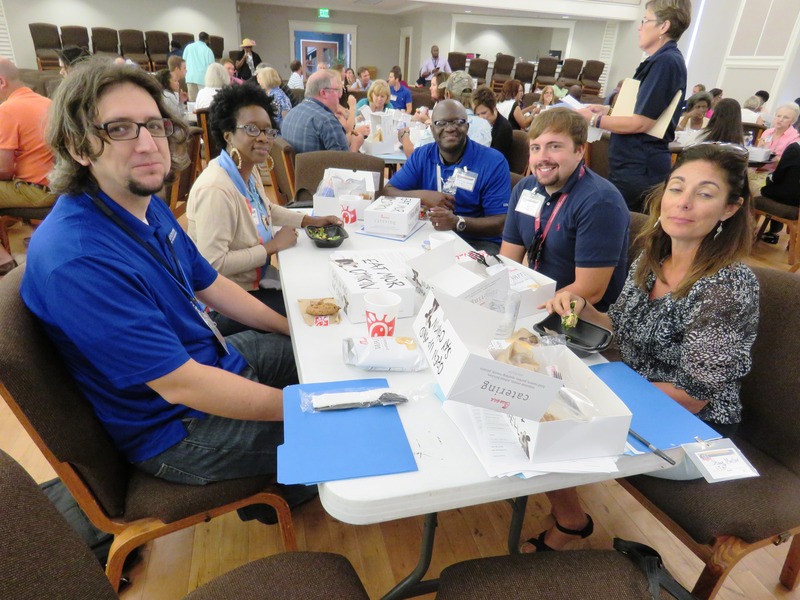 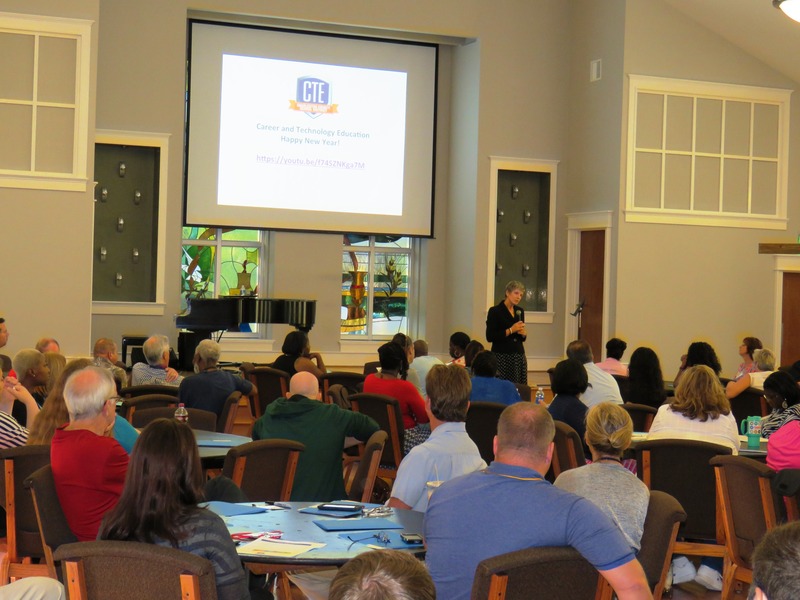 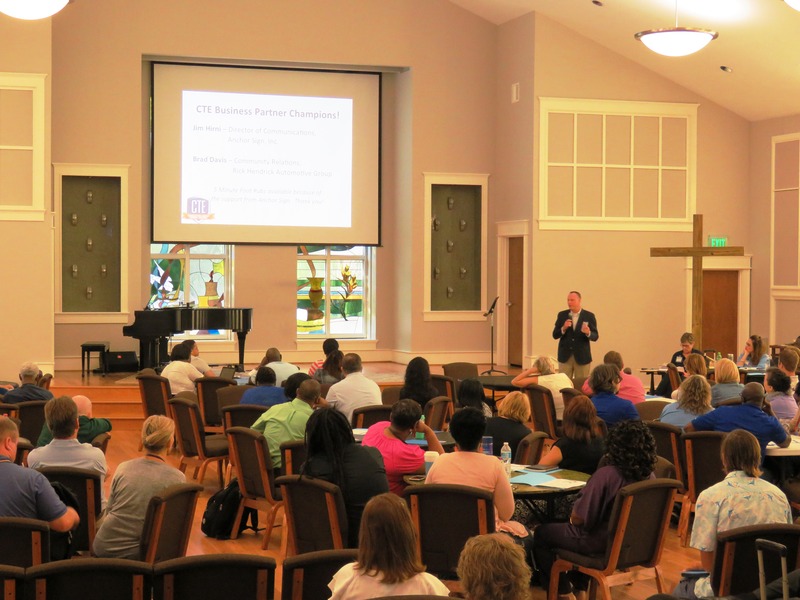 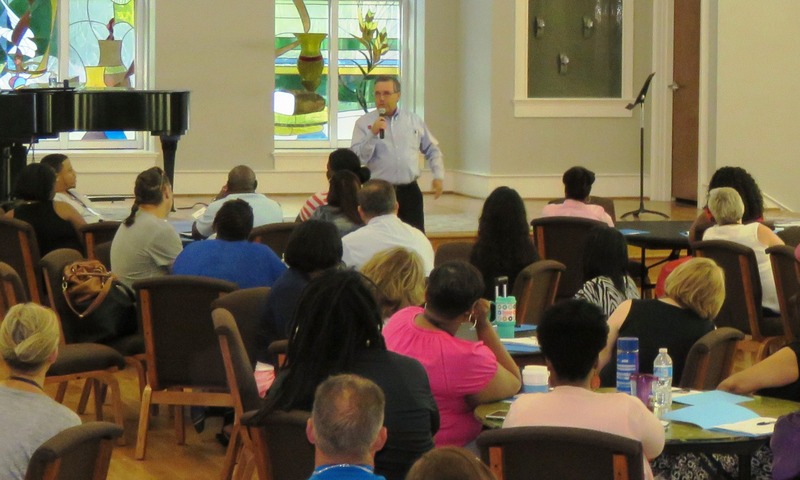 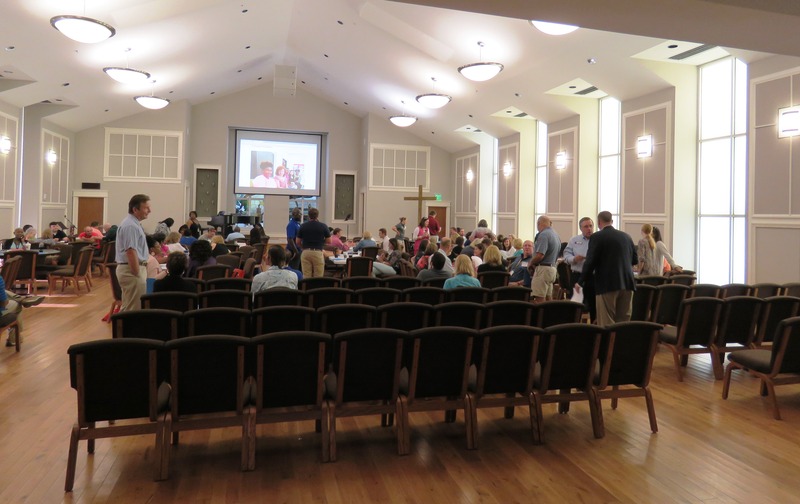 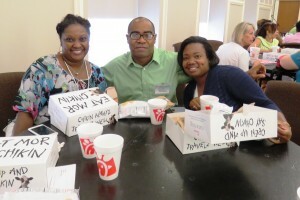 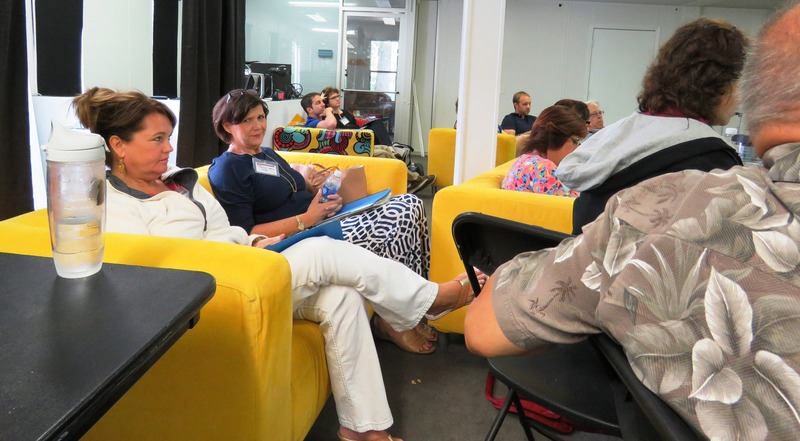 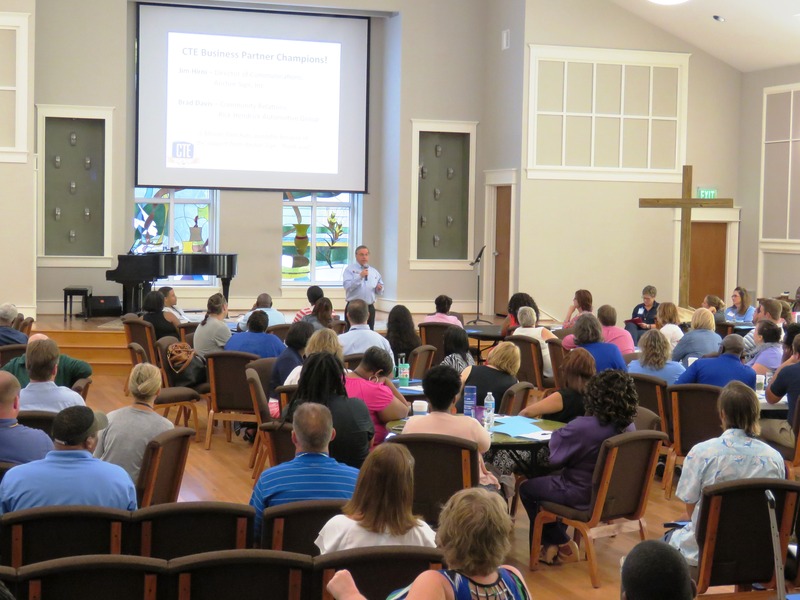 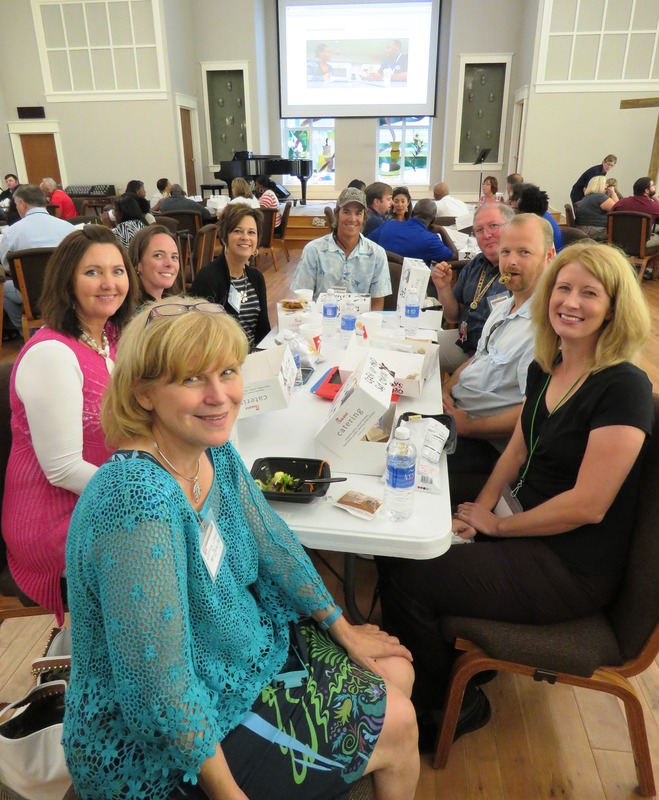 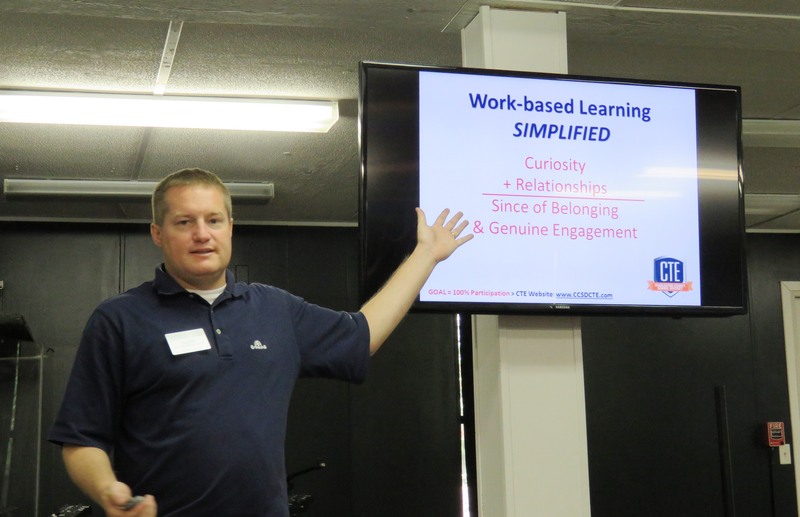 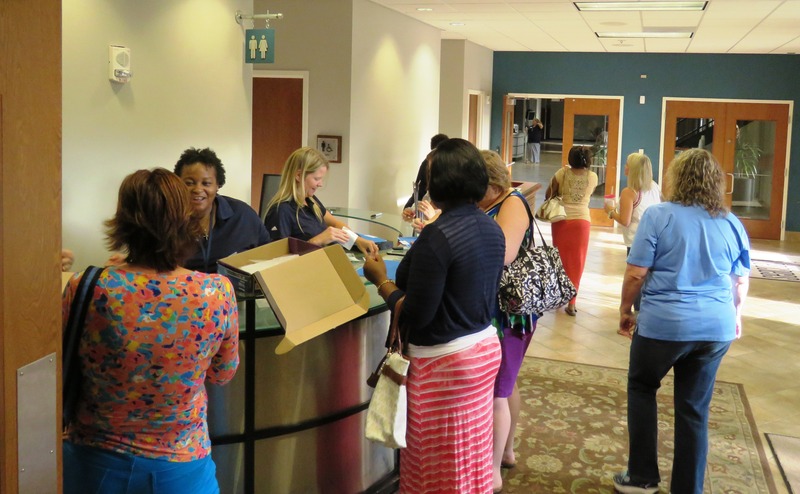 Pleasant, SC – Seacoast Church graciously provided the meeting space for the back to school professional development for CTE teachers on Tuesday. 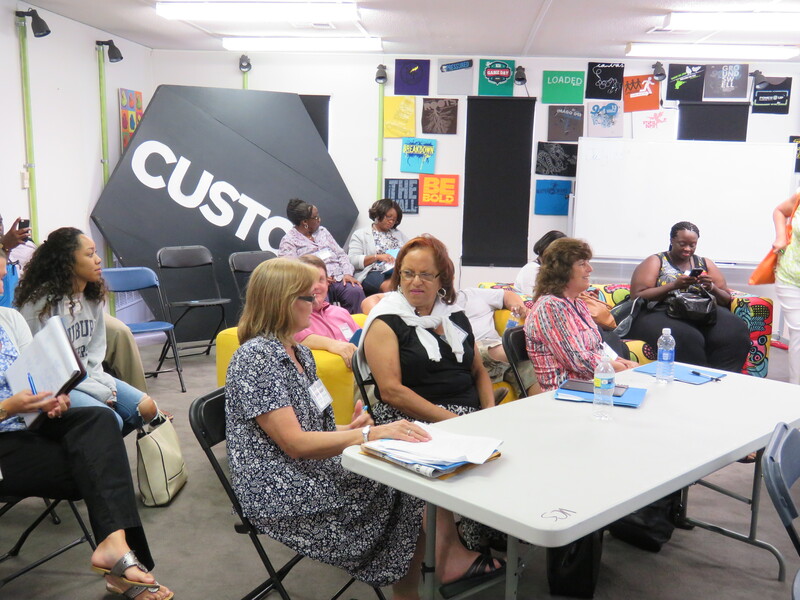 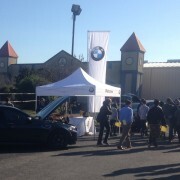 With ample parking, a large space with tables and chairs provided, and plenty of rooms for break-out sessions, the location was ideal. 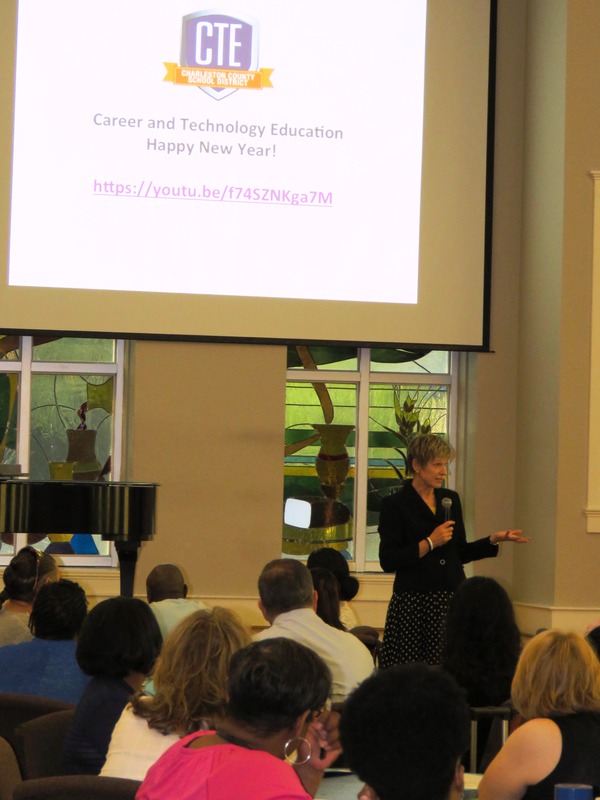 The day began with a keynote speech from new CCSD Superintendent Dr. Gerrita Postlewait. 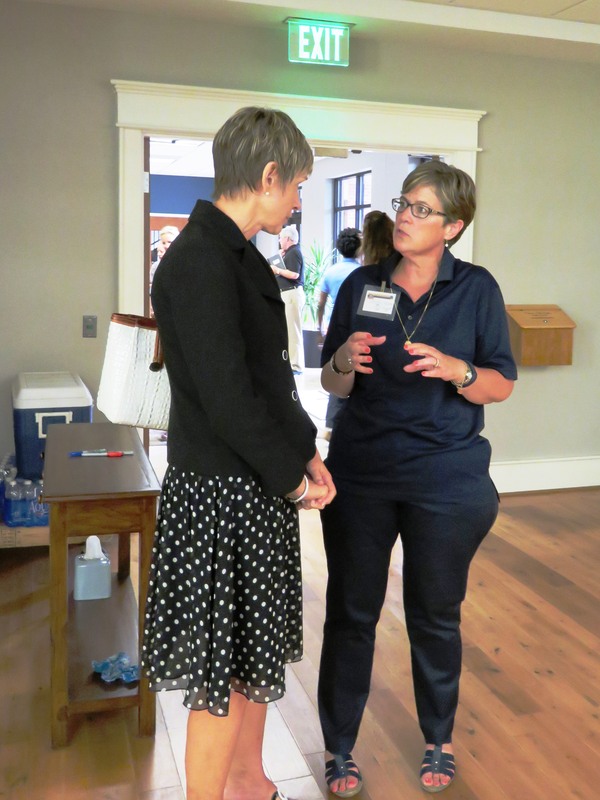 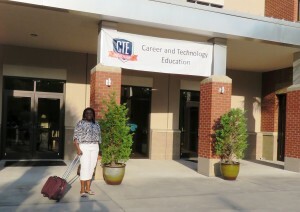 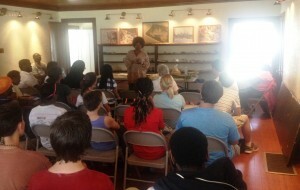 She shared her passion for Career and Technology Education and answered a number of questions from teachers. 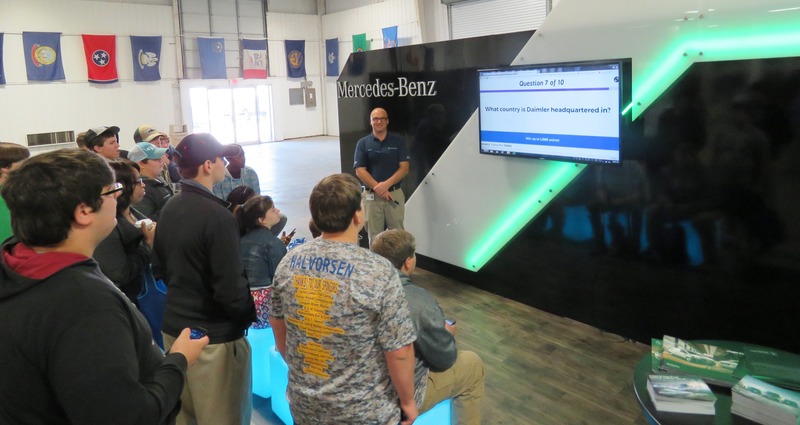 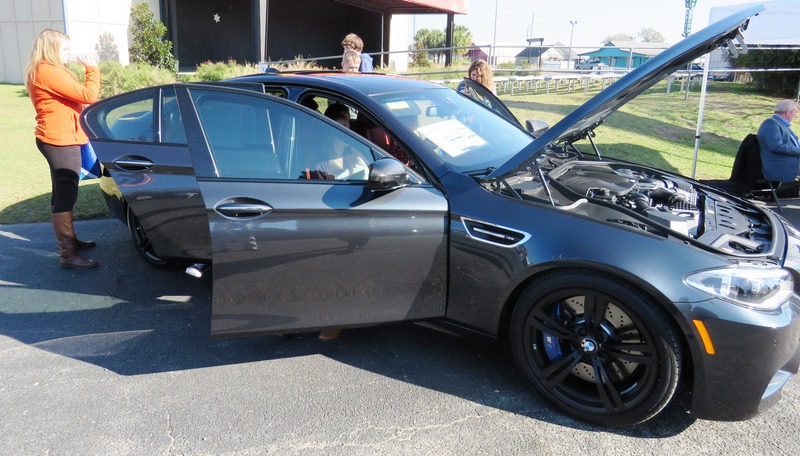 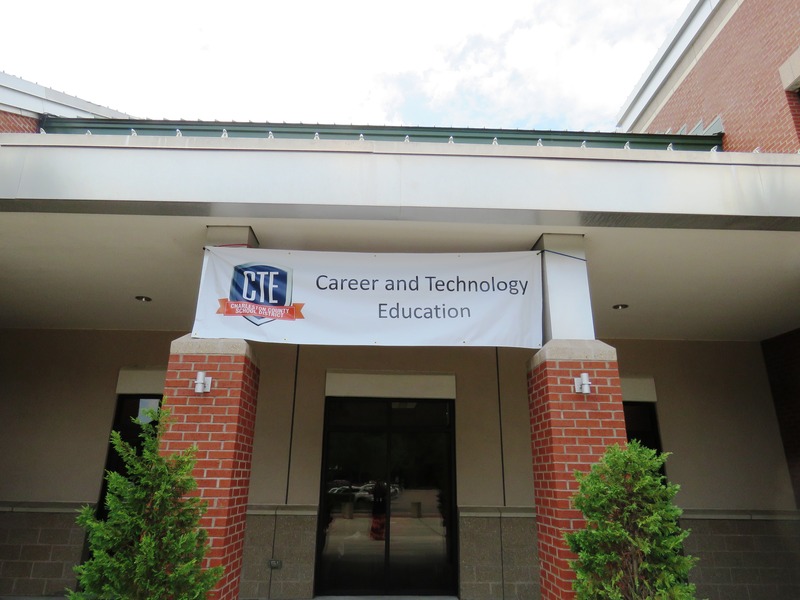 Two local business partners also shared their support for CTE teachers – Brad Davis with Rick Hendrick Automotive Group and Jim Hirni with Anchor Sign company. 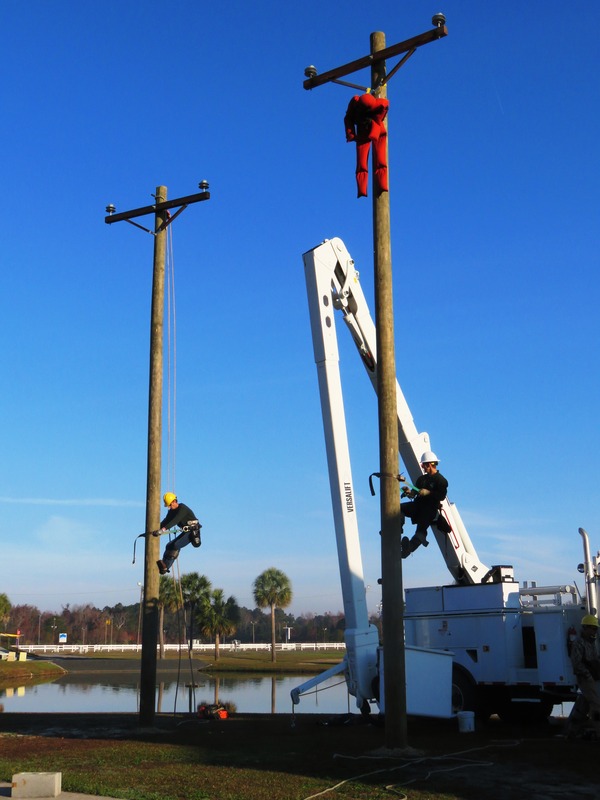 Both professionals talked about their company’s critical workforce needs and offered to assist as needed to ensure students are ready to maximize the wonderful career opportunities available in the Charleston region. 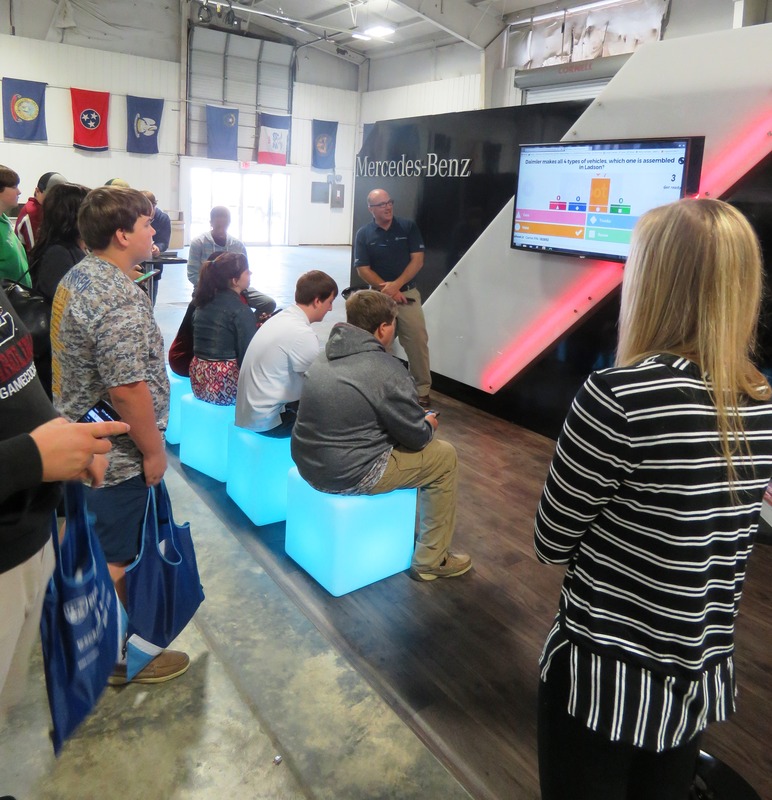 After the morning plenary session, teachers cycled through 4 breakout rooms with presentations from the CTE Support Team members on CTE Data, Work-based Learning, Student Learning Objective plans, and many other important topics. 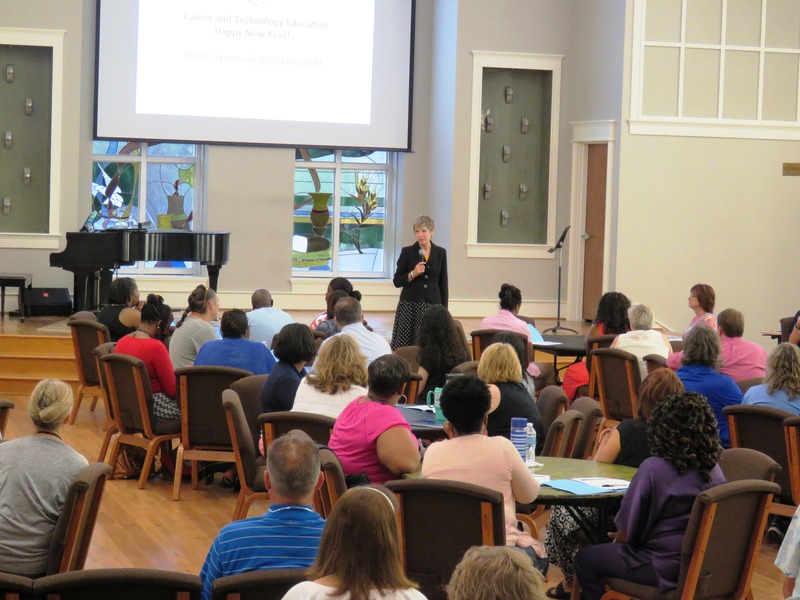 CTE Director Ginger Reijners’ session was an overall update on the factors that will impact CTE this academic year. 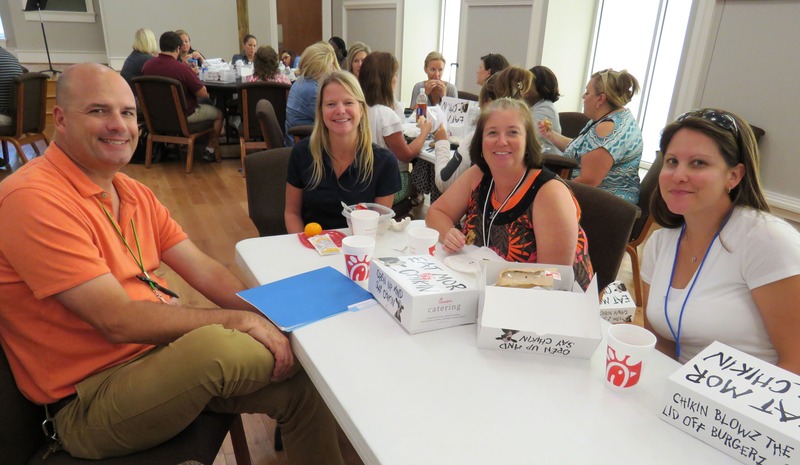 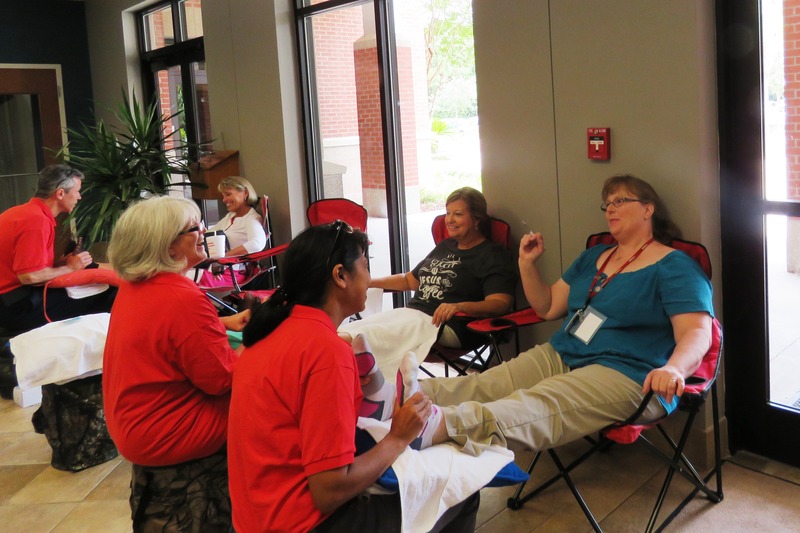 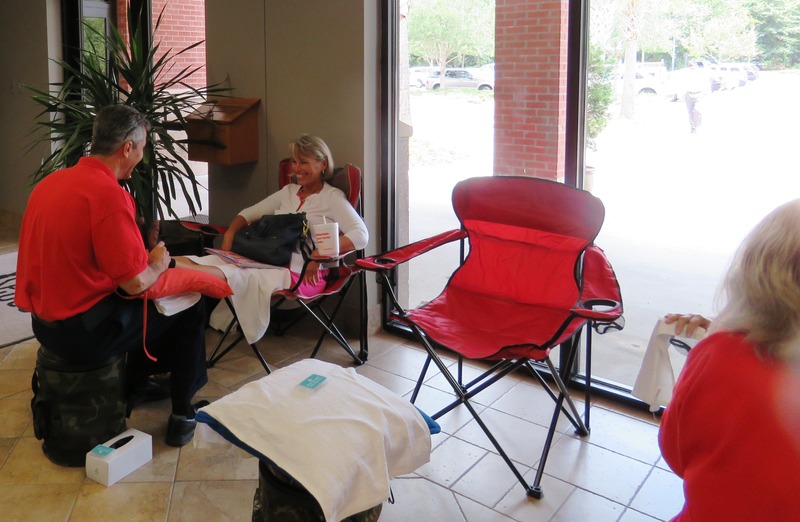 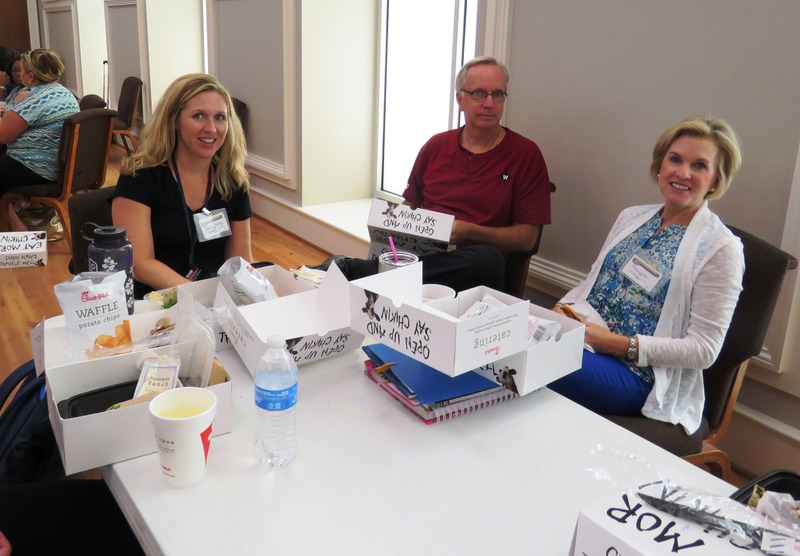 Teachers enjoyed round table discussions over lunch from Chic-fil-A and wear treated to 5 Minute Foot Rubs thanks to the generous support of Anchor Sign! 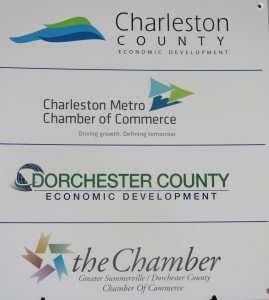 After lunch, Robin Willis from the Charleston Metro Chamber of Commerce shared a presentation on the continued growth of our community. 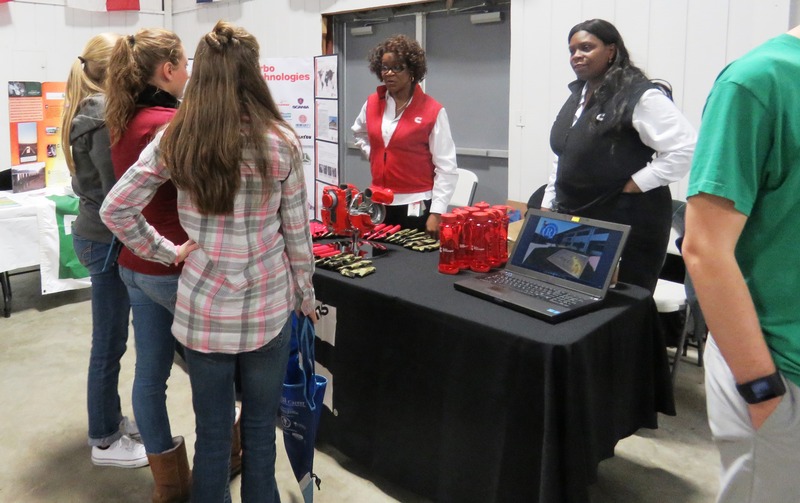 She also talked about the Youth Apprenticeship program the chamber is supporting along with Trident Technical College, all 4 local school districts, and over 60 industry partners. 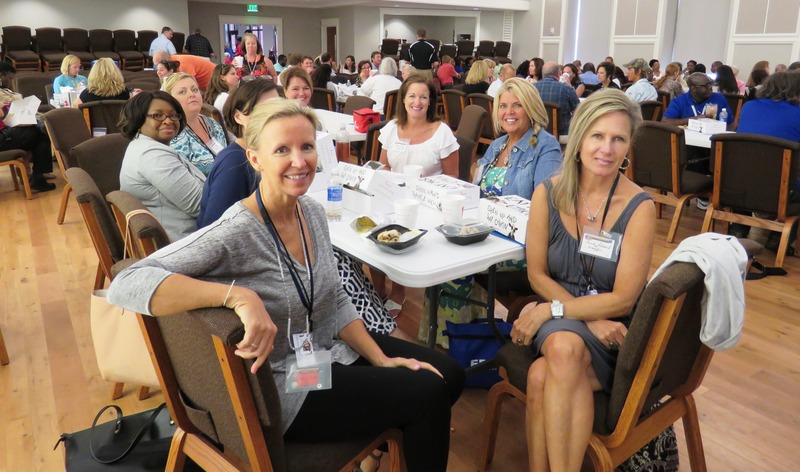 At the end of the very productive professional development day, several teachers names were drawn for prizes – one teacher won a dinner for two at The Charleston Grill and another won a trip to the ACTE Conference in New Orleans in November! 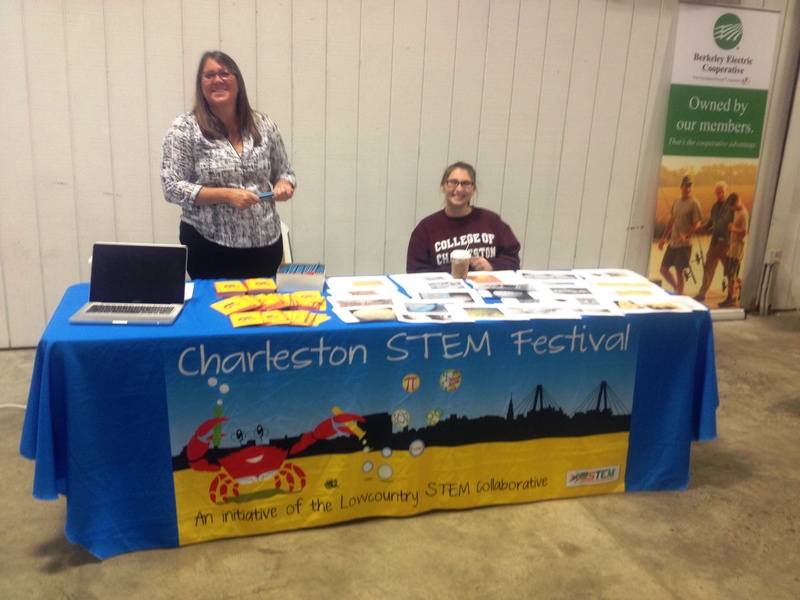 Other teachers won tickets to Charleston Battery Soccer matches at MUSC Health Stadium on Daniel Island. 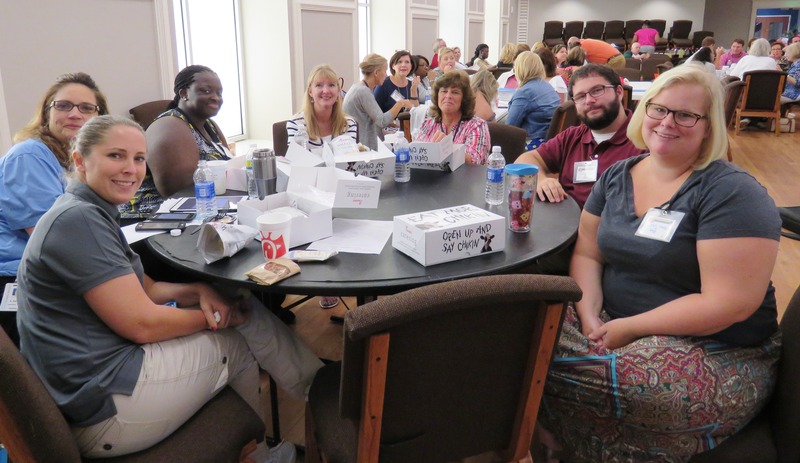 Special thanks to Mickey Bakst with The Charleston Grill and Suzanne Brandon with the Charleston Battery for donating prizes for teachers attending the meeting! 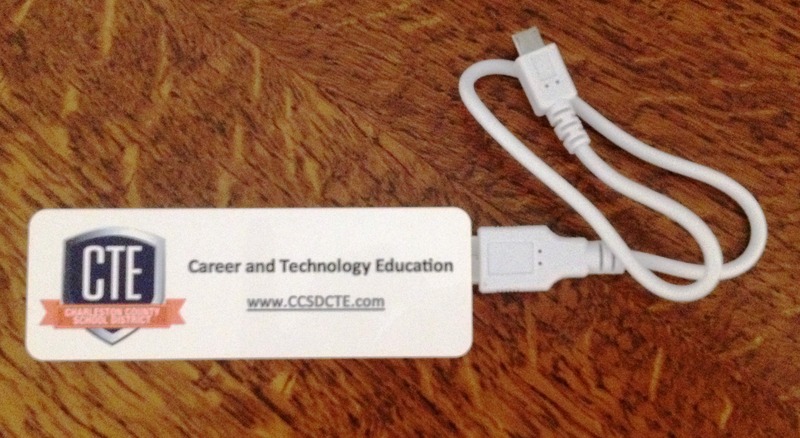 All teachers left with a special gift: a special back-up battery for their phone! 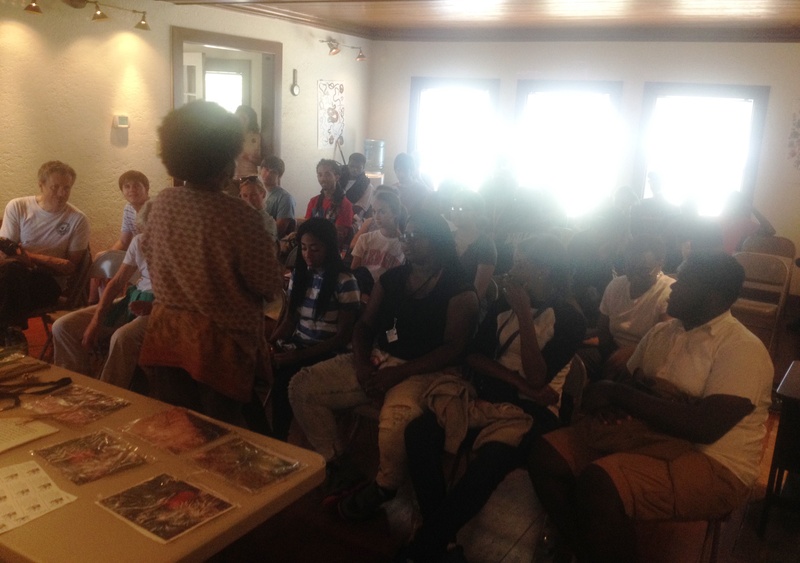 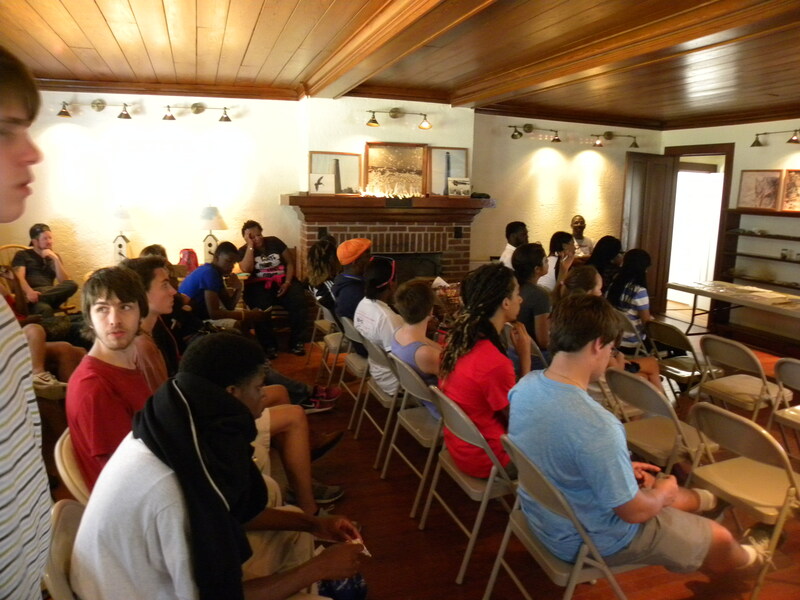 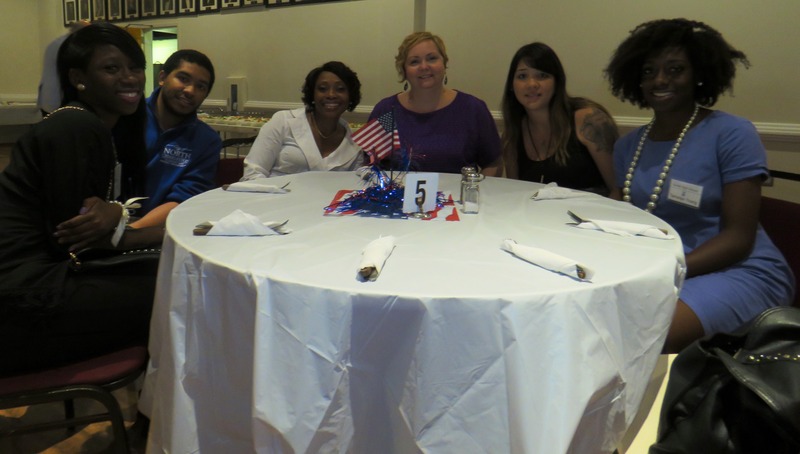 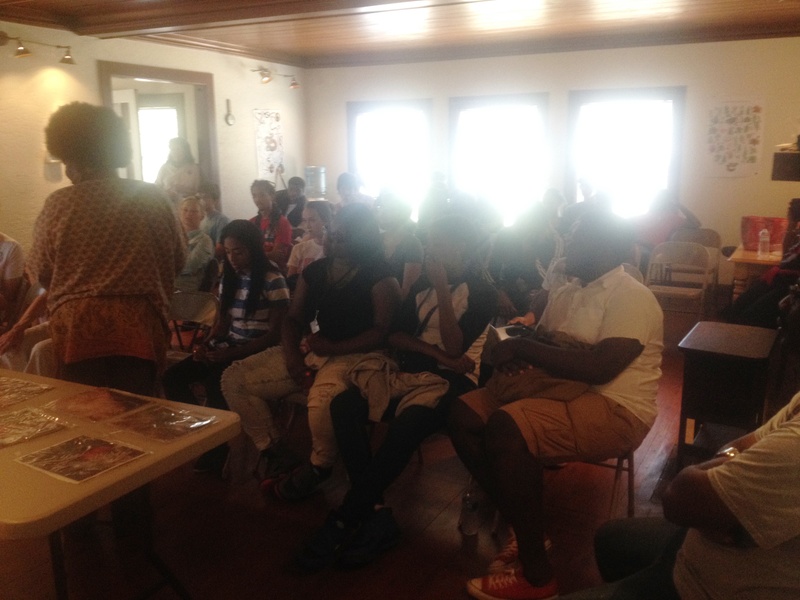 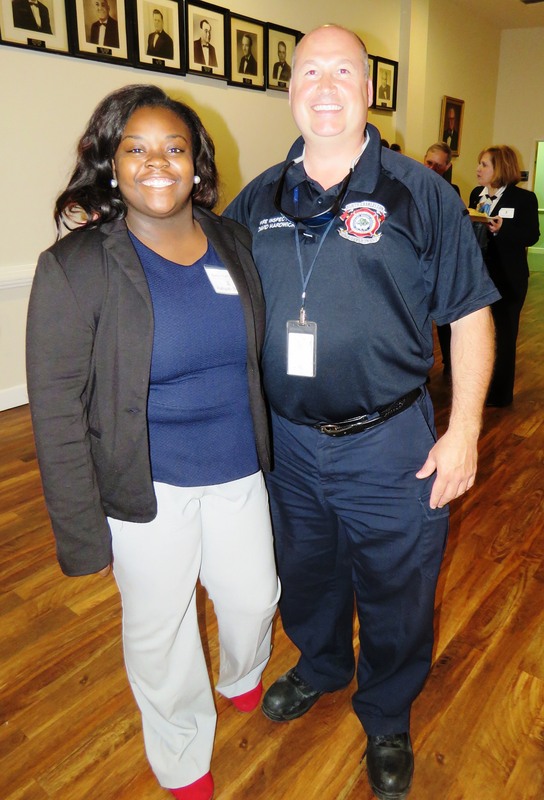 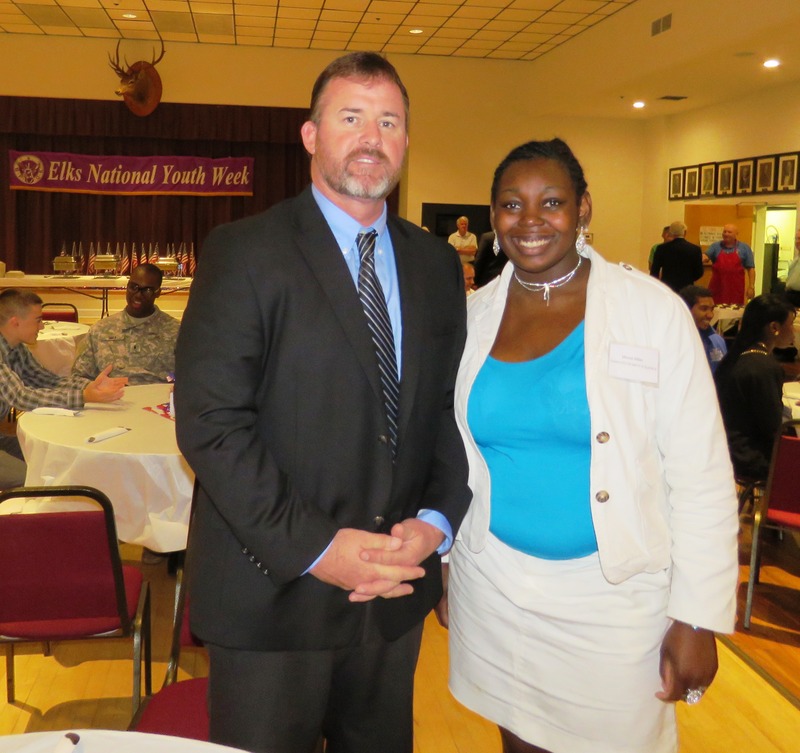 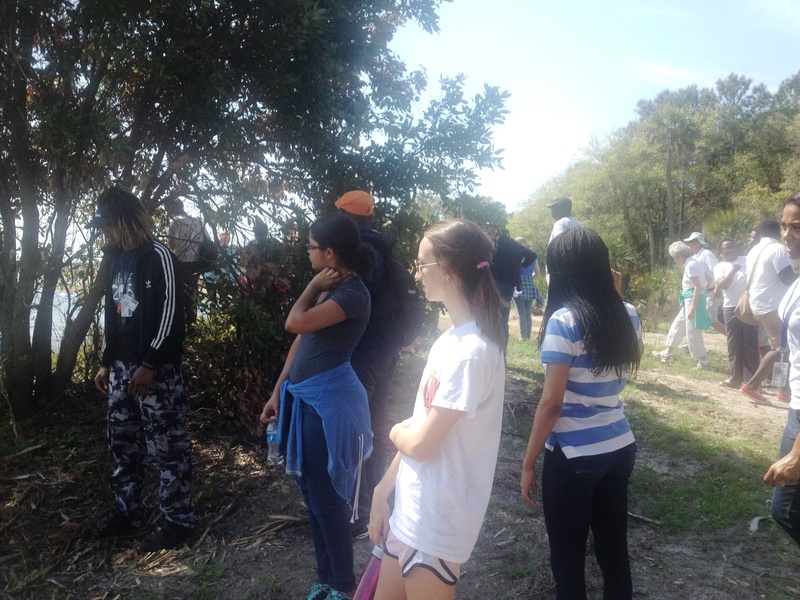 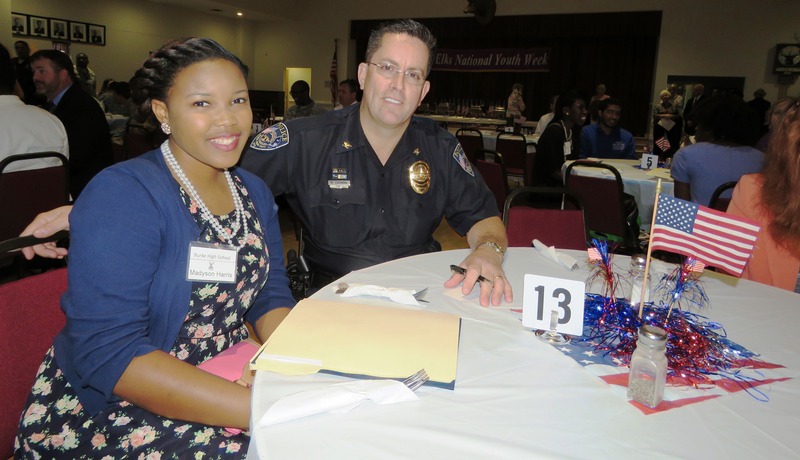 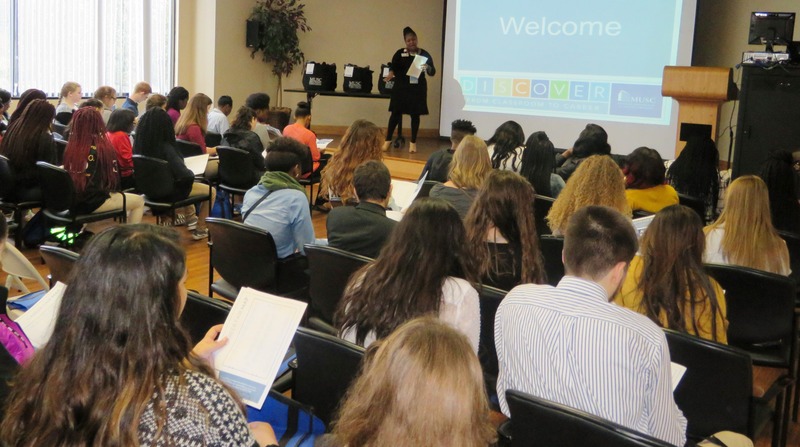 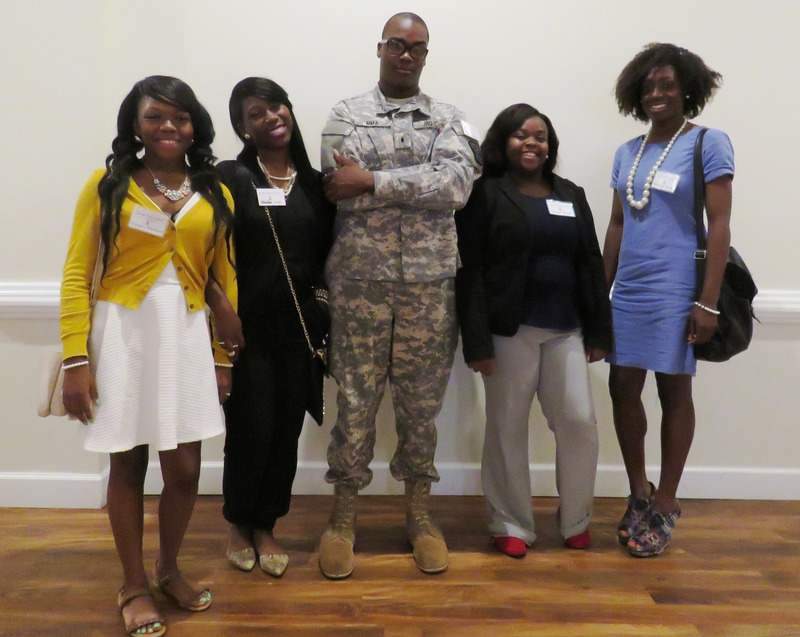 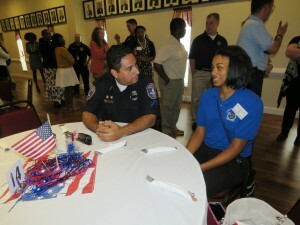 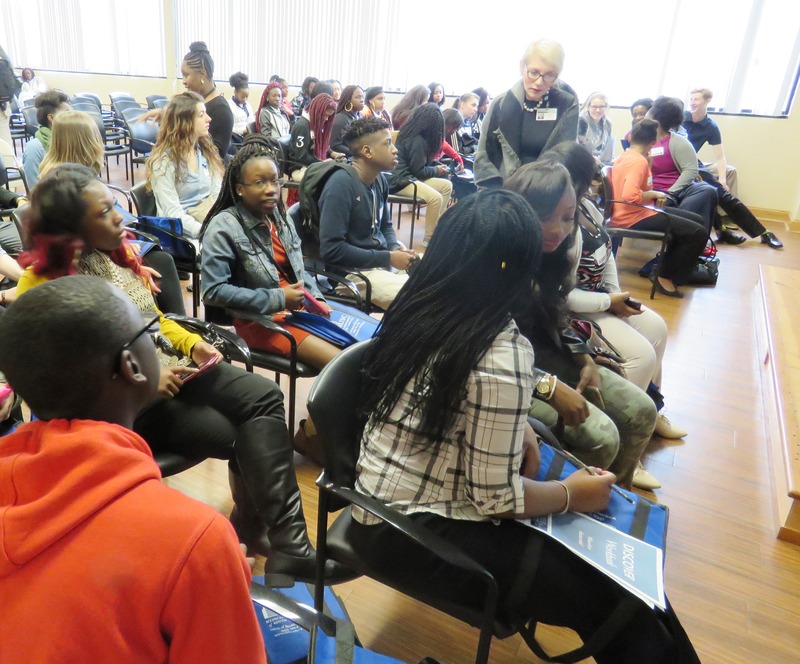 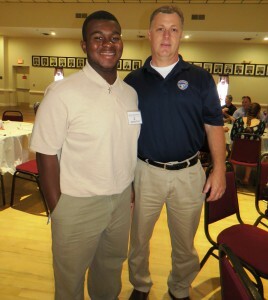 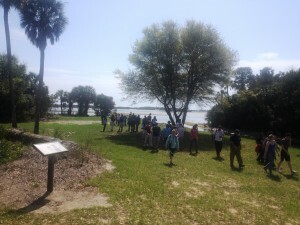 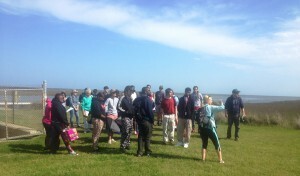 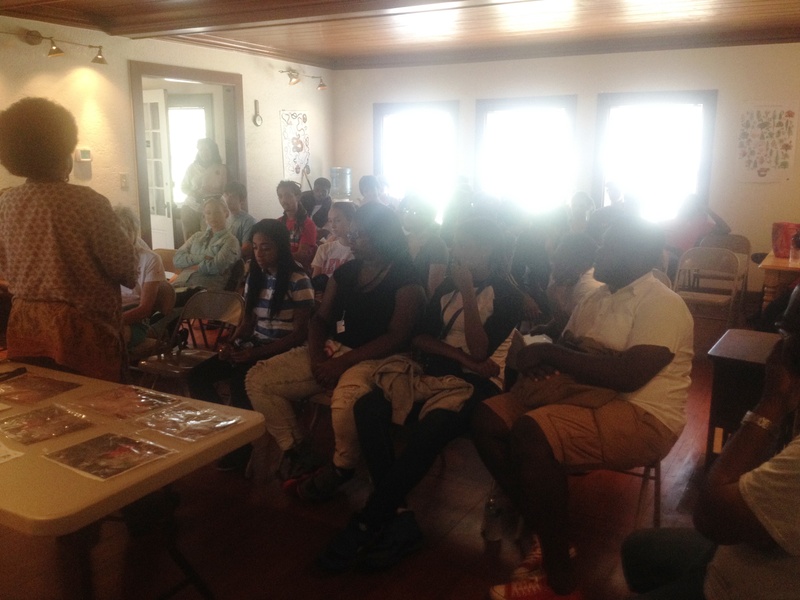 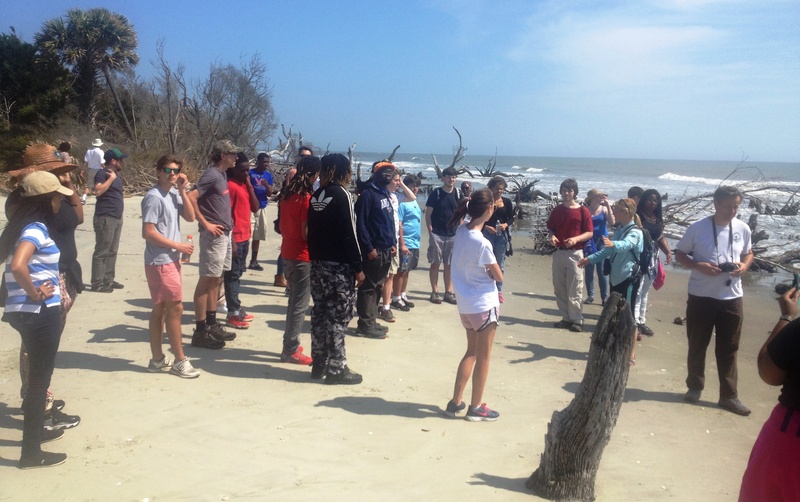 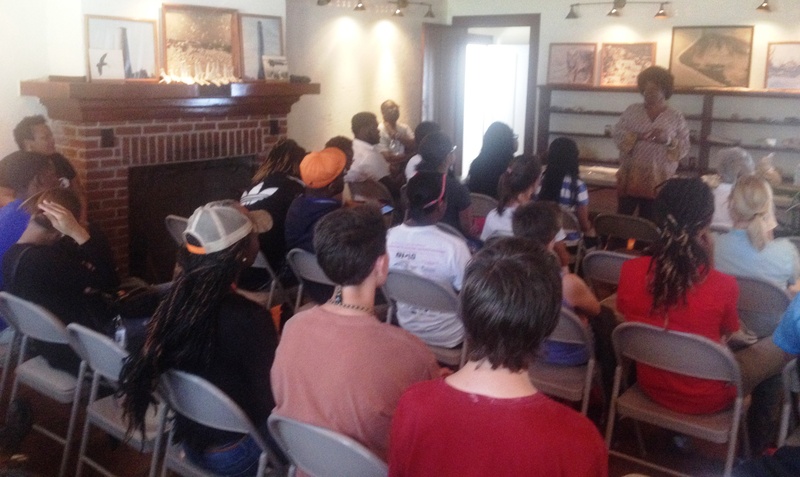 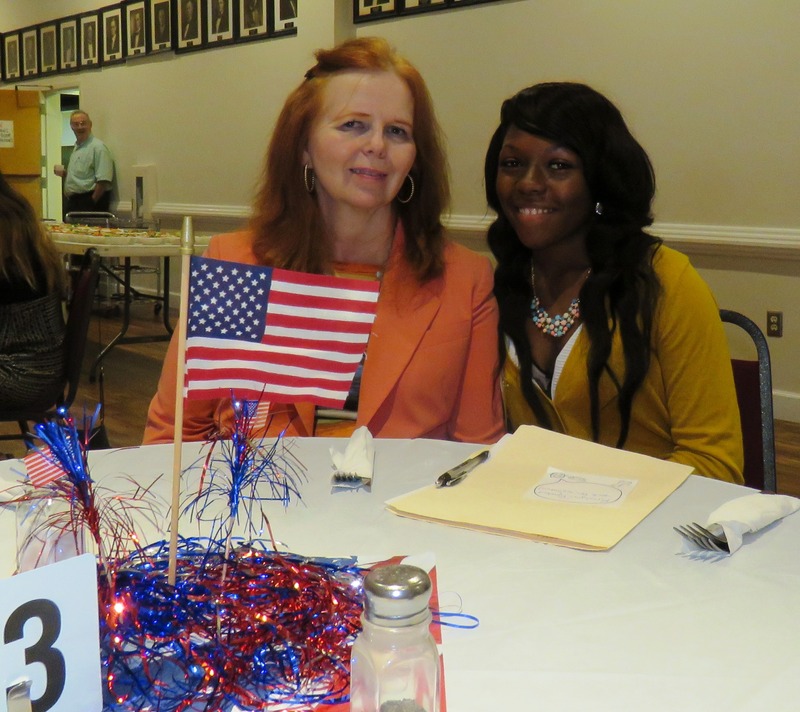 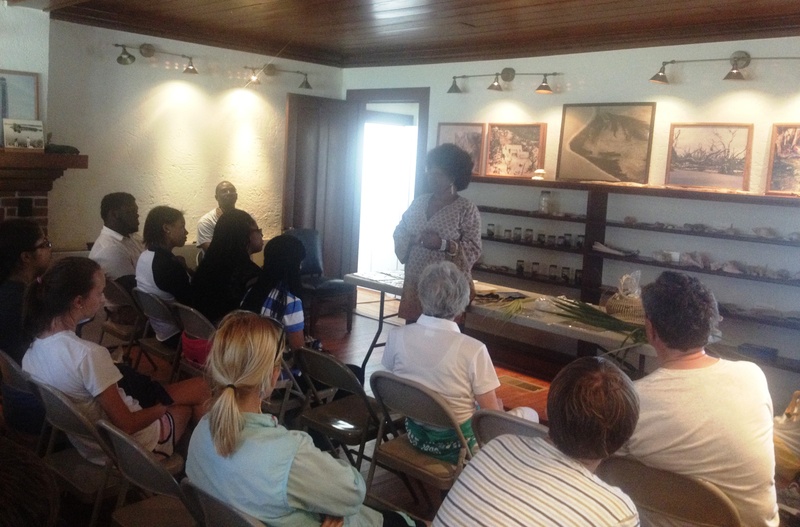 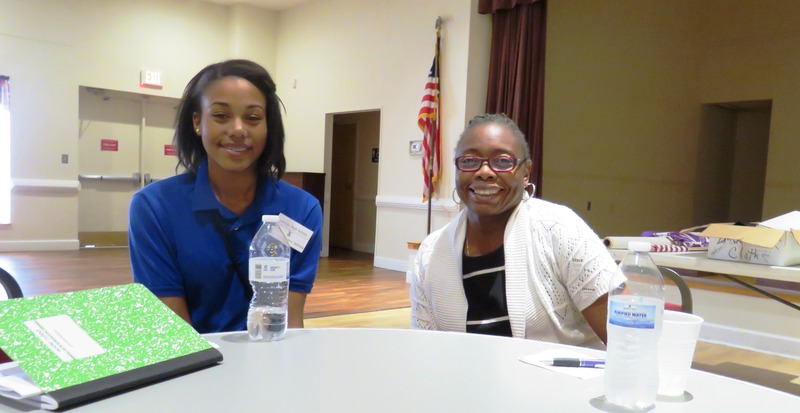 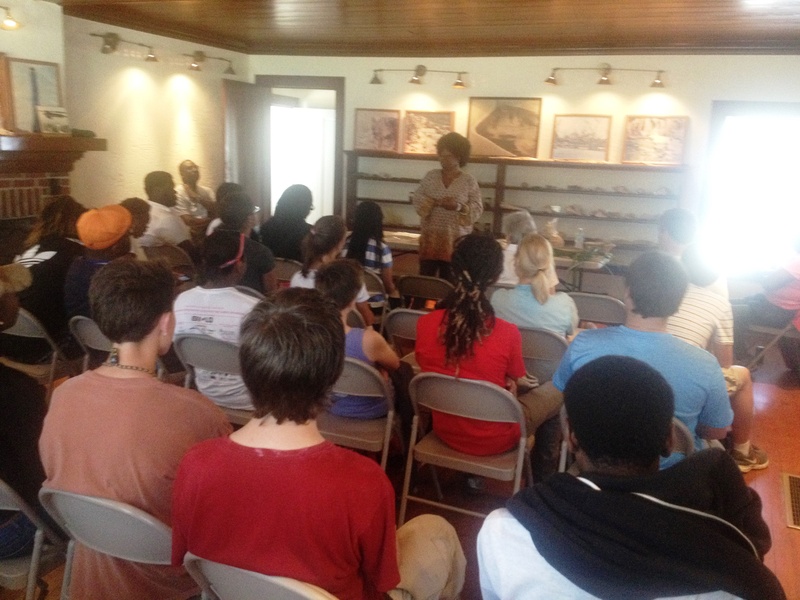 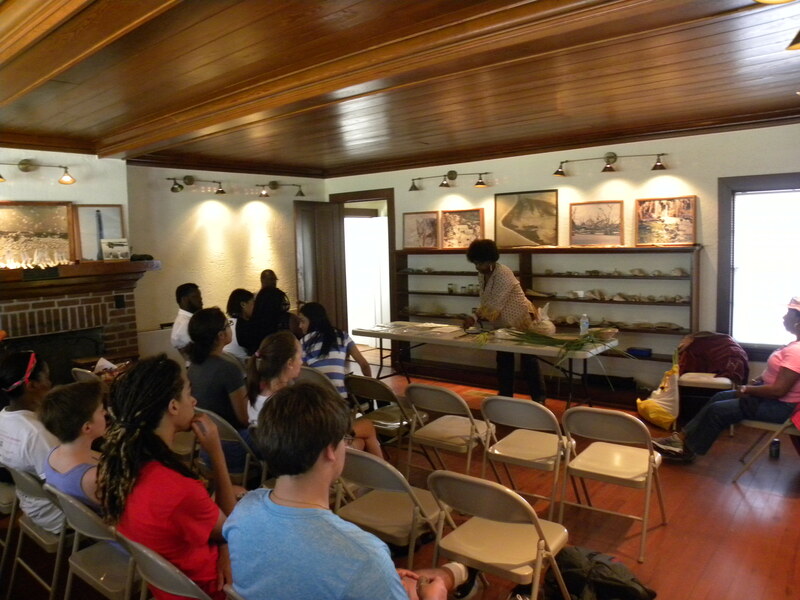 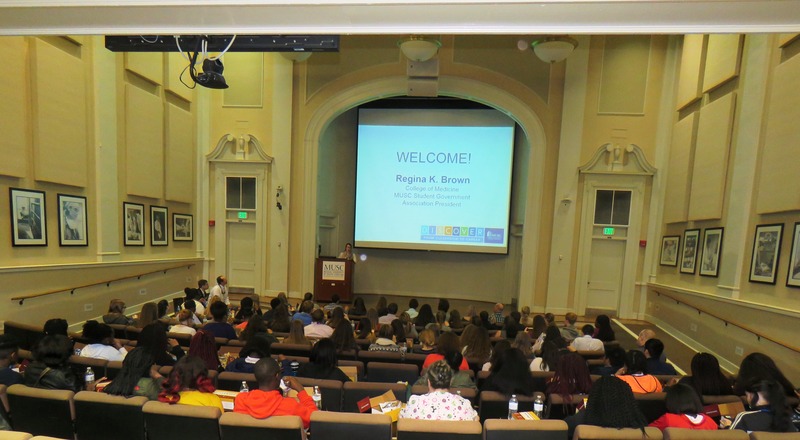 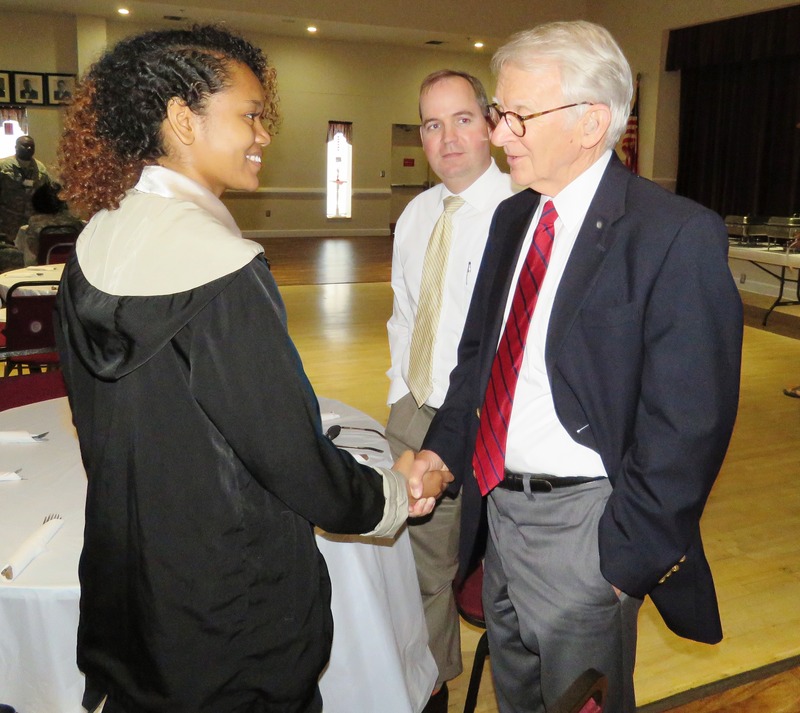 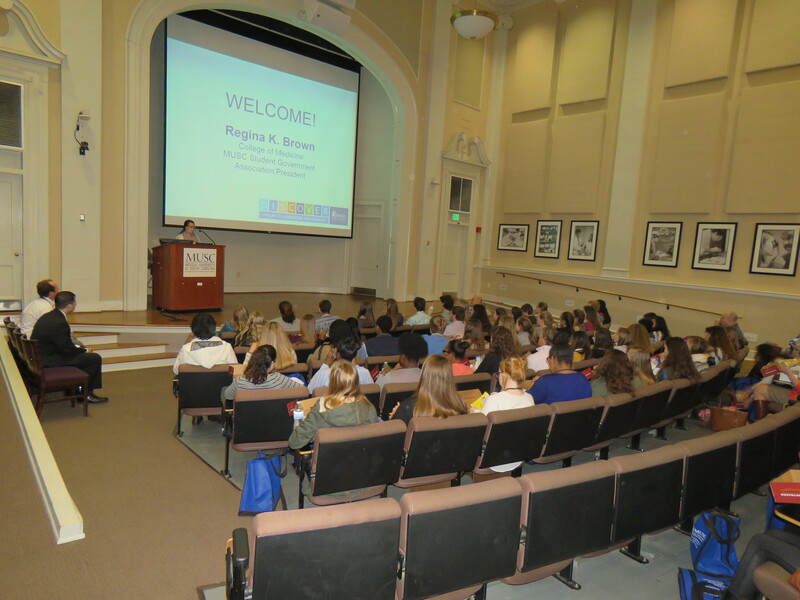 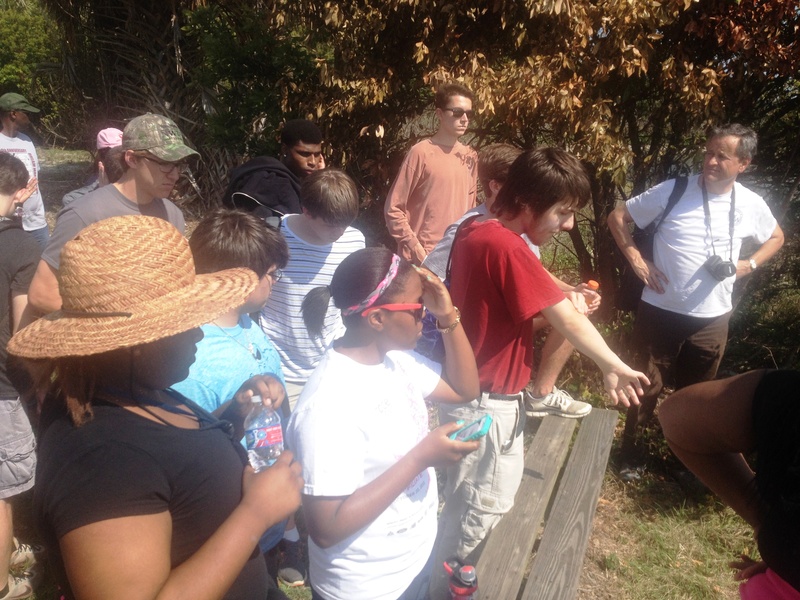 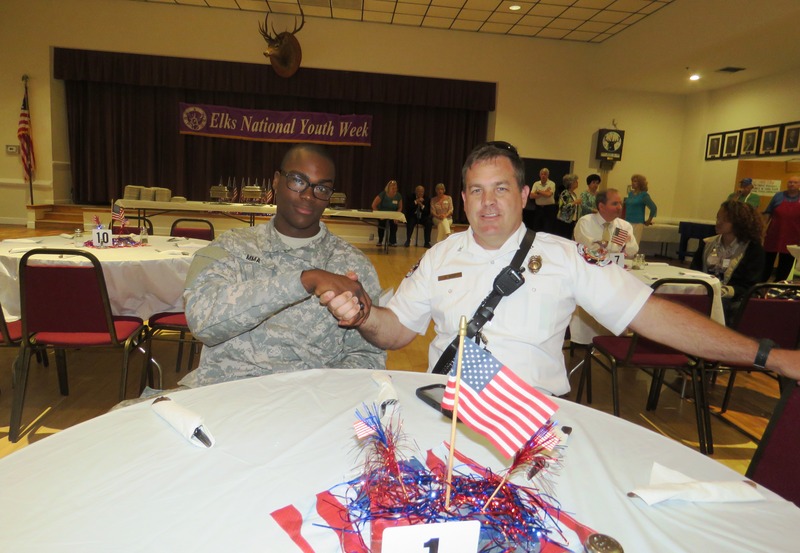 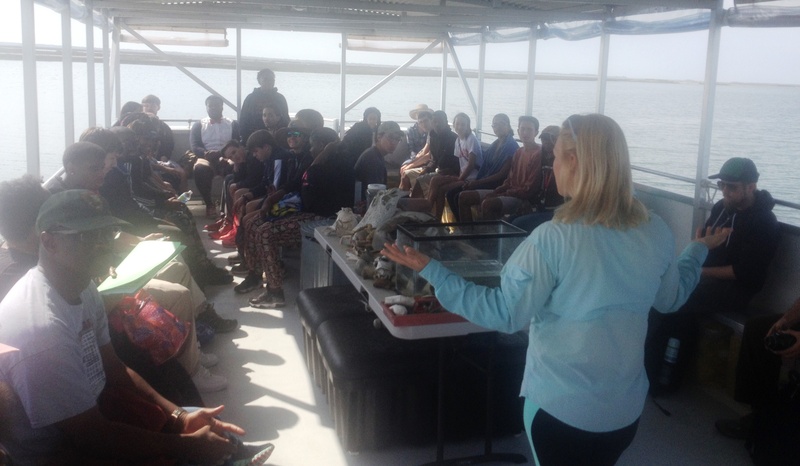 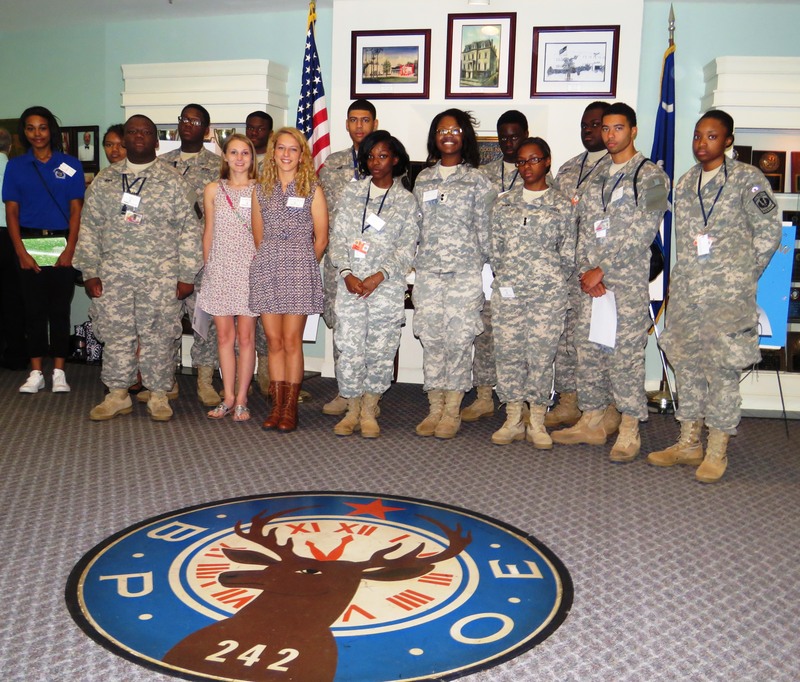 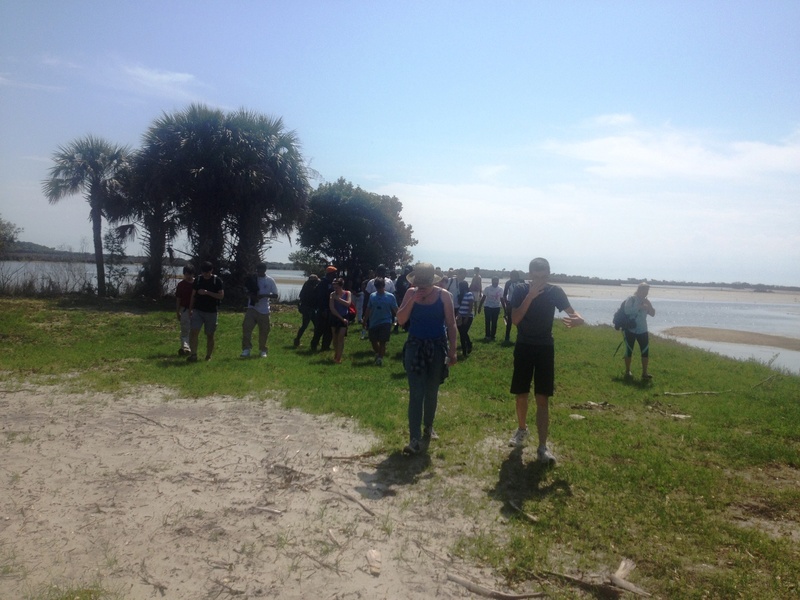 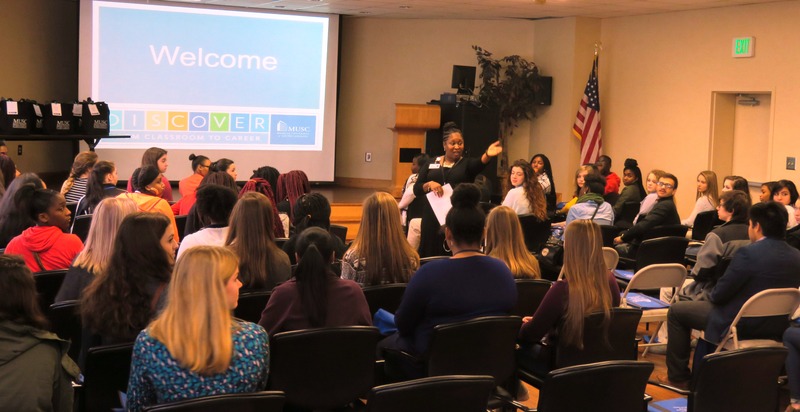 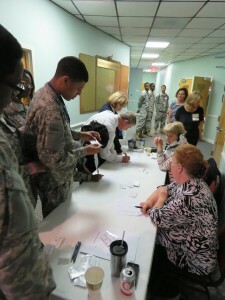 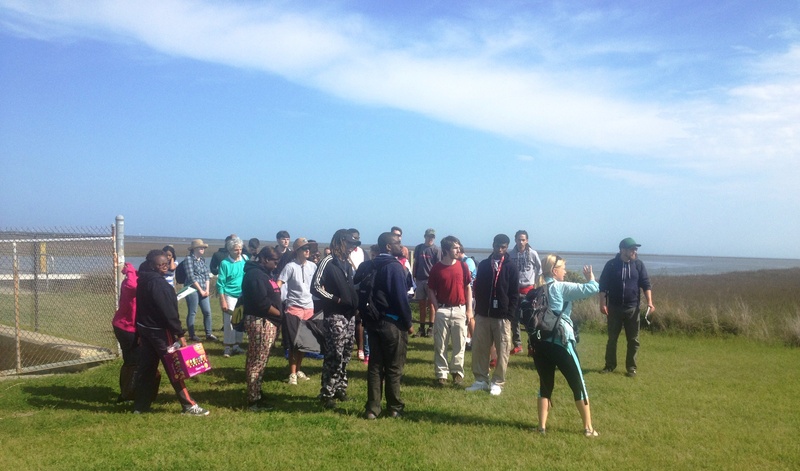 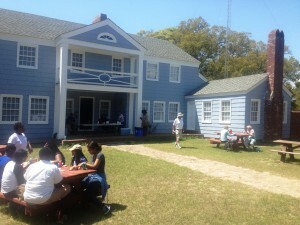 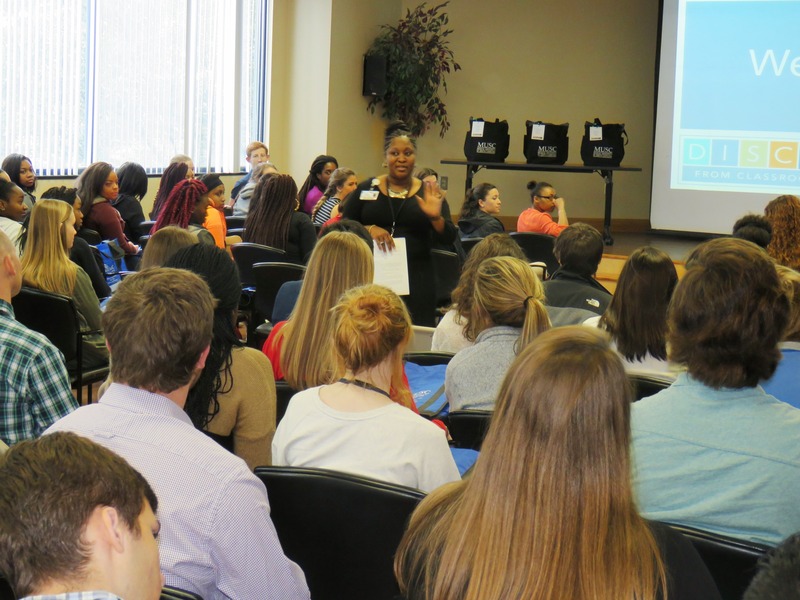 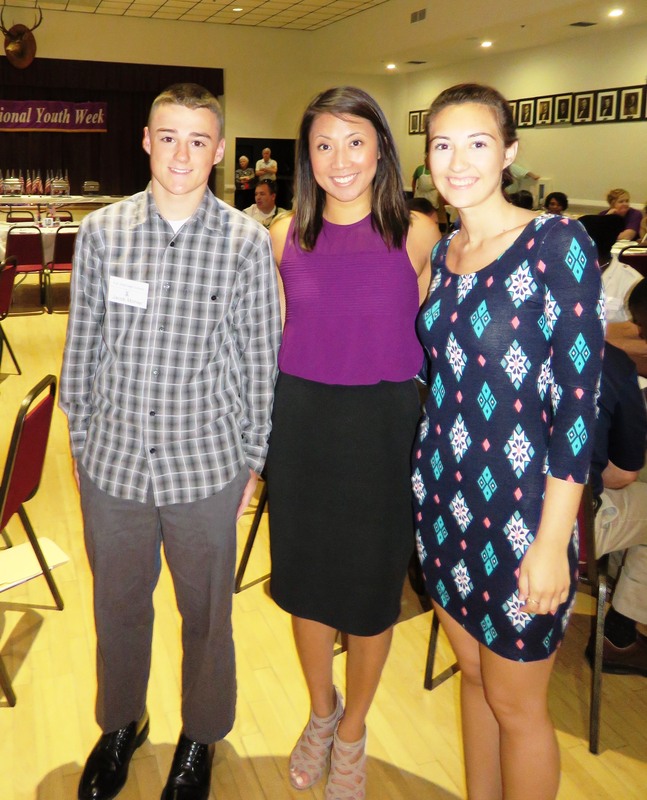 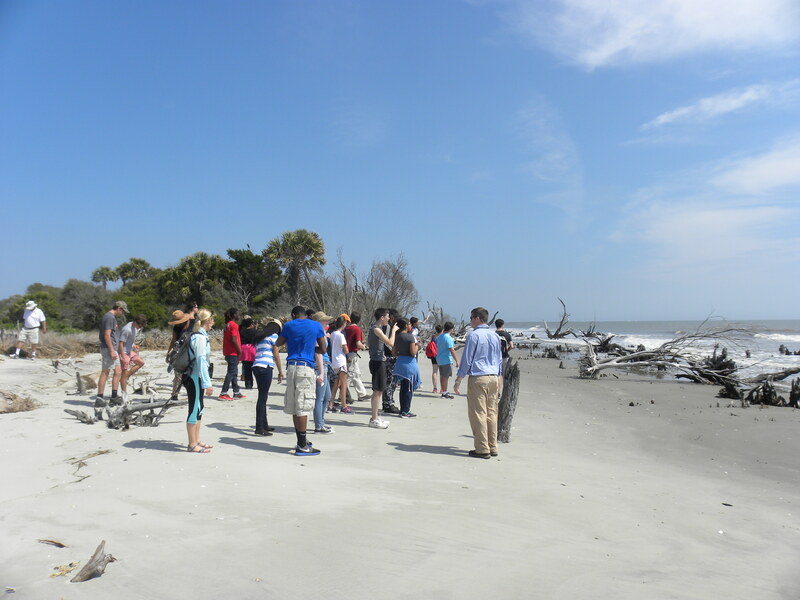 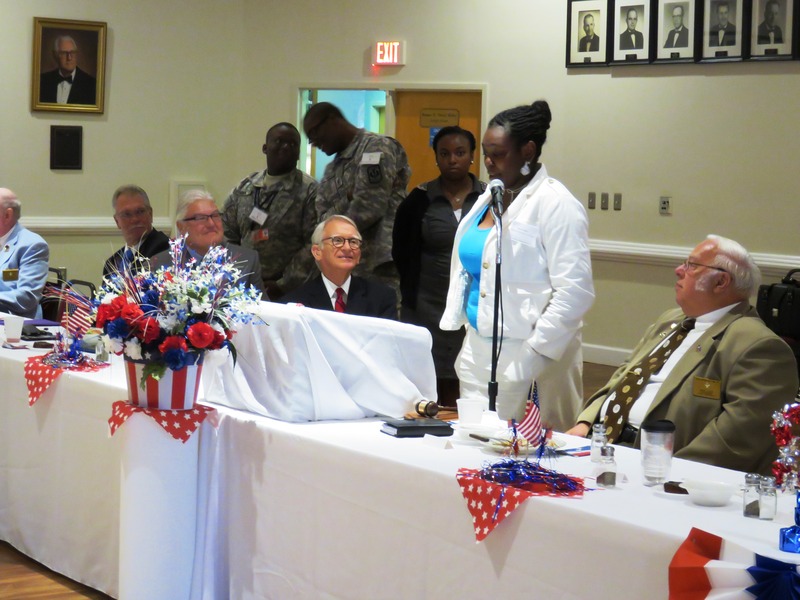 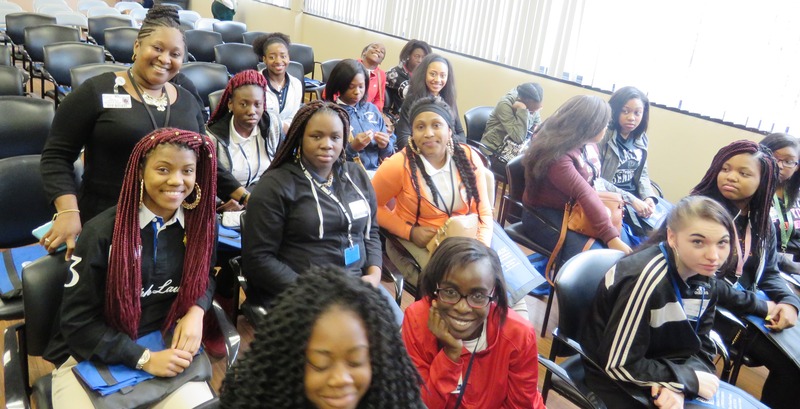 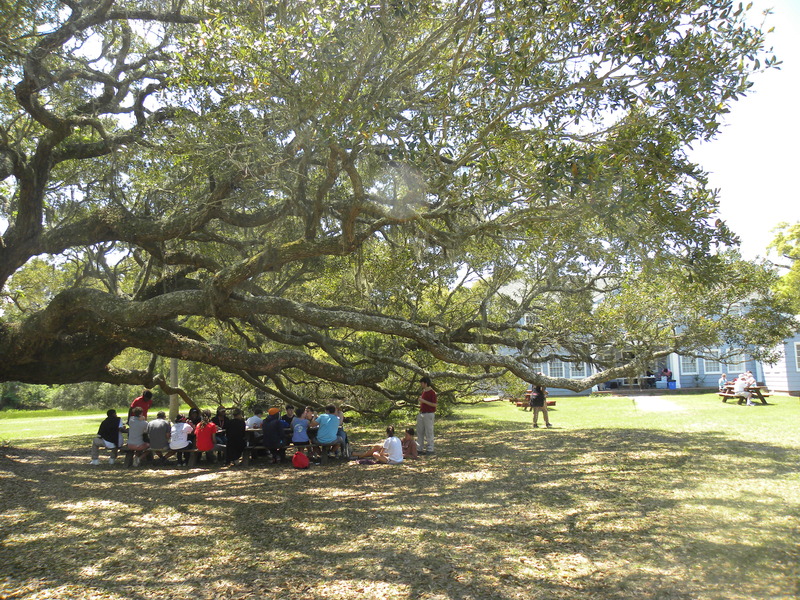 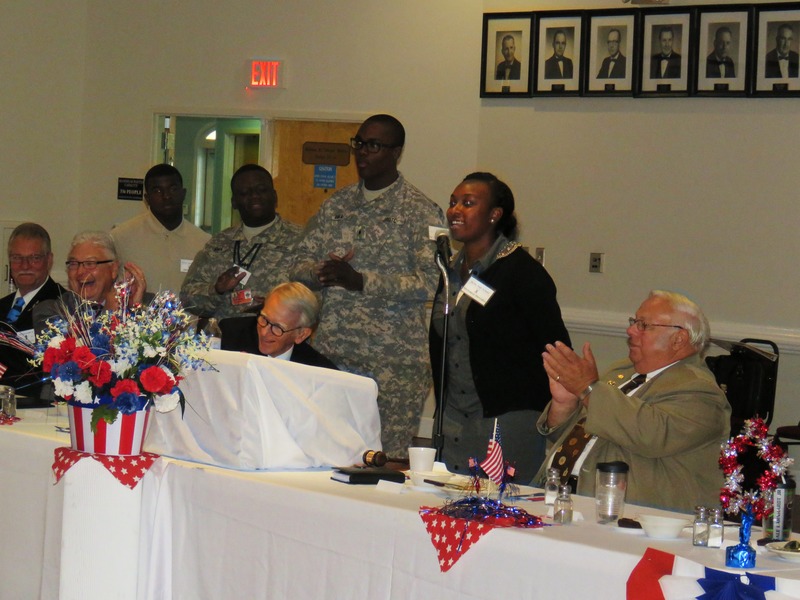 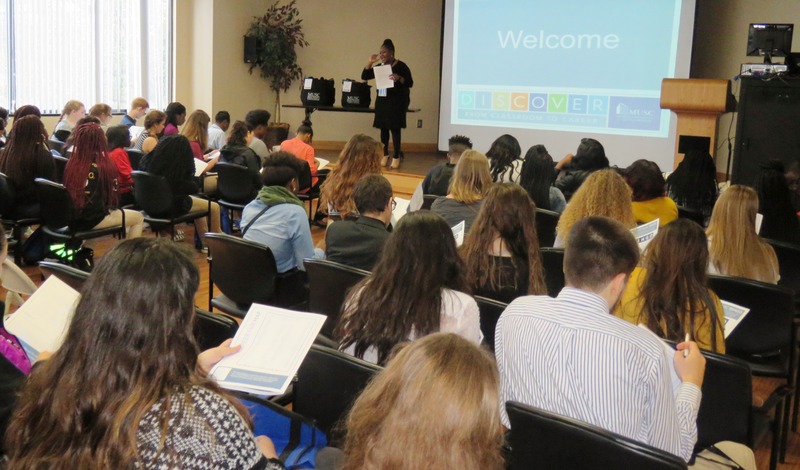 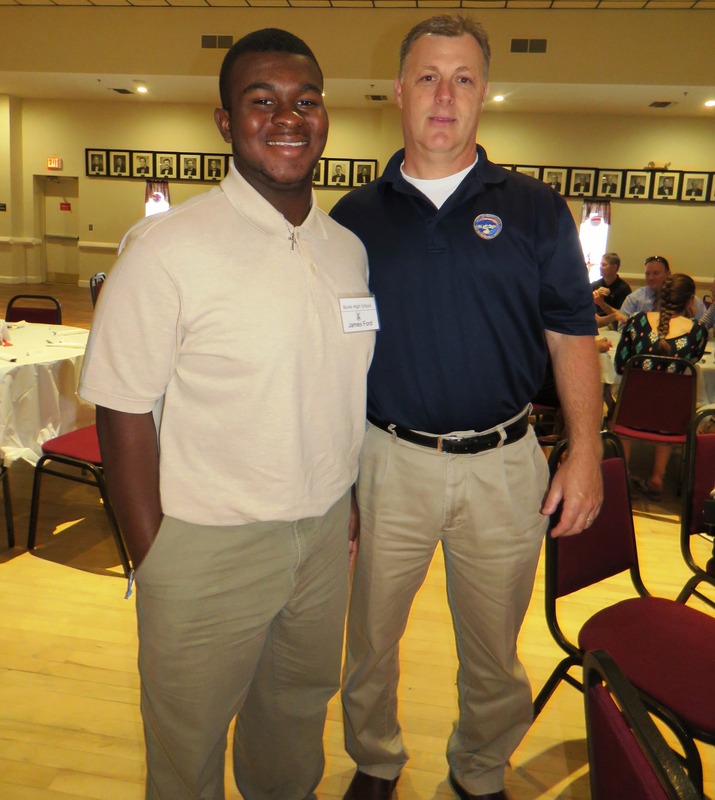 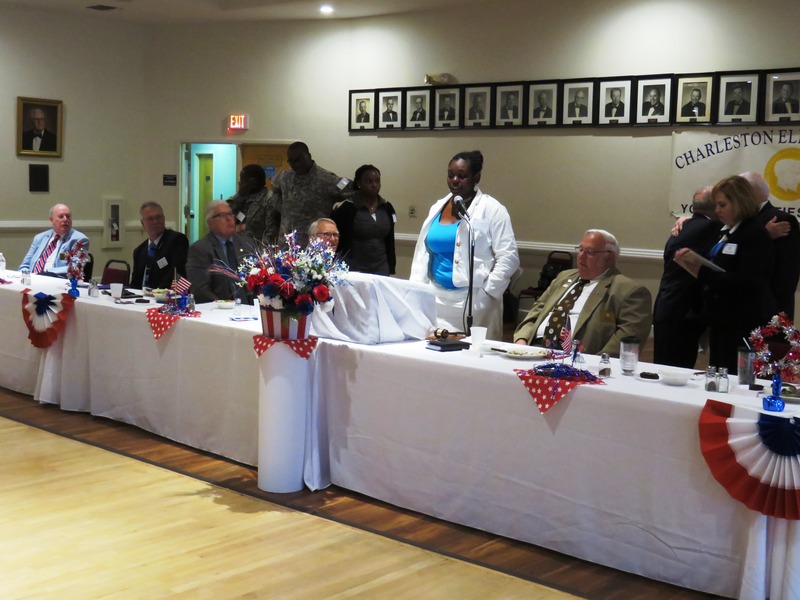 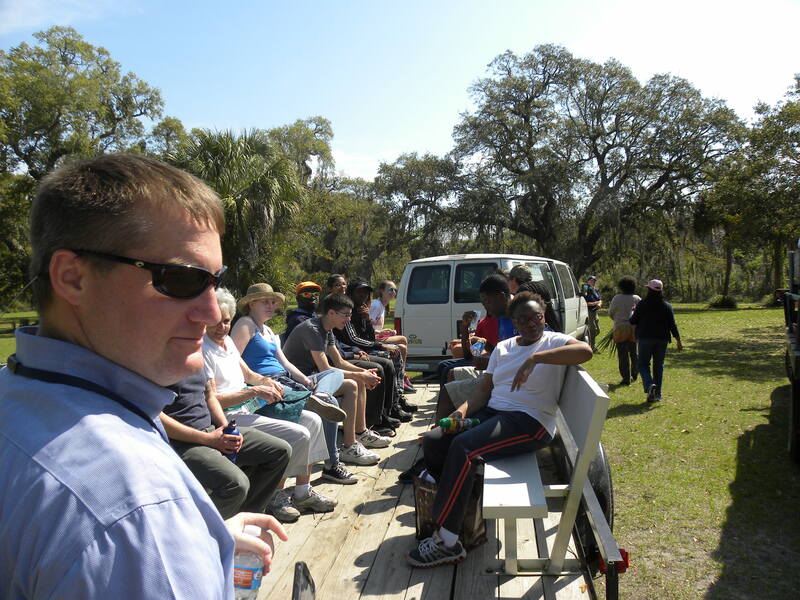 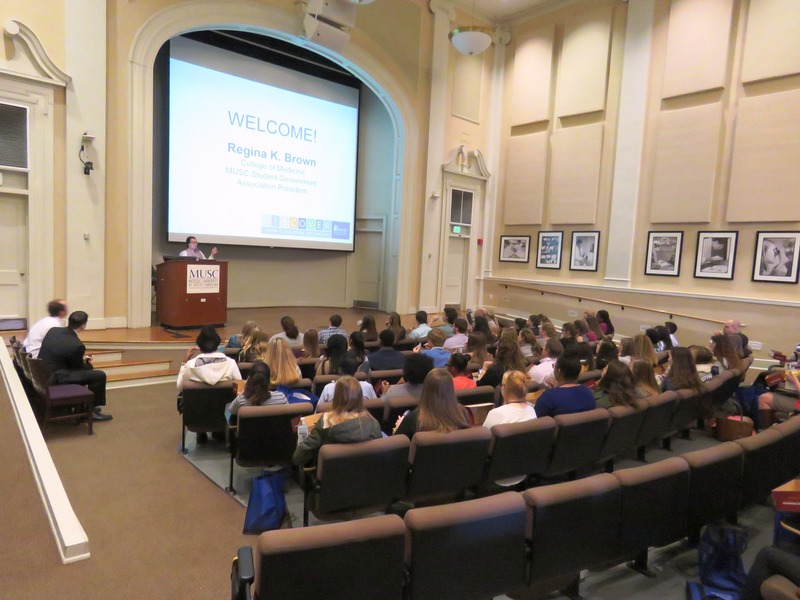 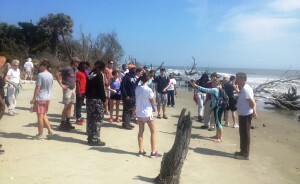 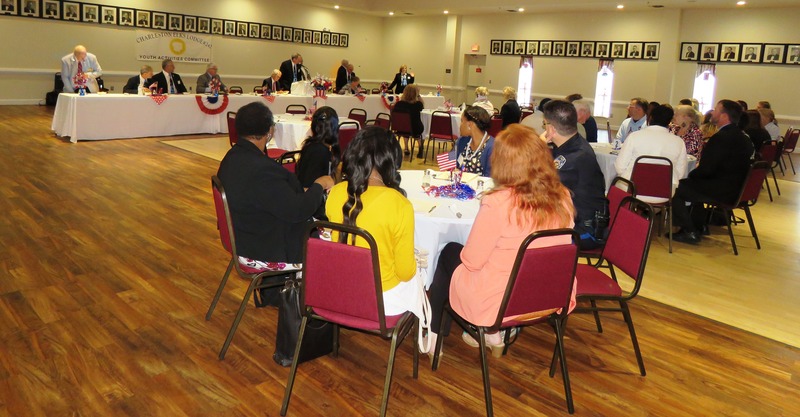 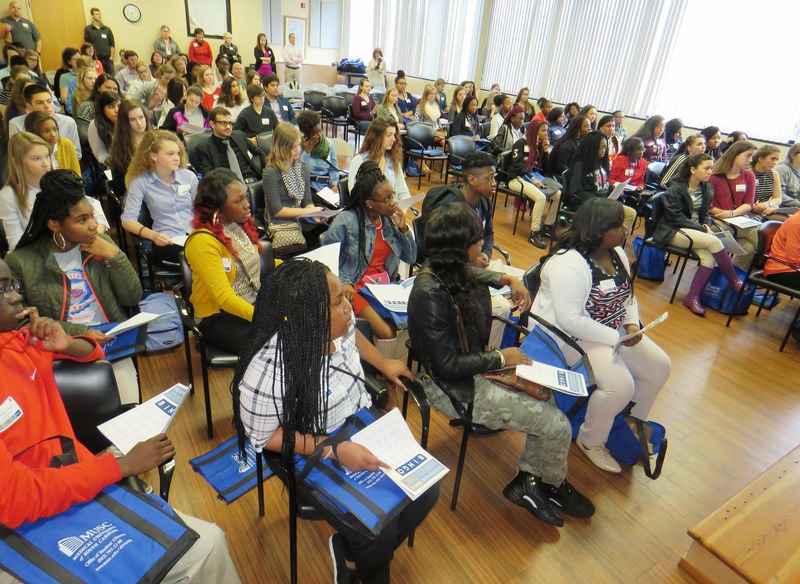 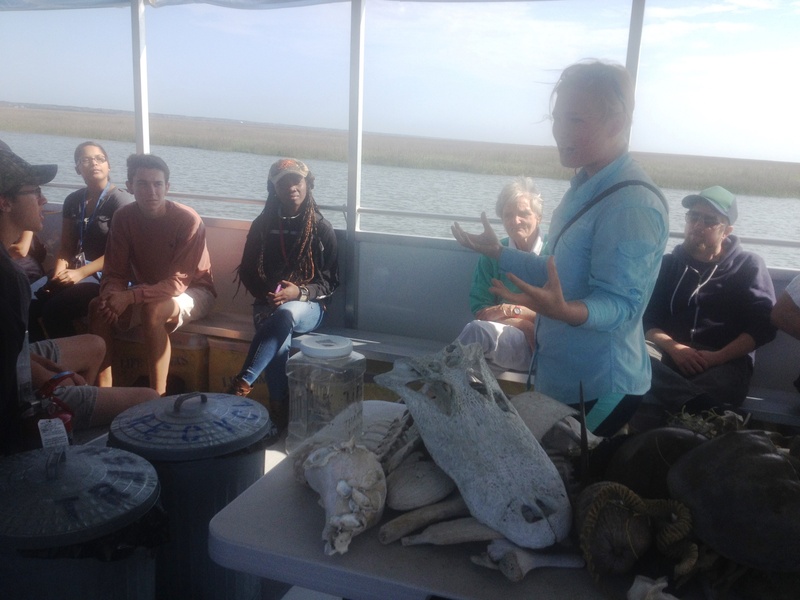 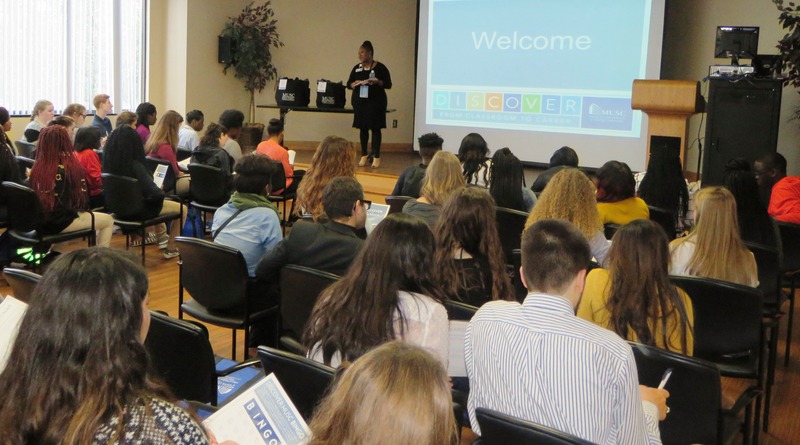 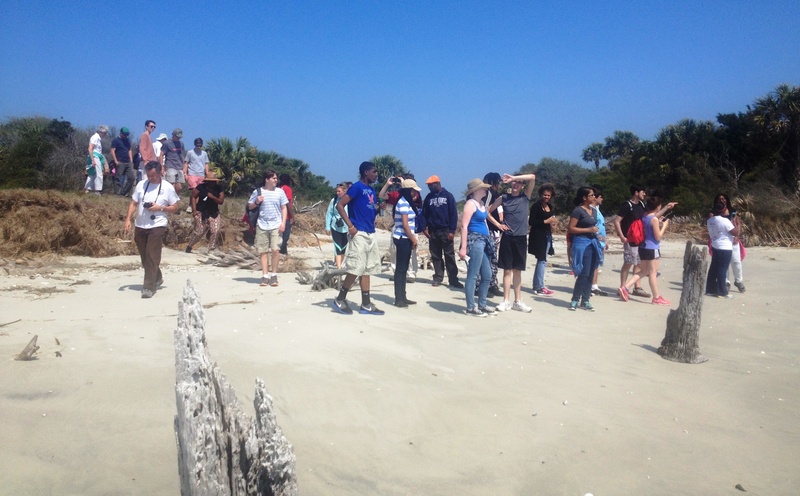 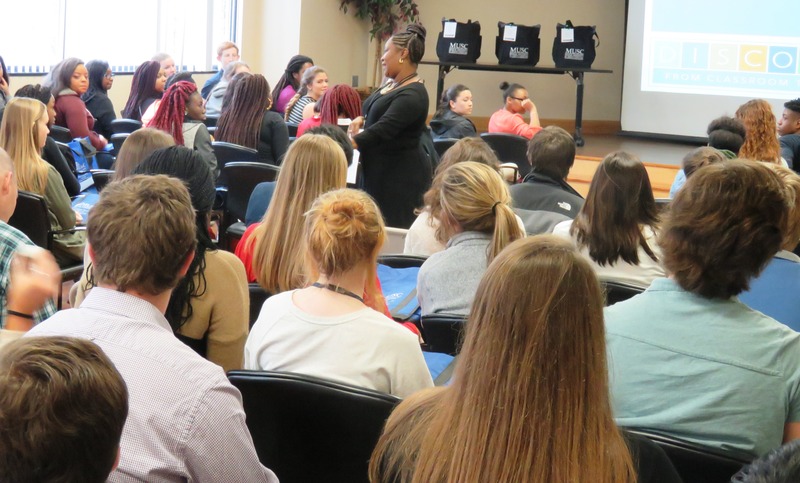 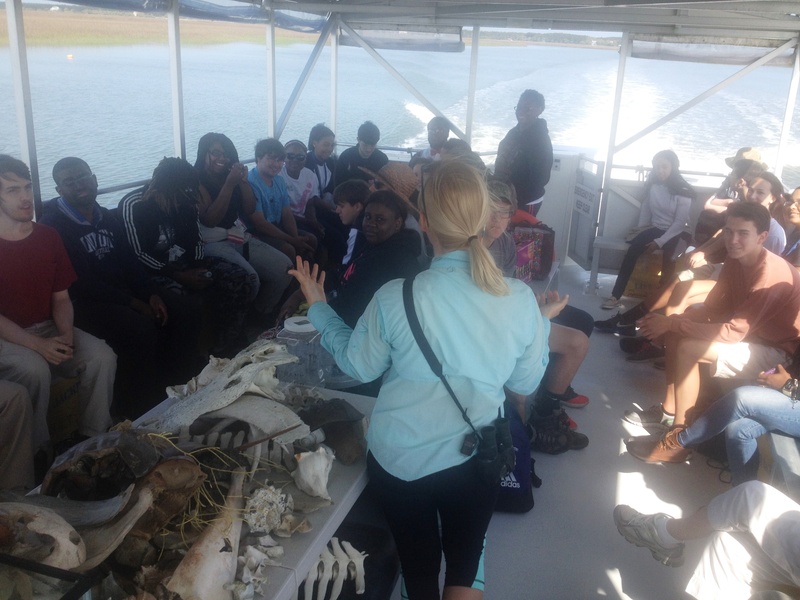 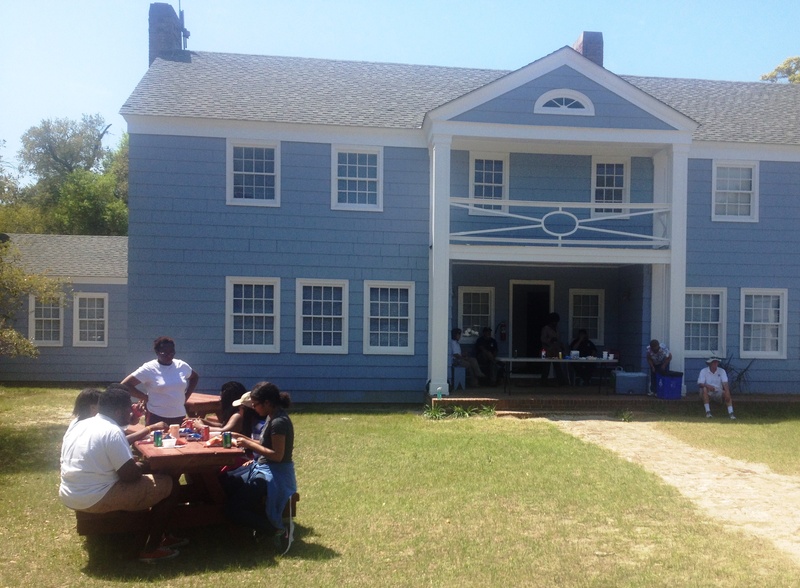 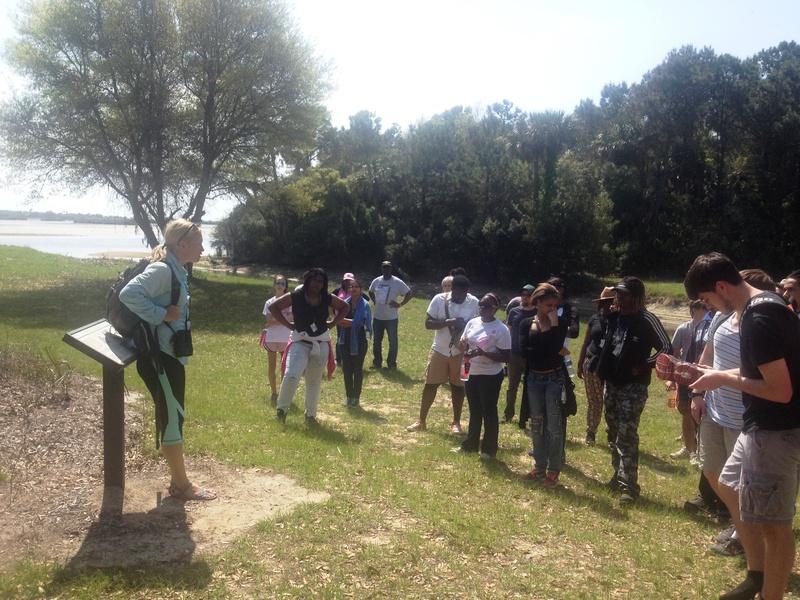 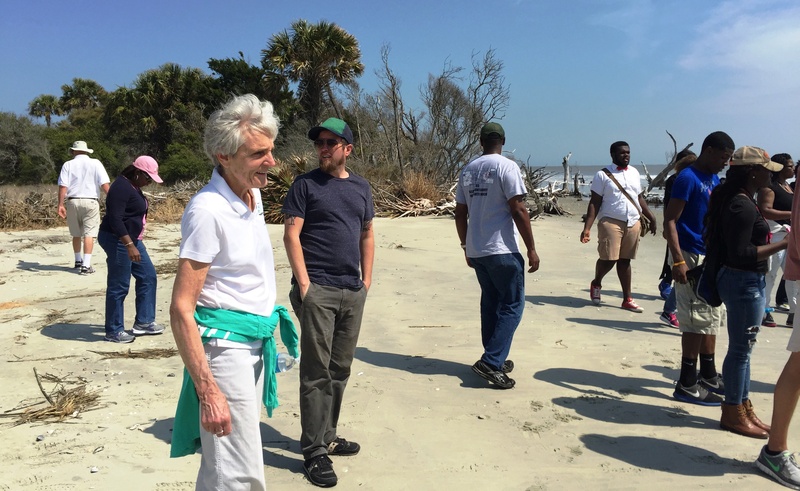 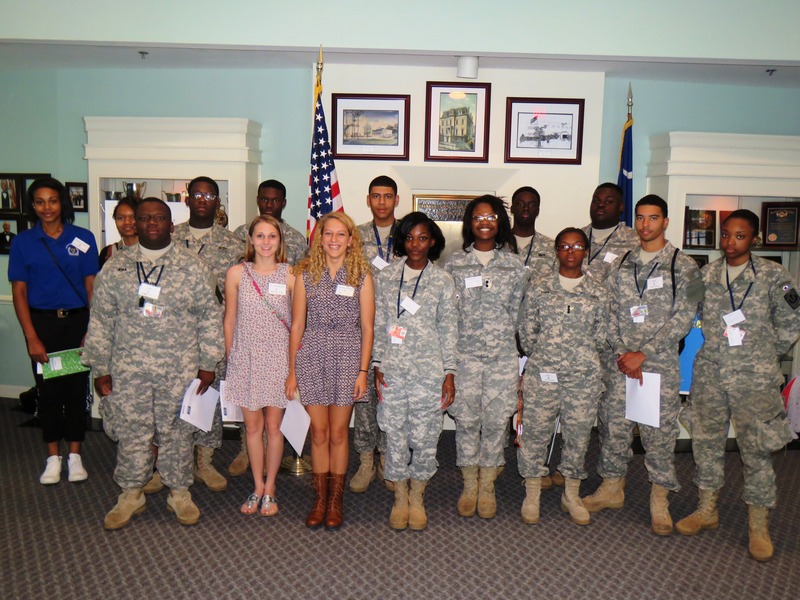 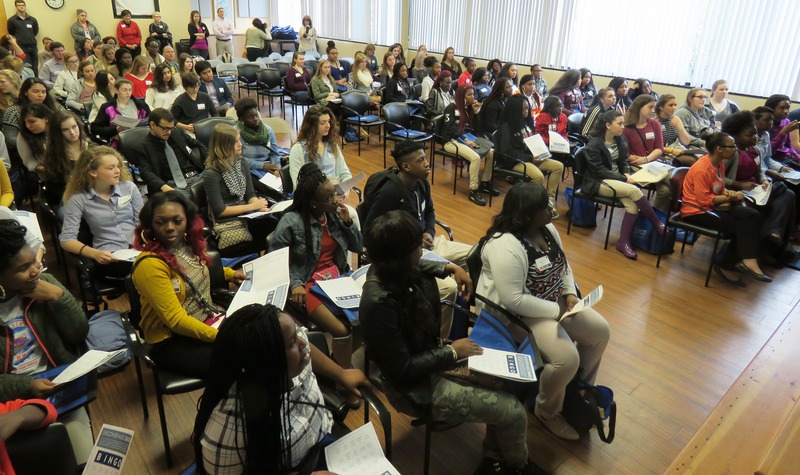 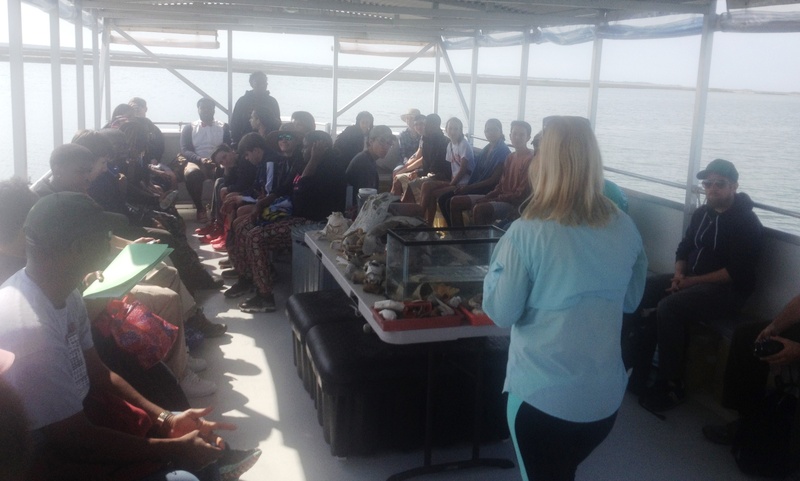 May 14, 2015 – Charleston, SC – Elks Lodge 242 hosted over 35 students from area high schools for a day of job shadowing experiences with local municipalities. 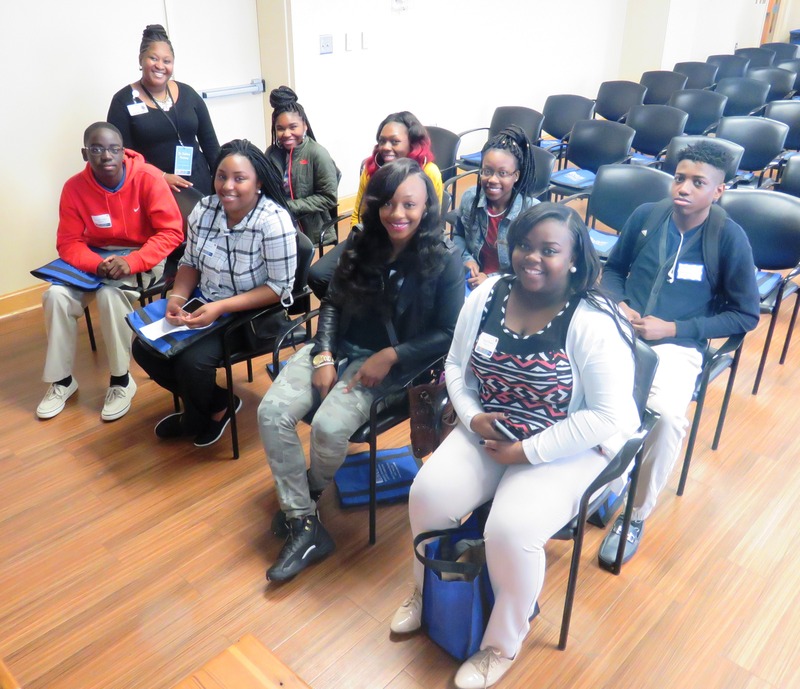 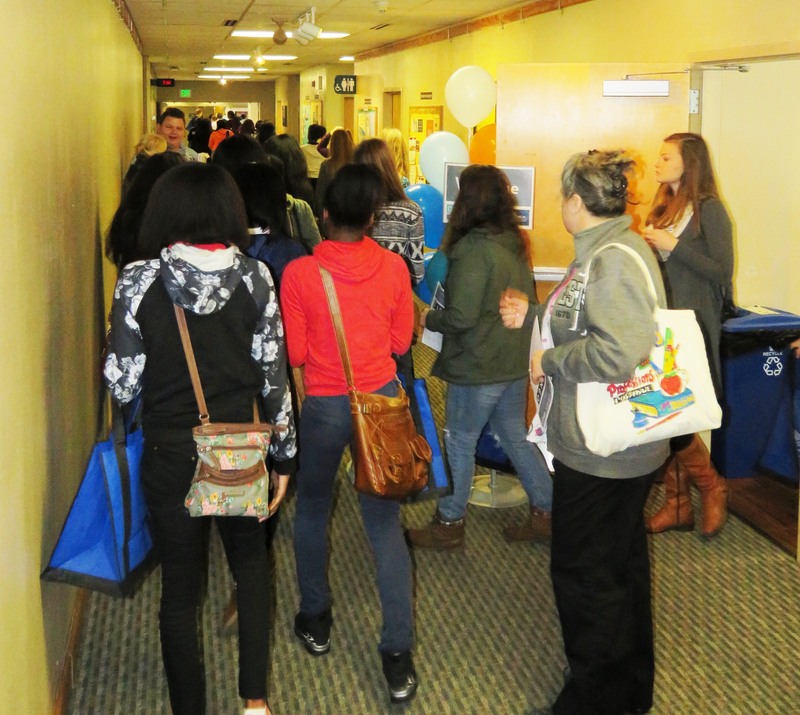 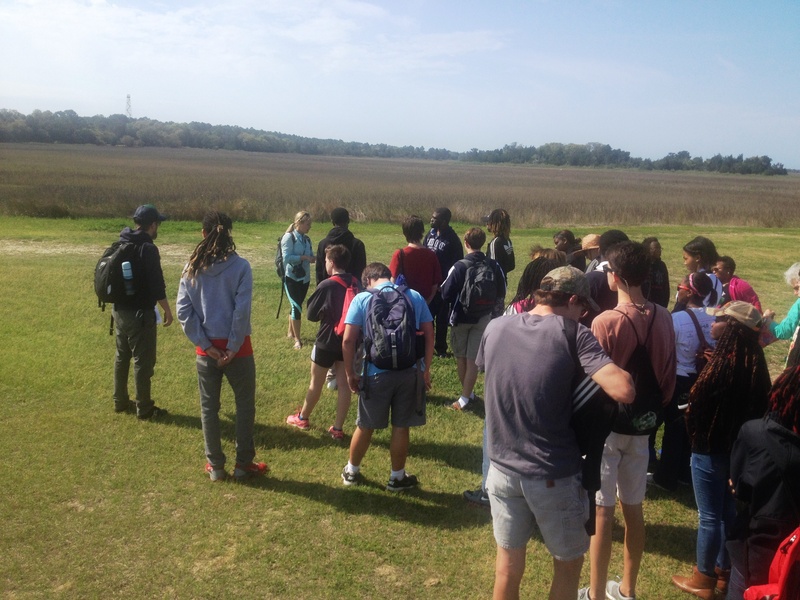 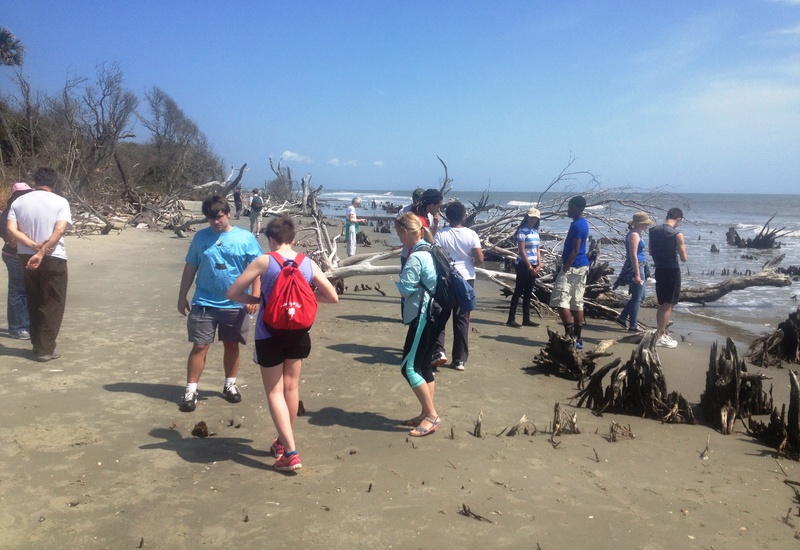 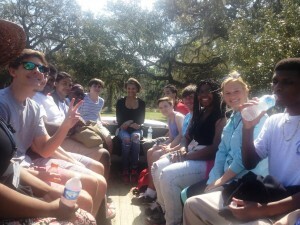 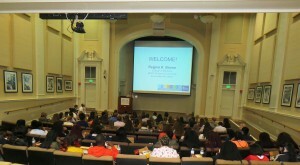 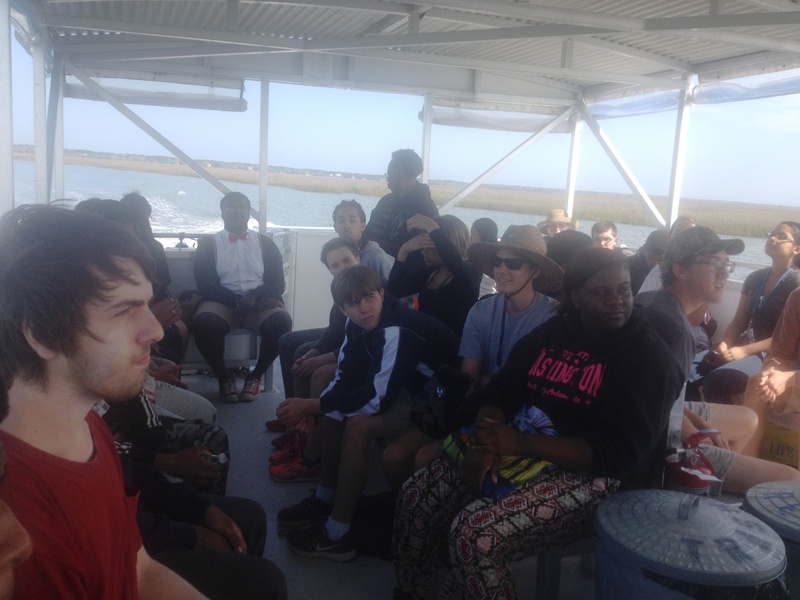 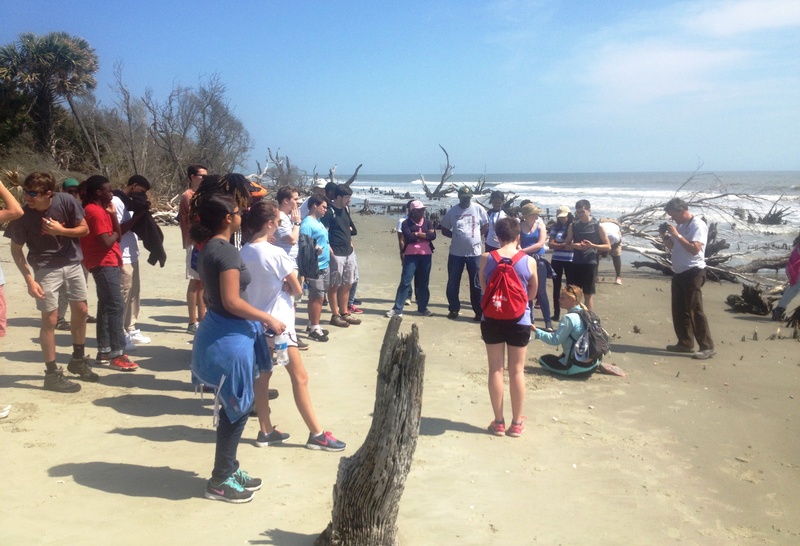 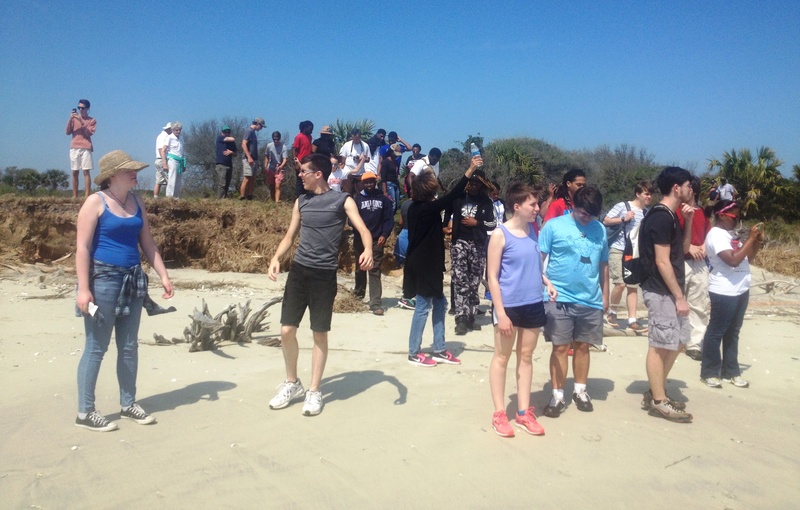 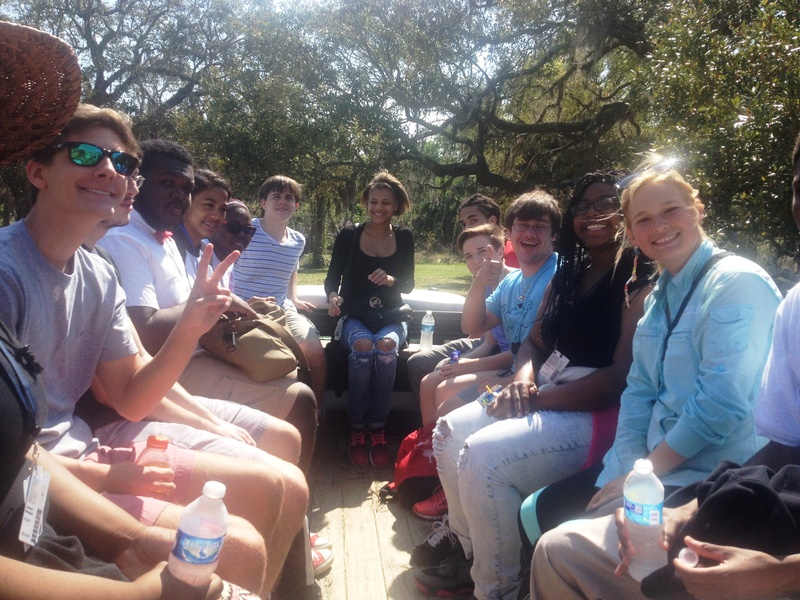 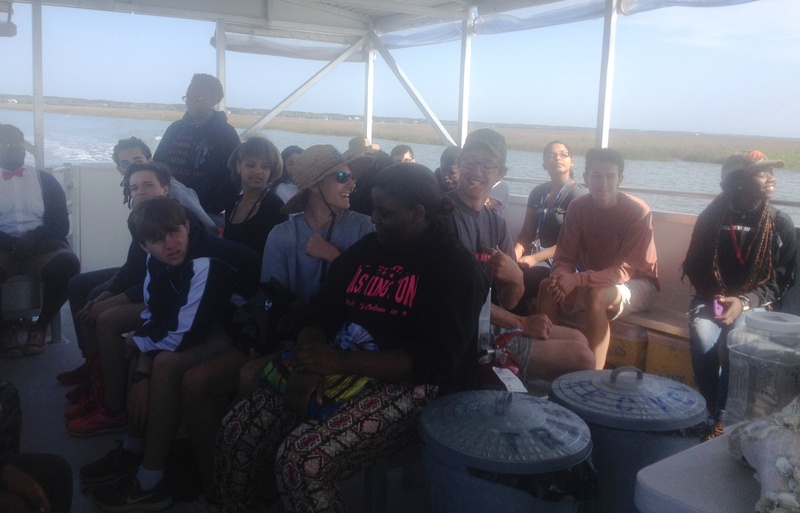 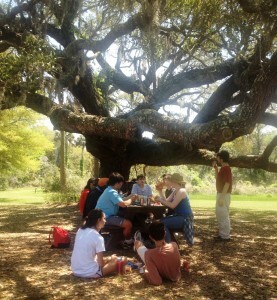 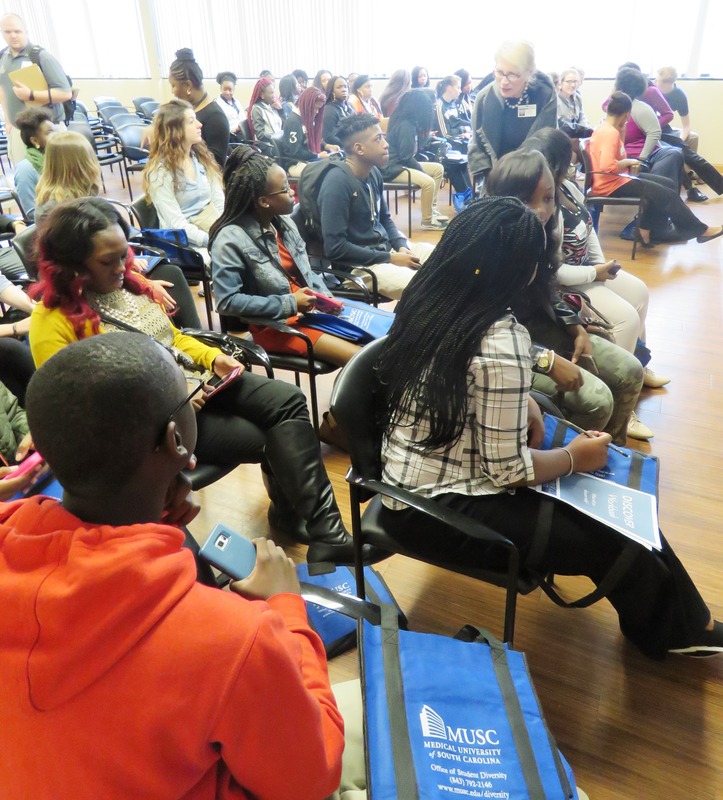 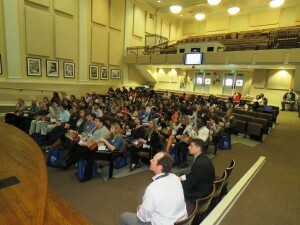 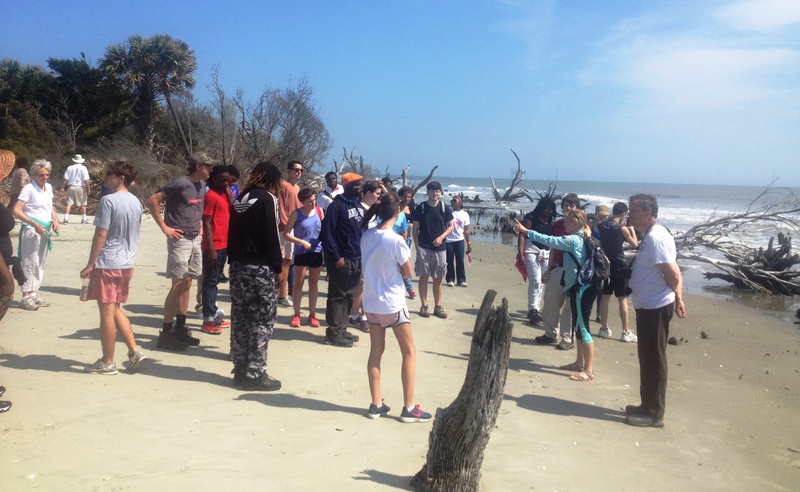 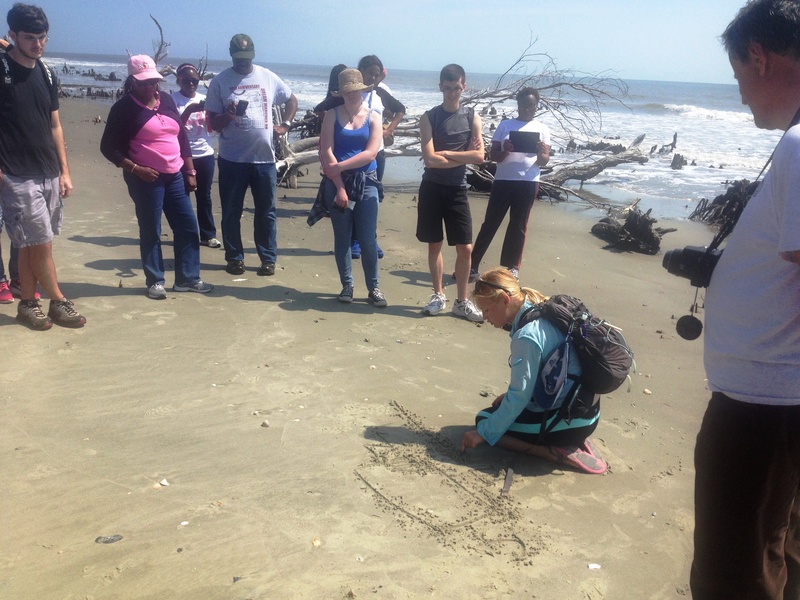 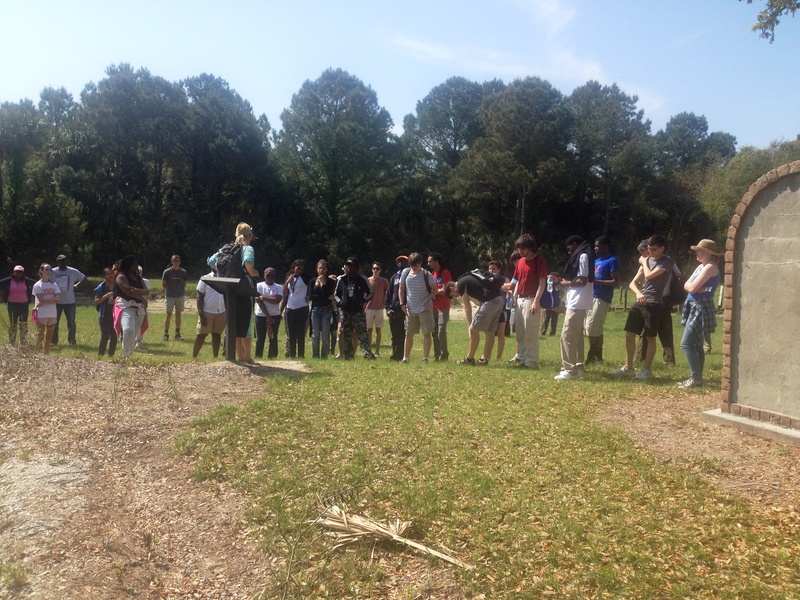 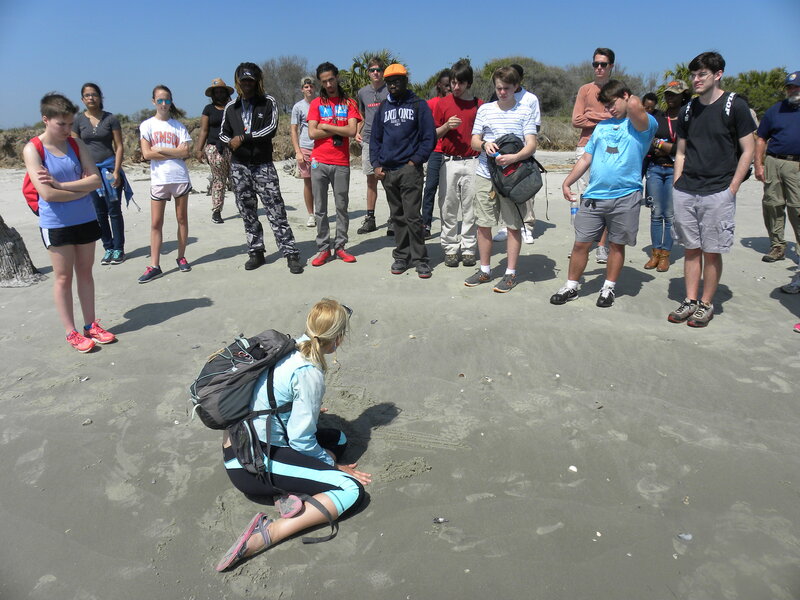 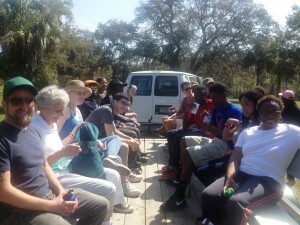 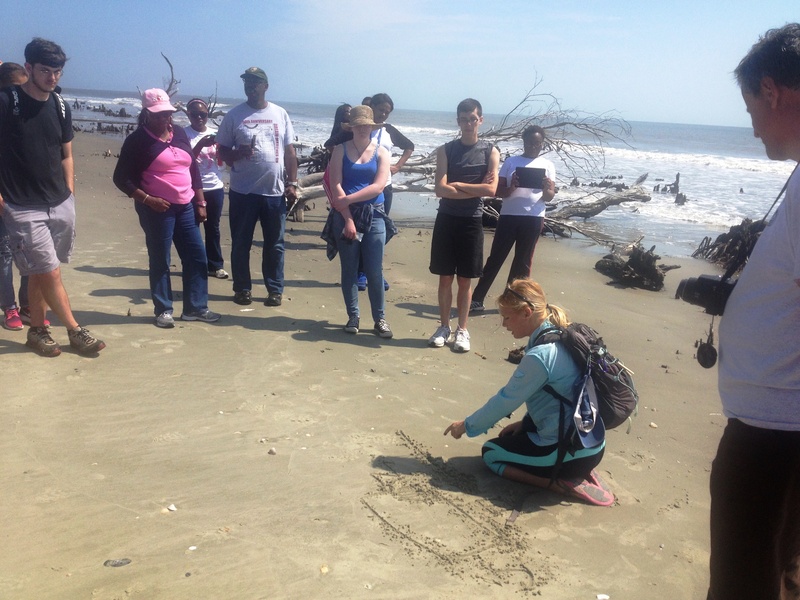 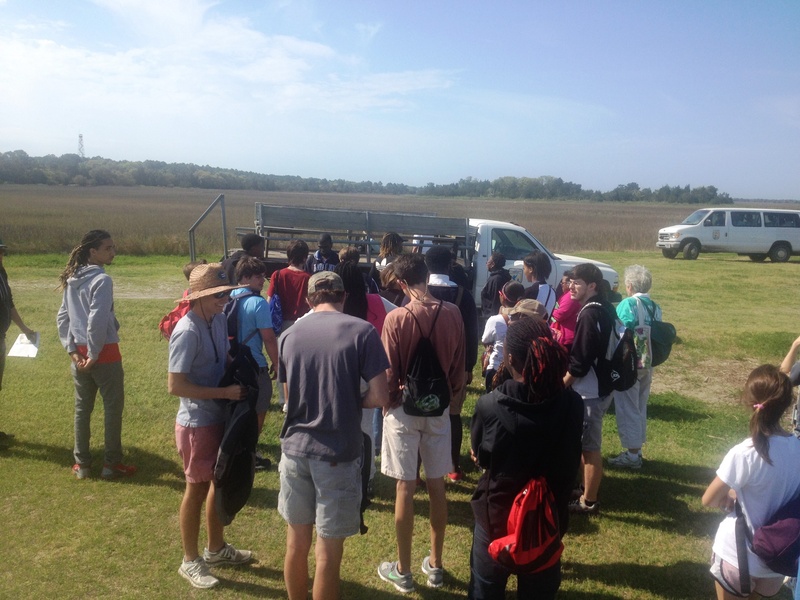 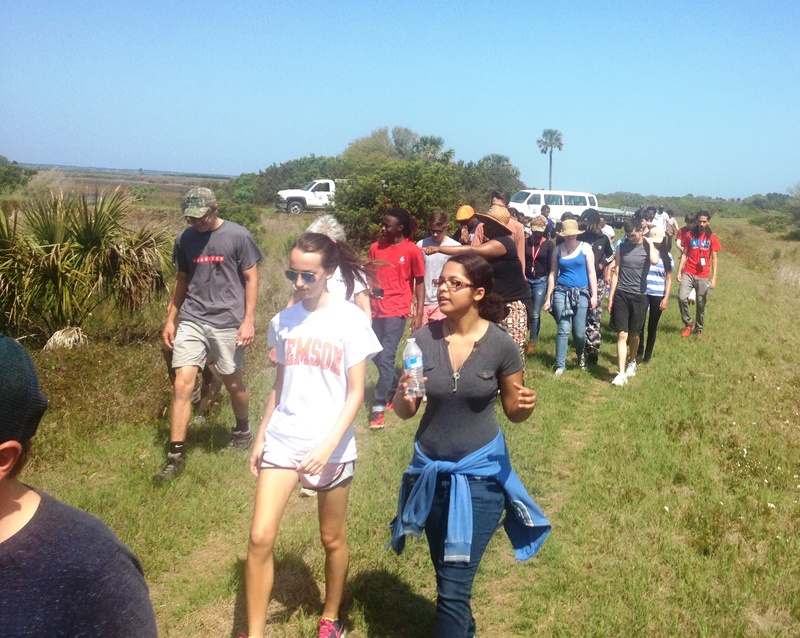 Students from Burke HS, Lincoln HS, Military Magnet Academy, Charleston Charter School for Math & Science, R. B. 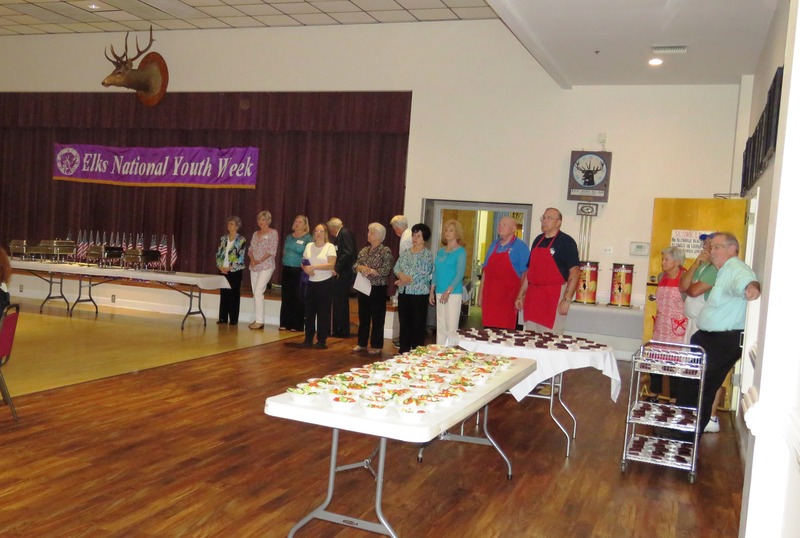 Stall HS, and West Ashley HS arrived at the Elks Lodge in West Ashley and were treated to juice and muffins by Elks volunteers. 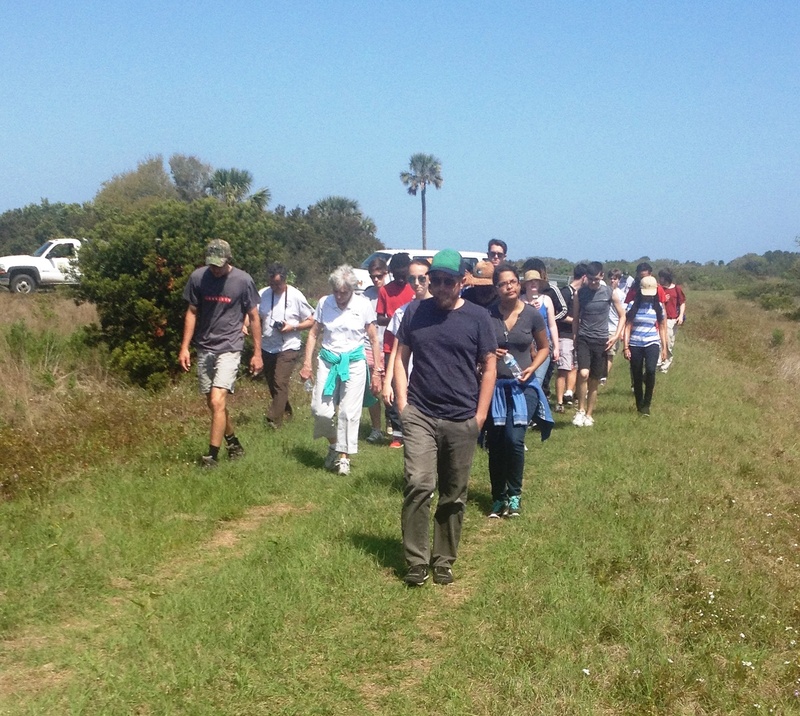 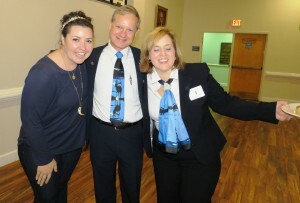 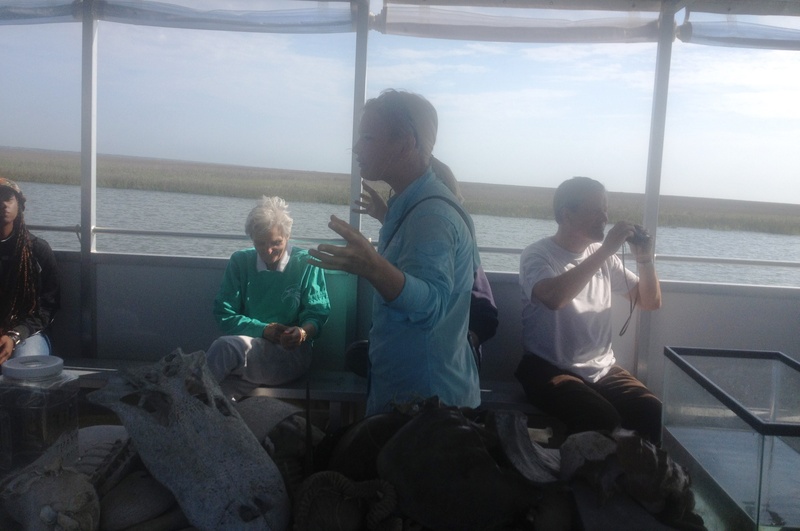 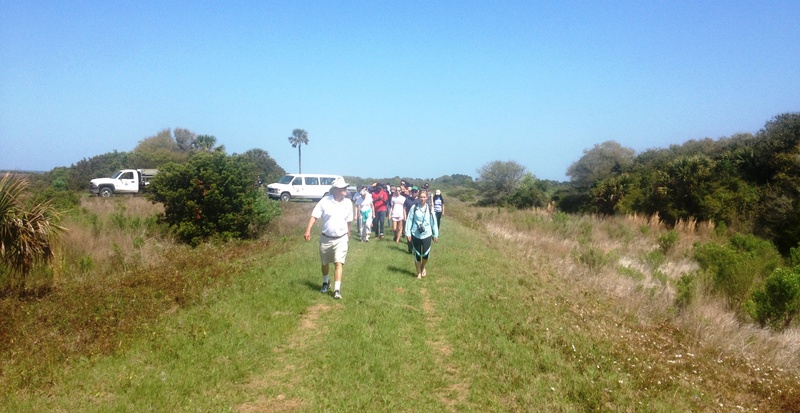 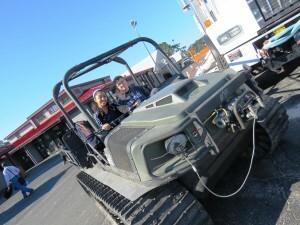 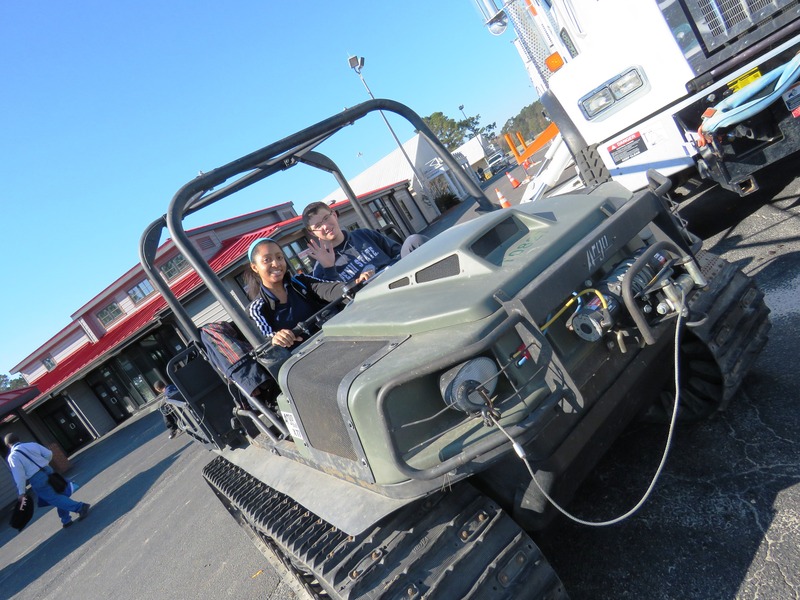 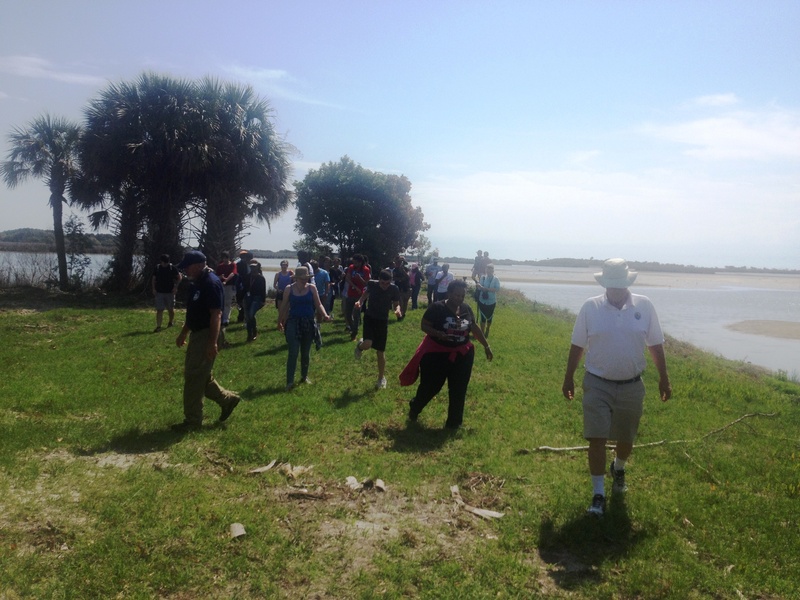 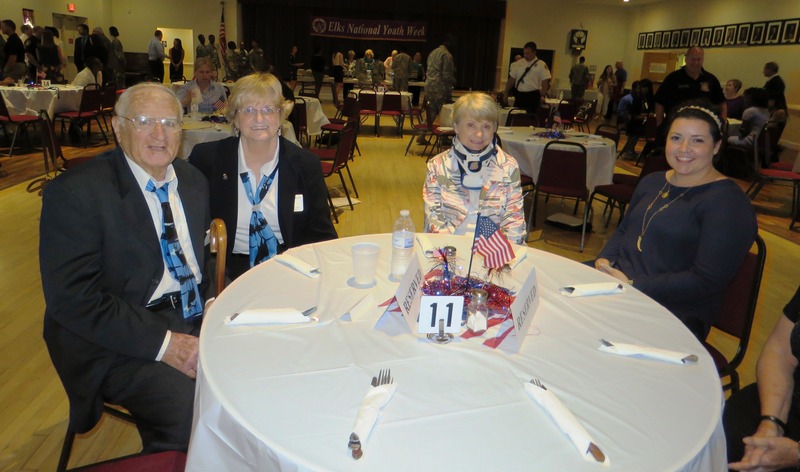 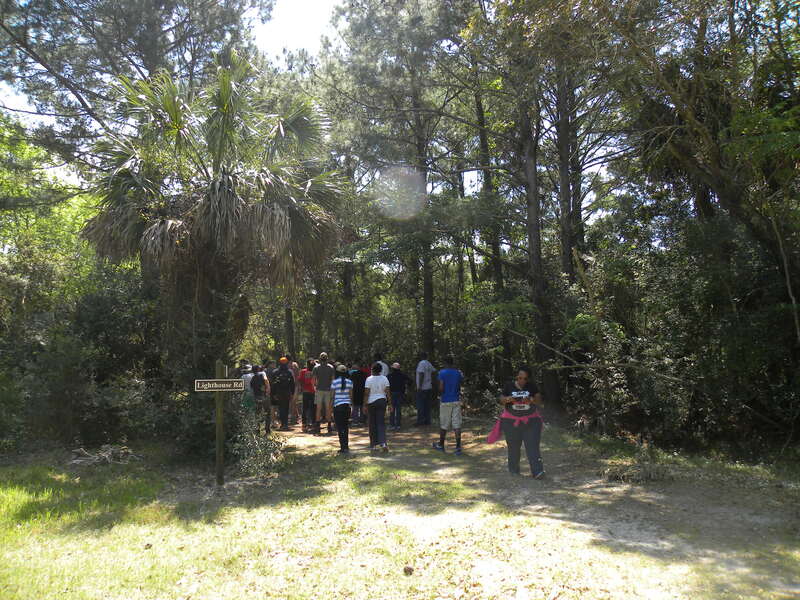 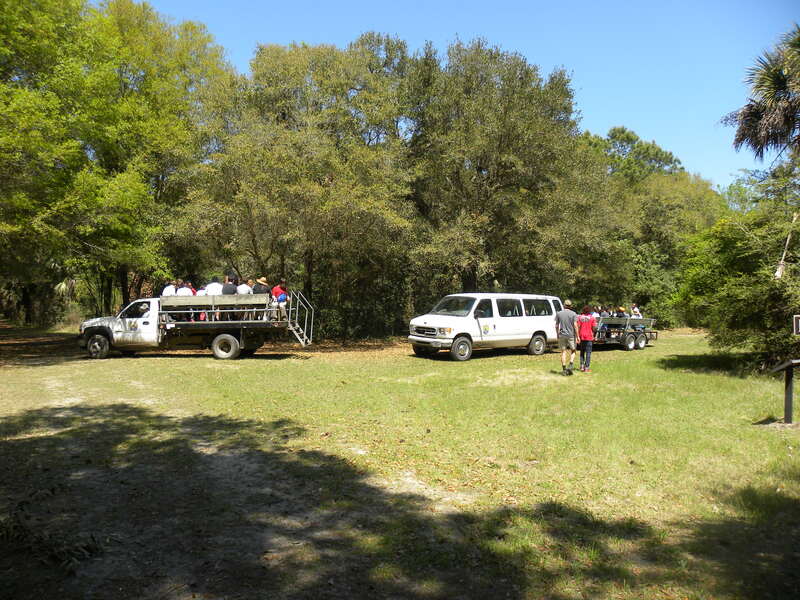 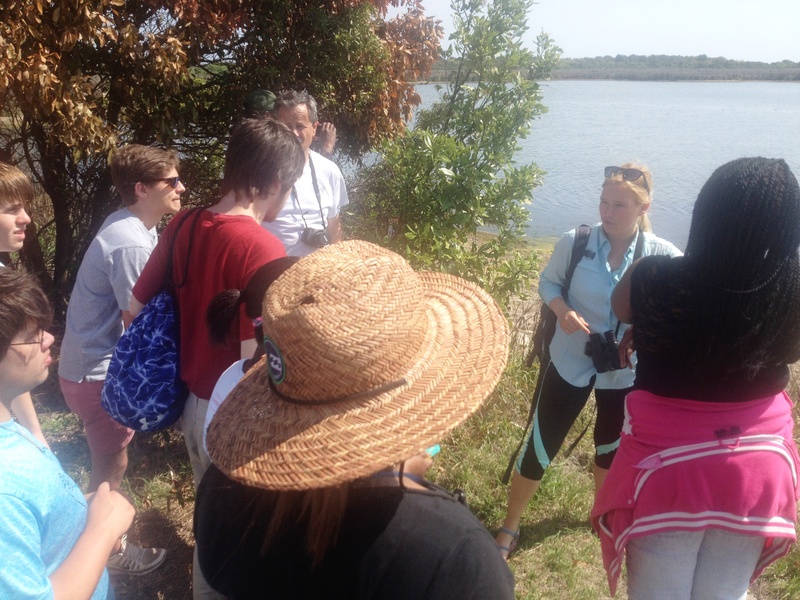 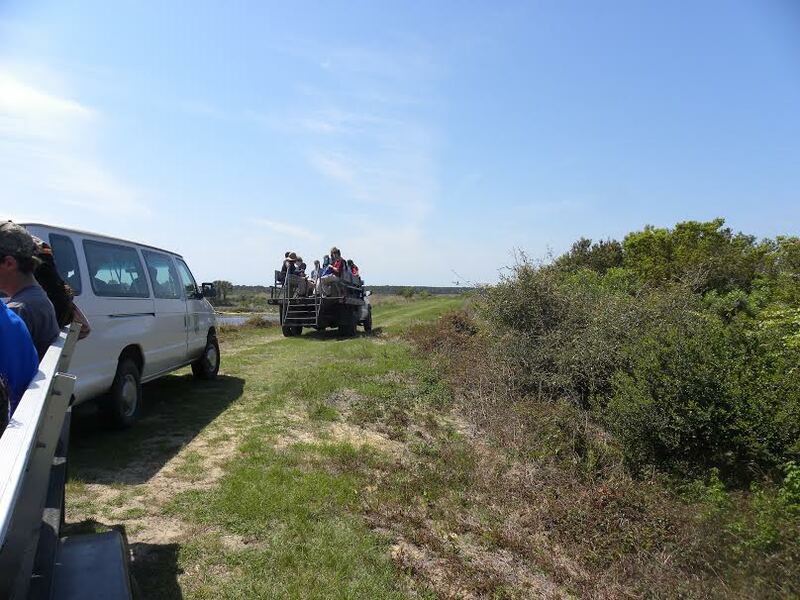 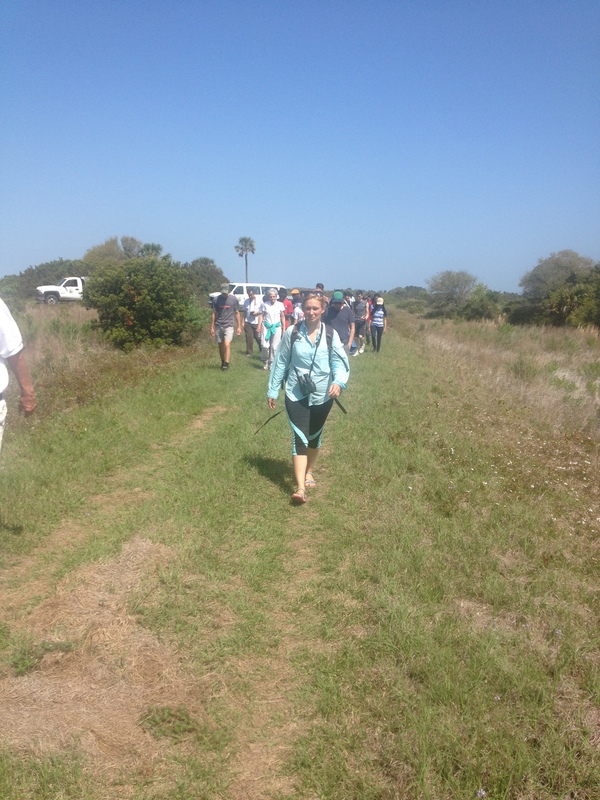 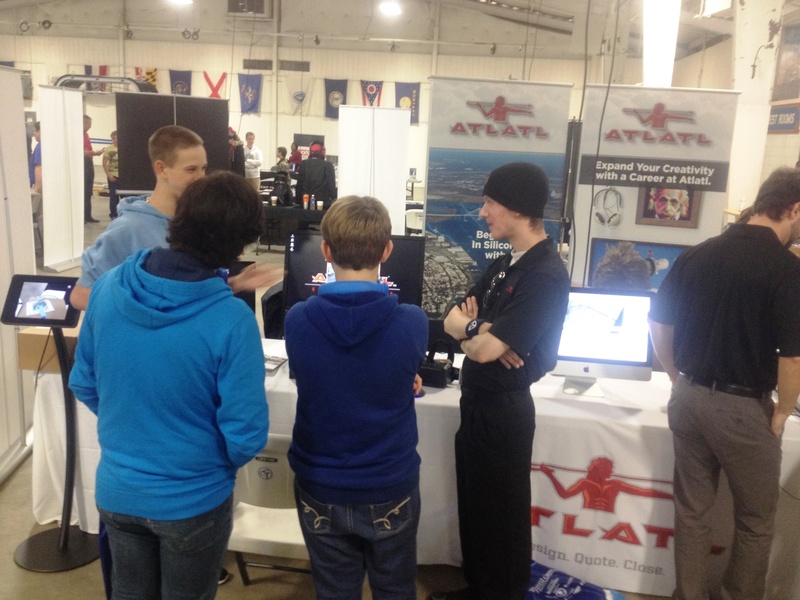 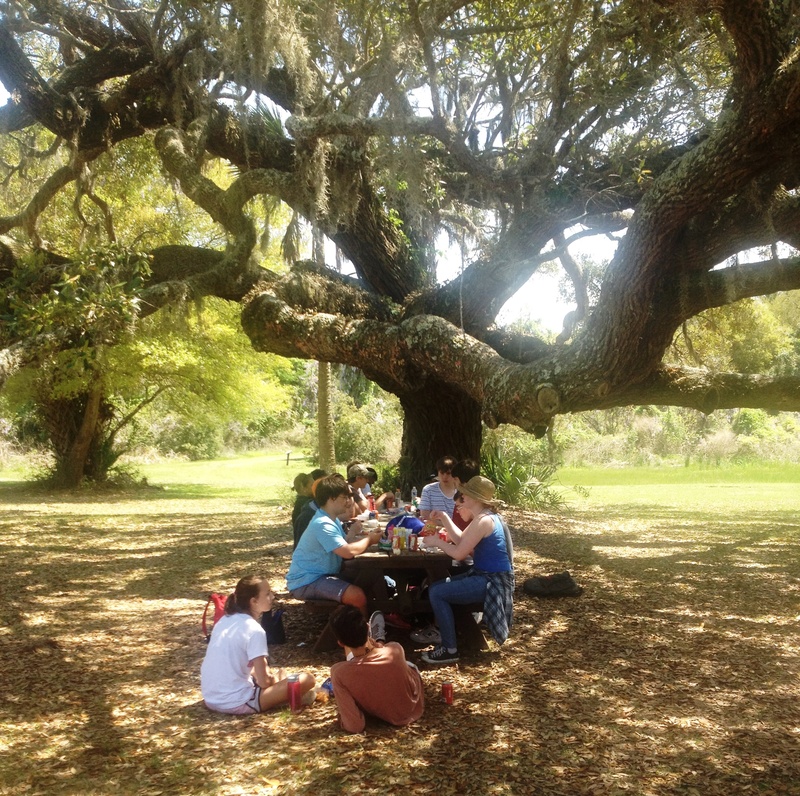 Each student was given their assigned destination and Elks members ensured they got to the locations – The Town of Mt. 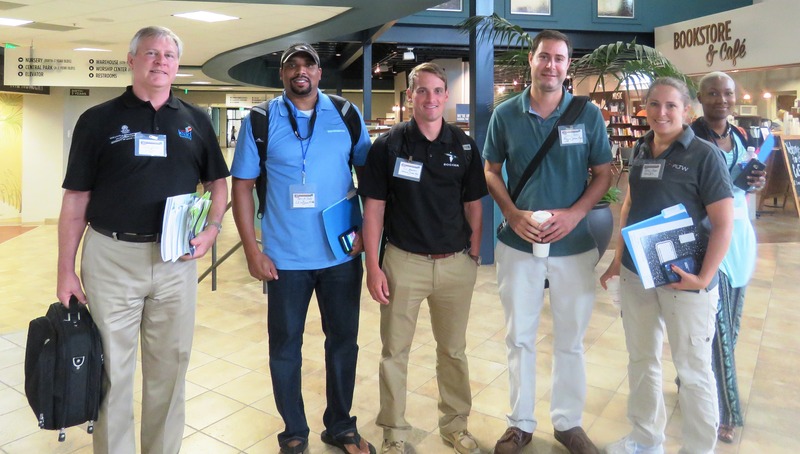 Pleasant, City of Charleston, City of North Charleston, and City of Hanahan provided opportunities for students to shadow various municipal professionals for the morning. Each students career interests were matched with their assignment. 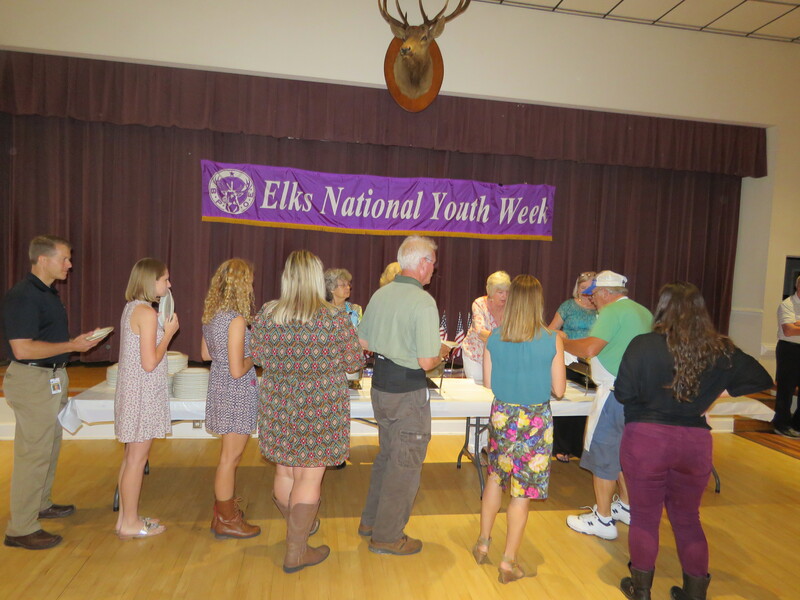 After spending the morning with the assigned job shadowing hosts, everyone gathered in the Elks main hall for a special luncheon. 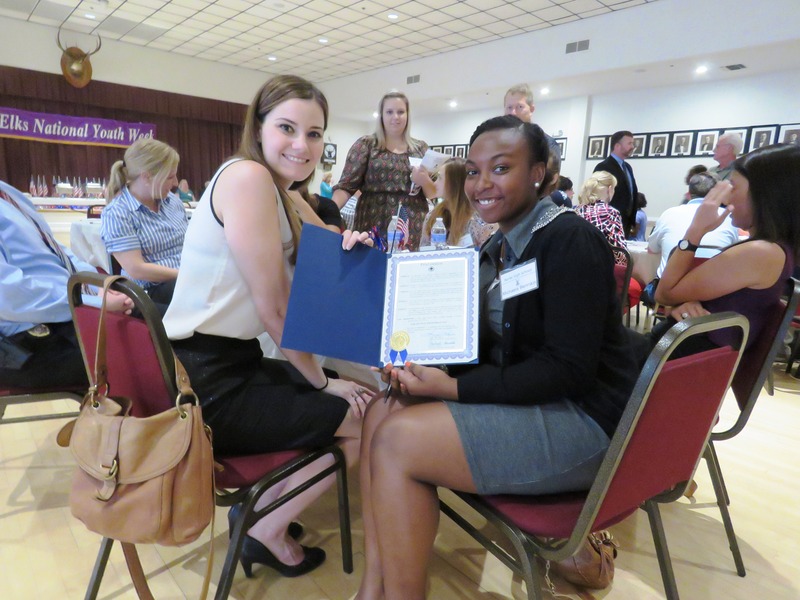 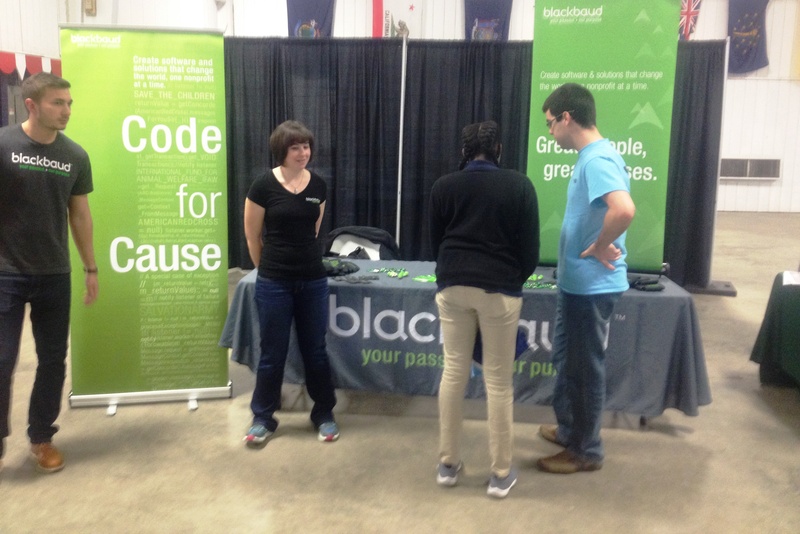 Micheala Bennekin, a senior at Burke High School got to shadow in the Mt. 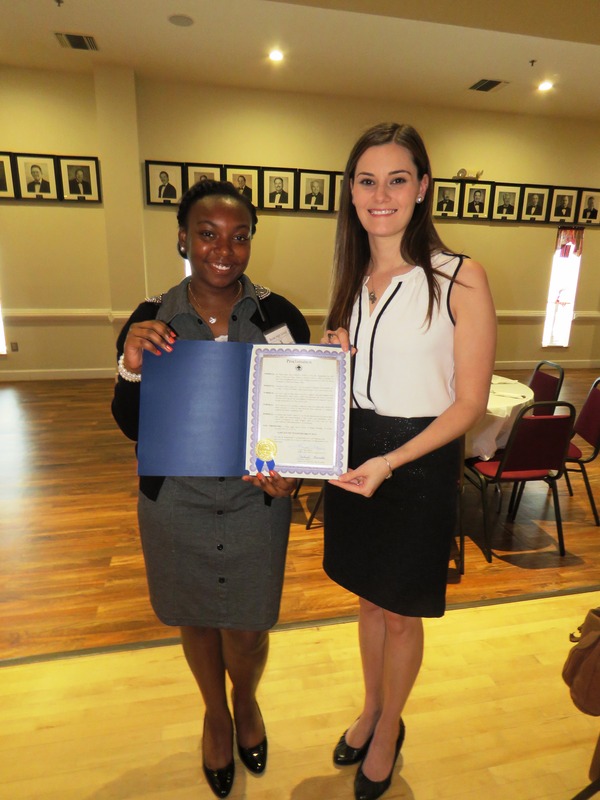 Pleasant mayor’s office, and received a proclamation from Mayor Linda Page appointing her Honorary Mayor for the Day! 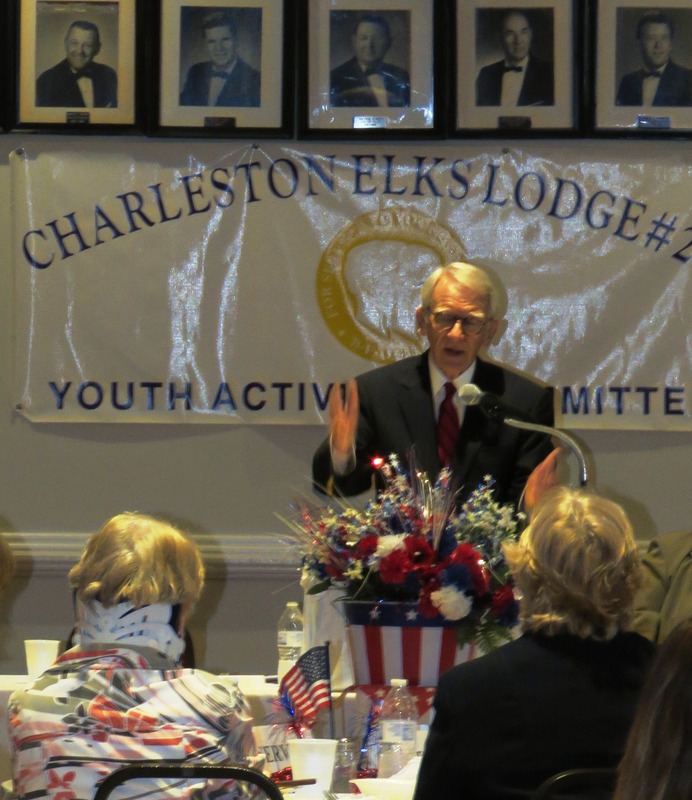 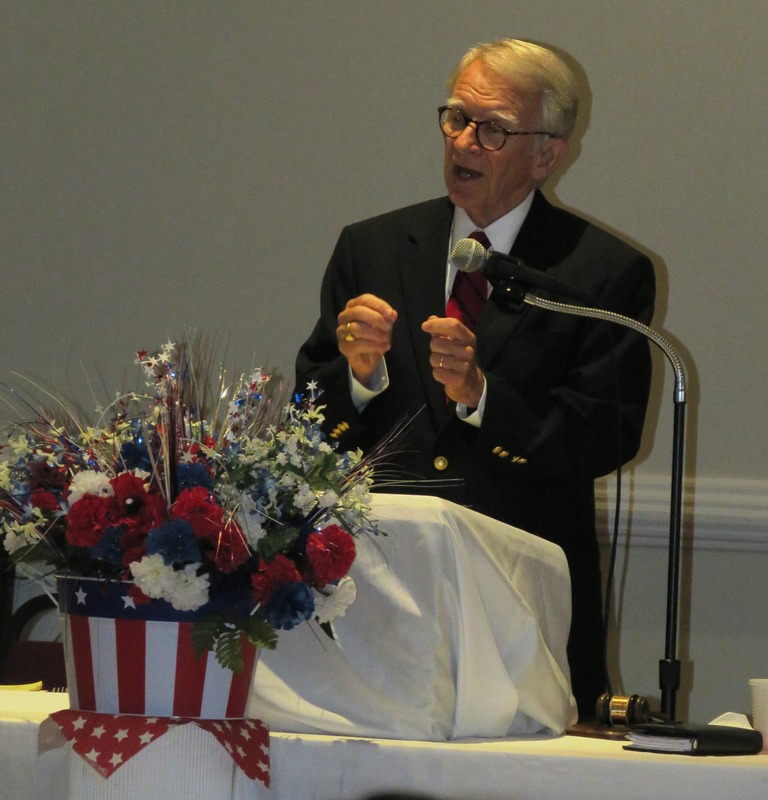 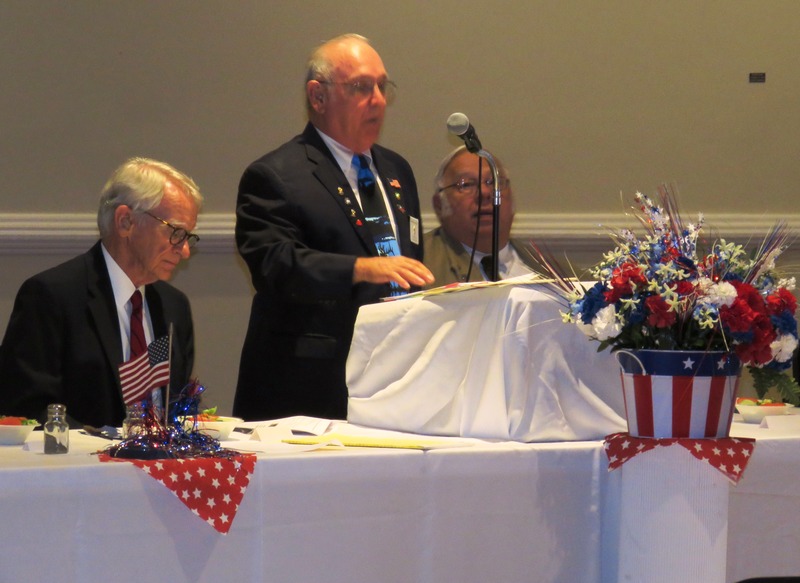 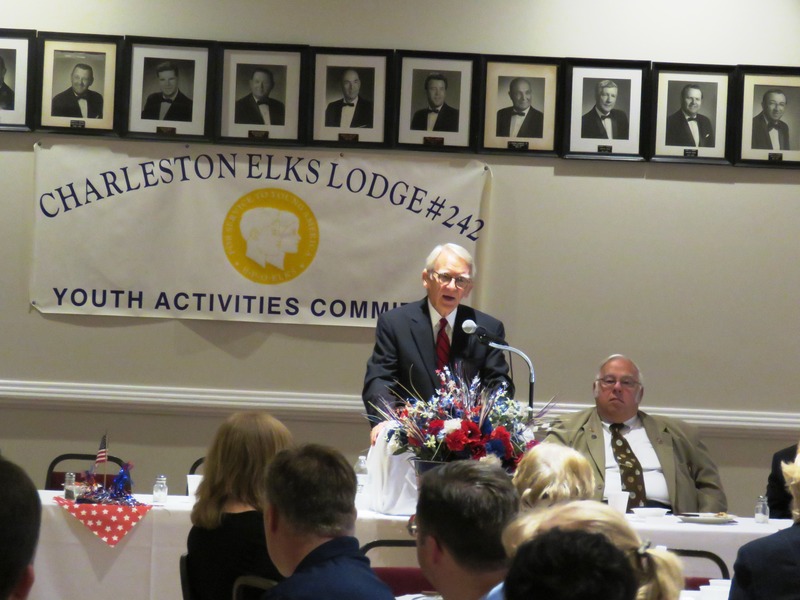 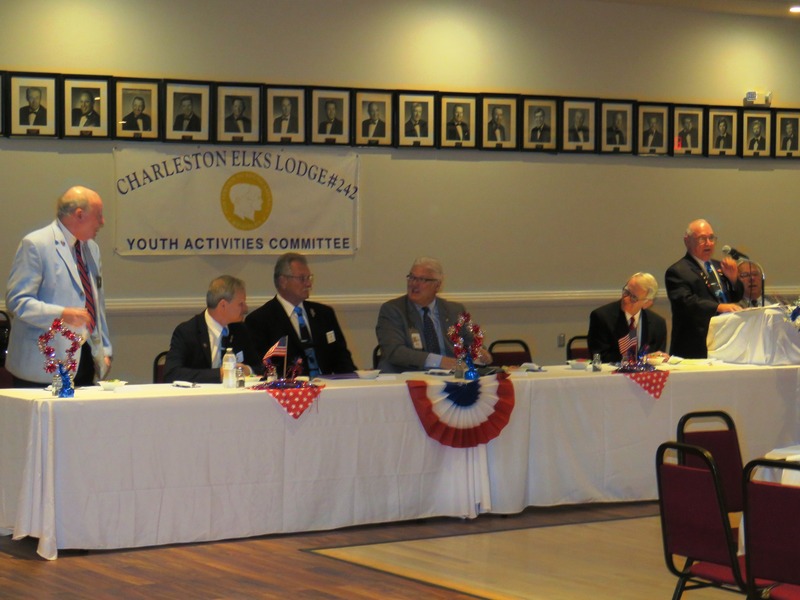 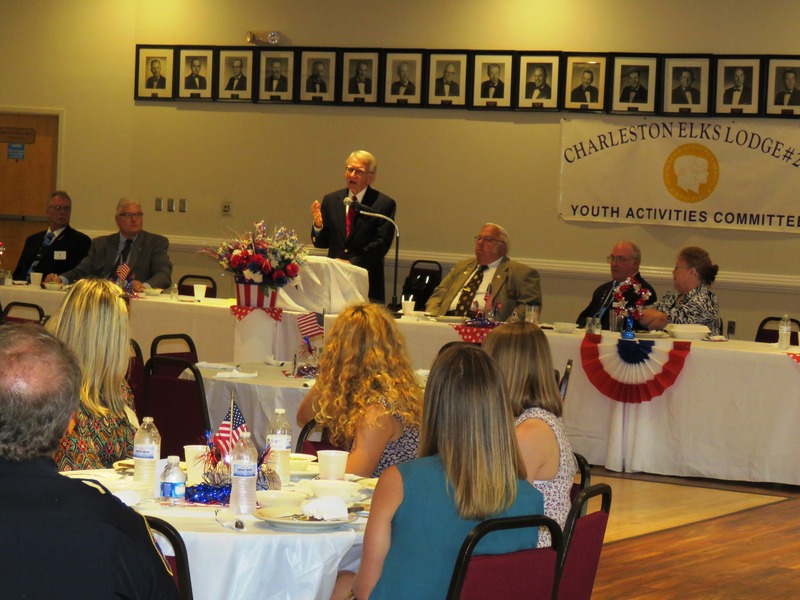 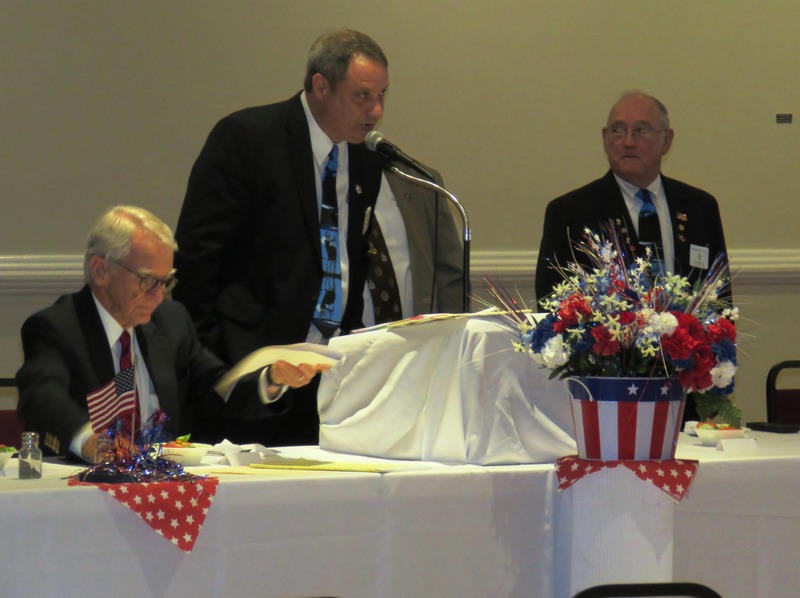 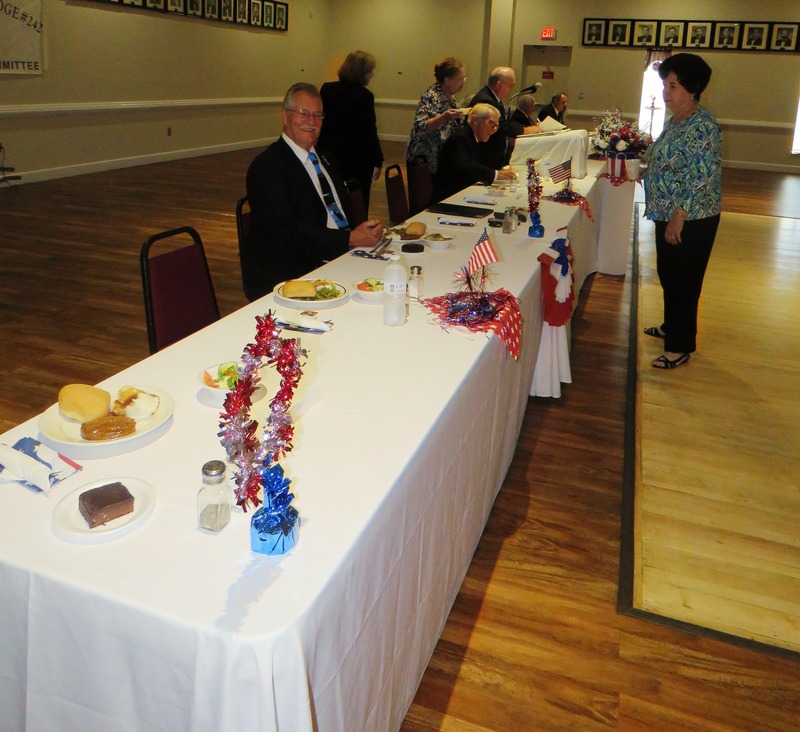 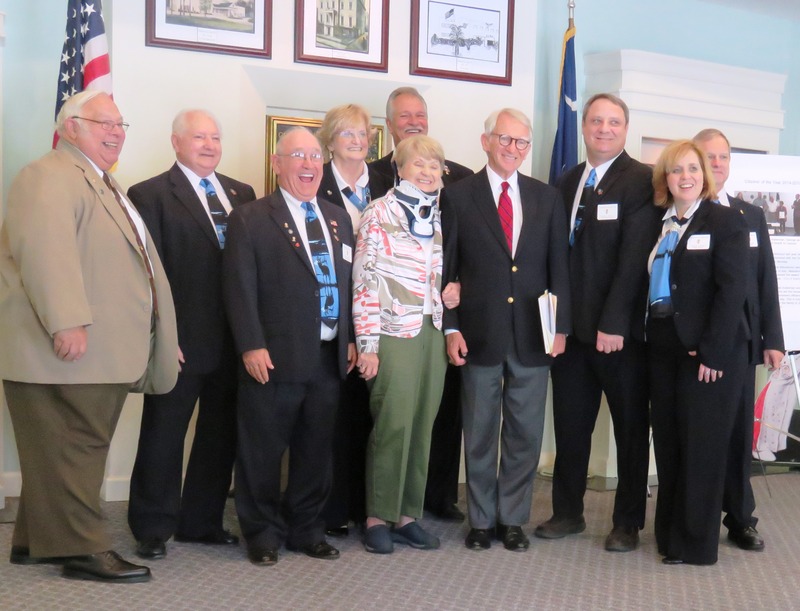 Charleston Mayor Joseph P. Riley, Jr. was the keynote speaker, and several Elks Members spoke also. Students were also invited to the podium to share about what they’d learned during the experience. 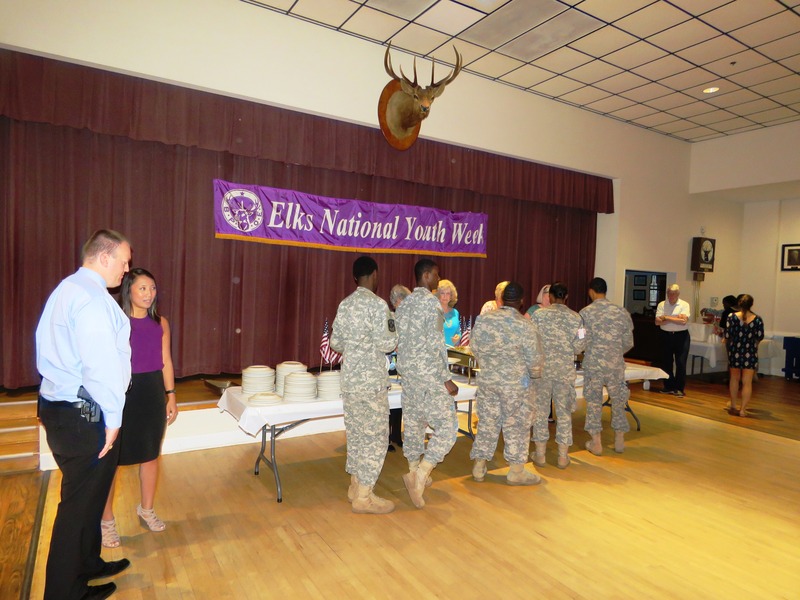 Special thanks to Jennie Sirisky and Tim Bussey for their excellent planning for the day, and all the other Elks members that made this amazing career exploration opportunity a reality for participating students. 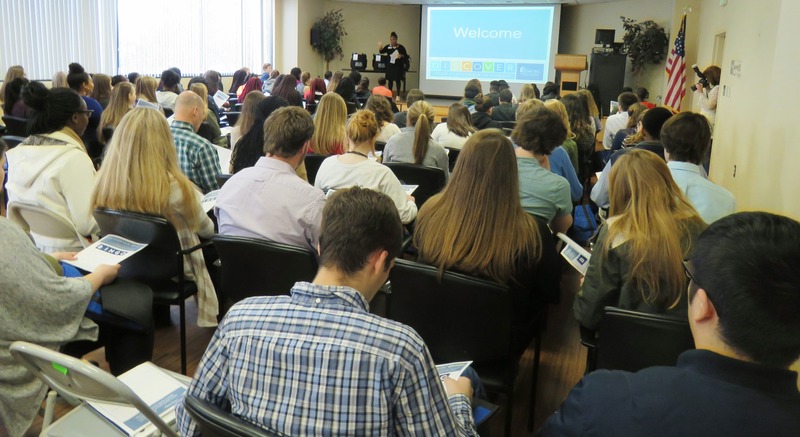 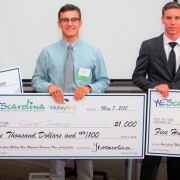 May 7, 2015 – Charleston, SC – Over $15,000 was awarded to student competitors as seed money yesterday at the 4th Annual Regional Business Plan Competition presented by Motley Rice. 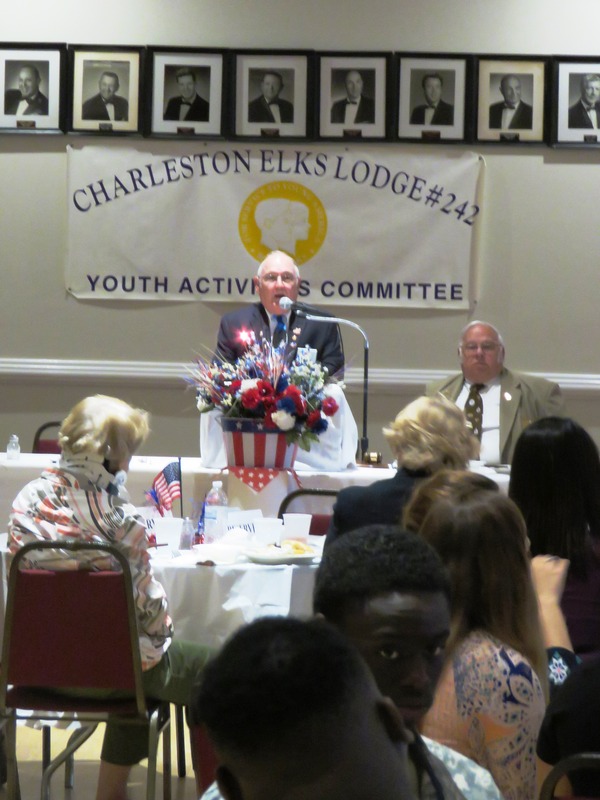 Through community partnerships with Motley Rice, MWV, Suntrust, Parker Poe, The Bakker Family, & The Exchange Club of Charleston,YEScarolina was able to award startup cash to thirty five young entrepreneurs that presented their ideas and innovations to judges throughout the day. 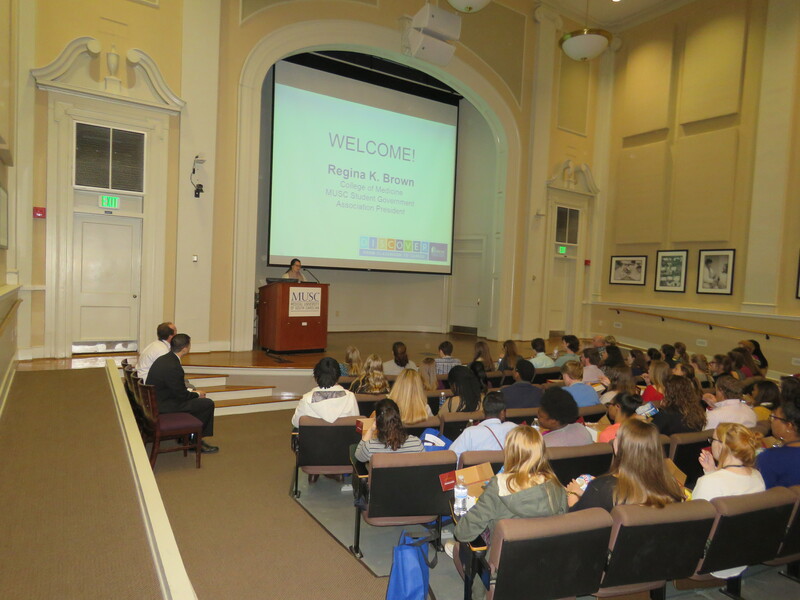 Hosted at the College of Charleston School of Business, future business owners competed in several rounds of competition before the six finalists landed themselves in the closing challenge round. The six local business leaders that made up the final judge panel were Earl Bridges of Good Done Great, Shauna VanBogart of Best Kept Self, Rebecca Vaughan of MeadWestVaco, Badge Humphries of Lewis Babcock Griffin Attorneys, Will Jamieson of Geekin Ventures, & Josh Wright of Merrill Lynch. 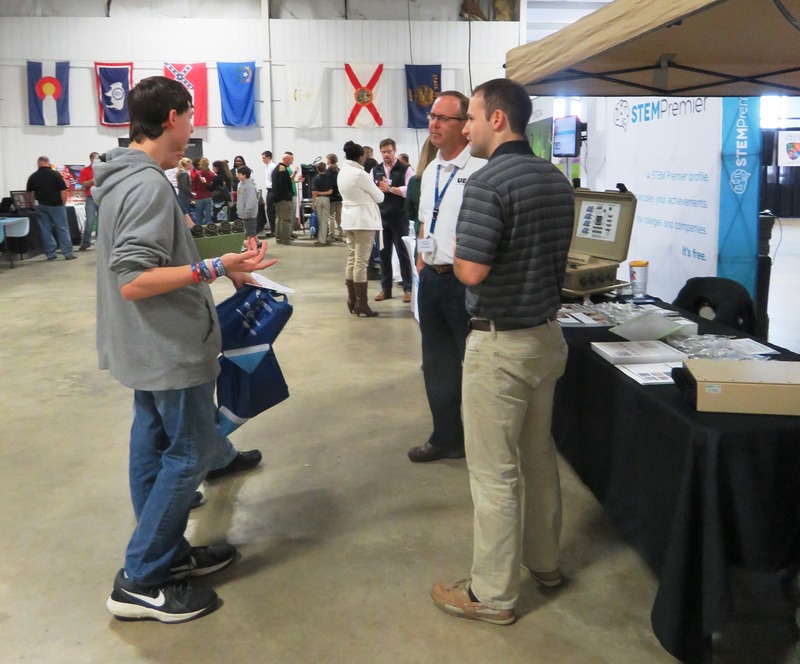 Connor Simonson, a senior at Wando High School, won the coveted first place prize of $1,000 for his innovative business idea, Deep Fried Dyes. 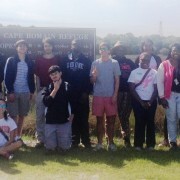 Connor moved to Mt. 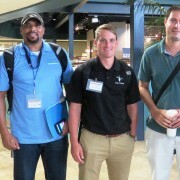 Pleasant, SC from Seattle, WA just one year ago and his enthusiasm for lacrosse followed him. 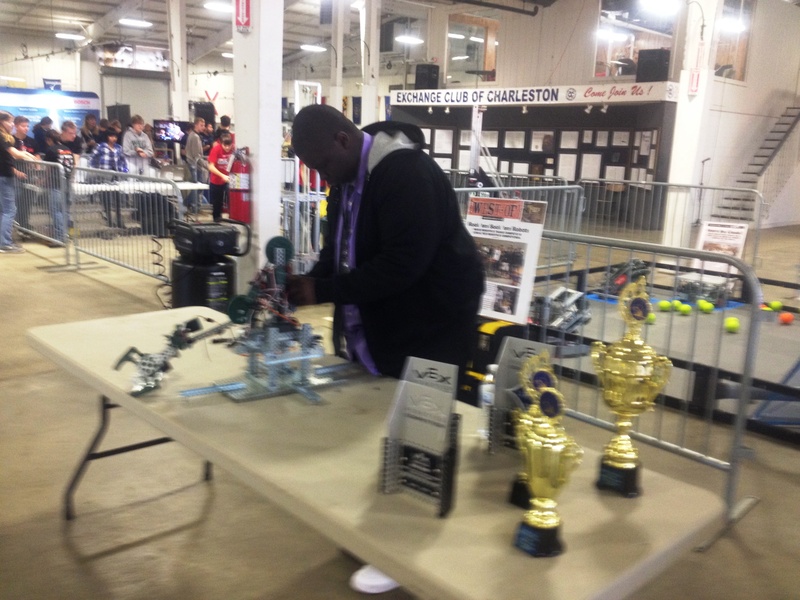 His business provides lacrosse players with professional string and dye jobs. 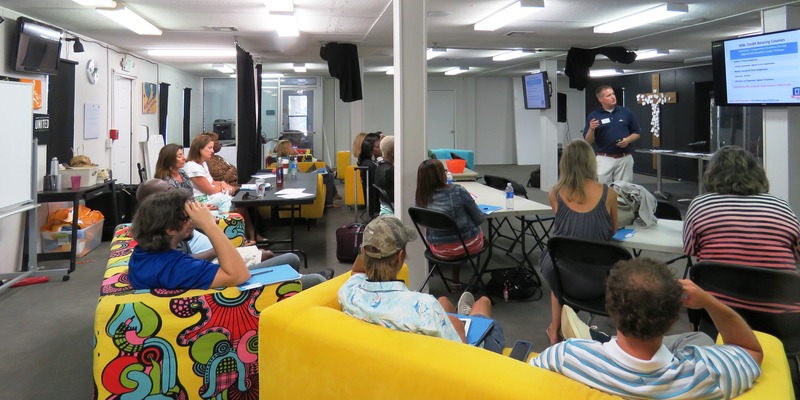 Since fourth grade Connor has been playing lacrosse and his passion for the sport is evident in his business plan presentation and daily life. 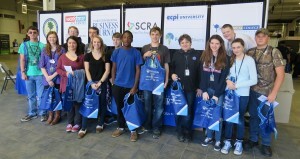 Second place prize of $500 went to Matthew Root of James Island Charter High for M&B ATM LLC. 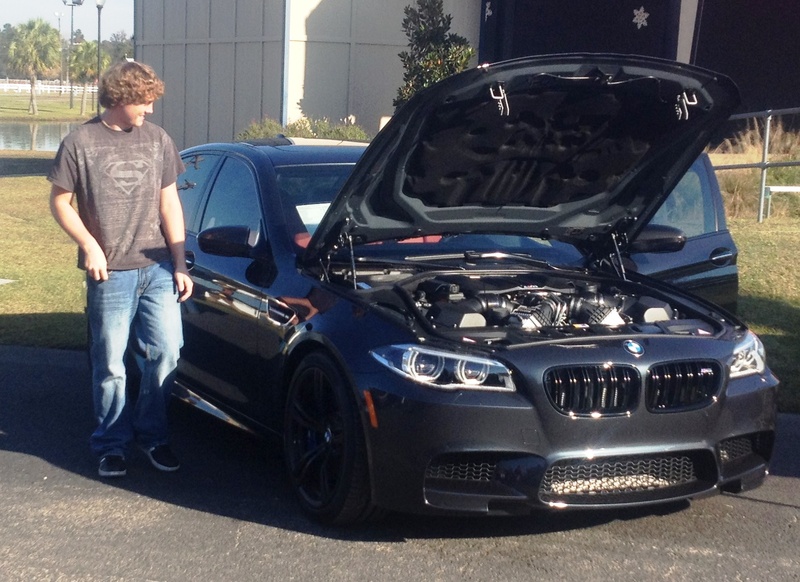 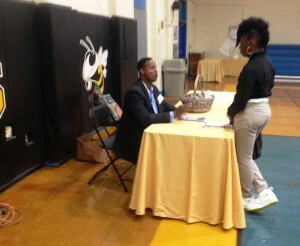 Matthew has been an entrepreneur since birth! 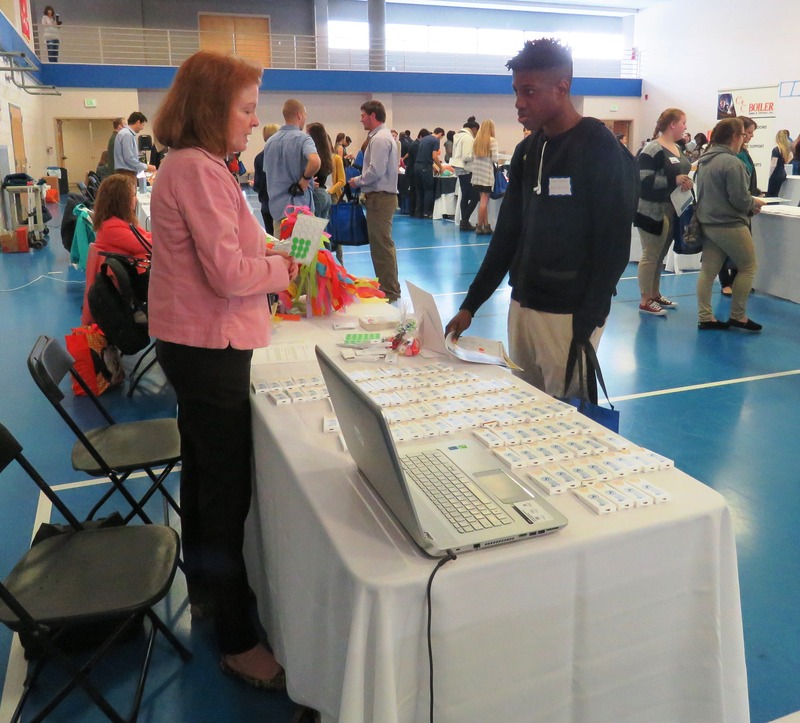 He is constantly networking and there is no doubt we will see him as a future business leader in our community and beyond. 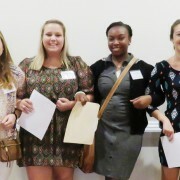 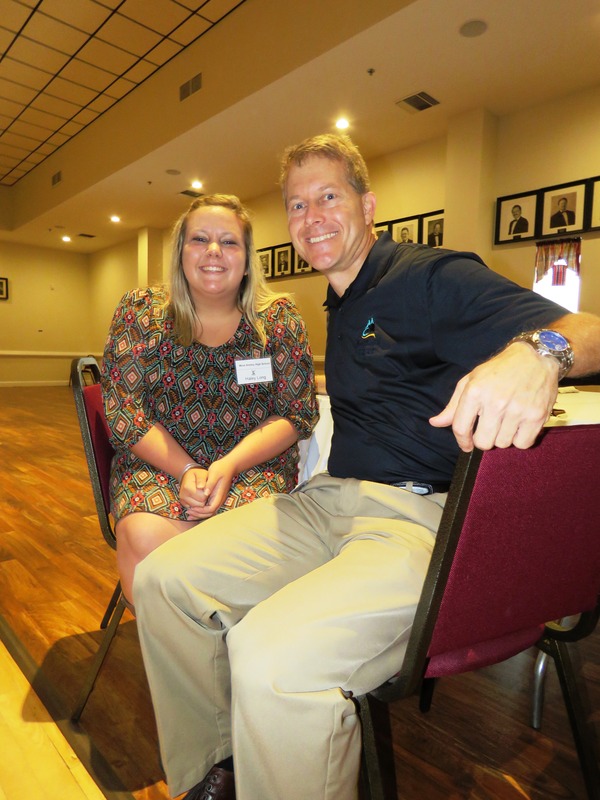 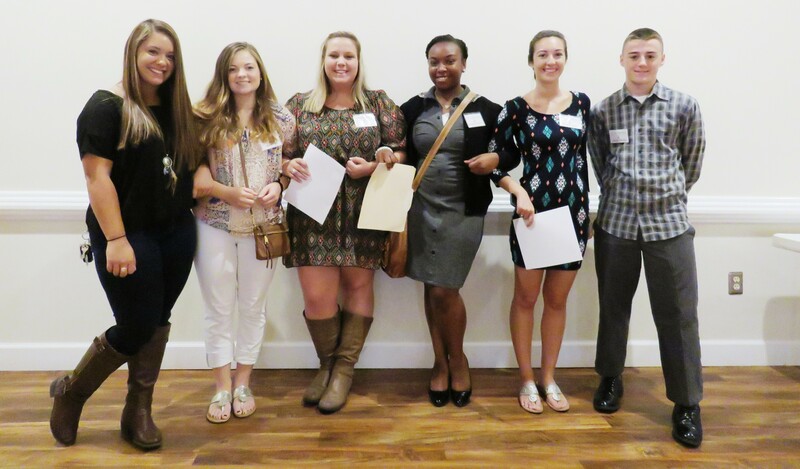 Maddy Bessinger of West Ashley High School won the third place prize of $250 for her business Eat, Sit, Play. 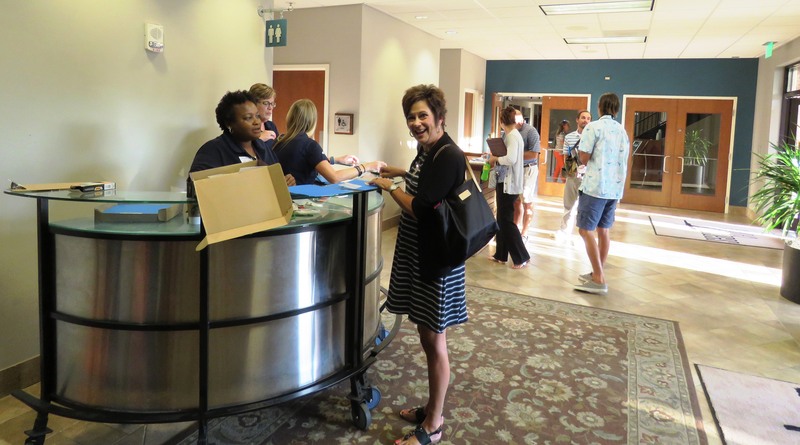 Maddy has been running her business for several years and her clients have nothing but positive things to stay about her pet sitting service. 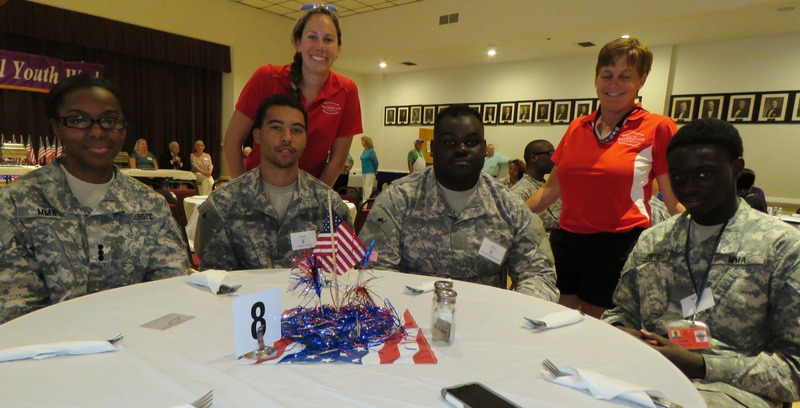 The runners up were Hunter Price of West Ashley High School for Bag-a-Field, Kinley DuRant of James Island Charter for MMM Services, & Christian Davis of Ashley Ridge High School for Cultural Cooks. 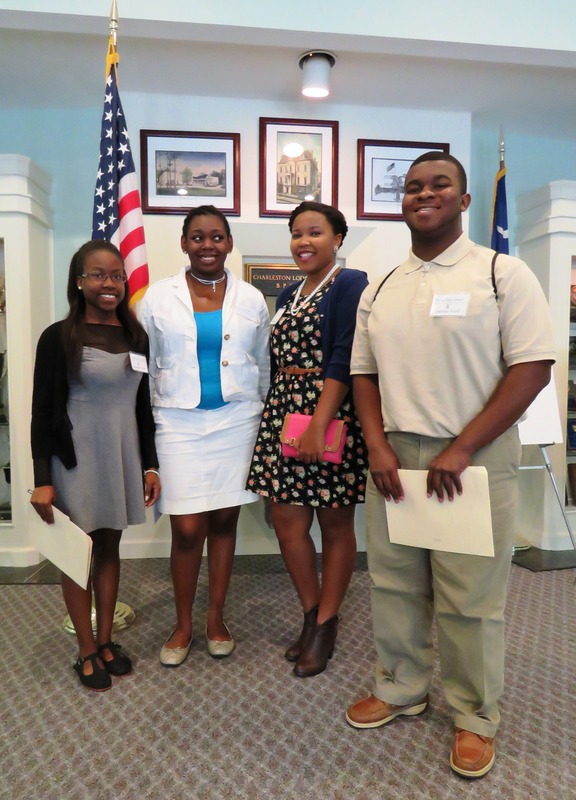 These six young entrepreneurs now advance to the State Business Plan Competition presented by the Mark Motley Foundation June 17th at the College of Charleston School of Business in addition to twelve students from around the city and state. 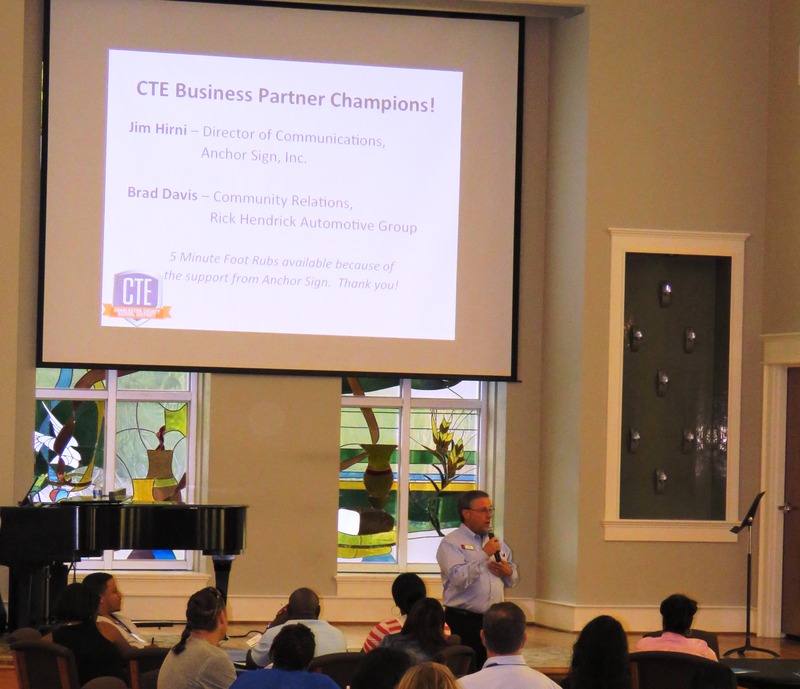 The public is encouraged to attend and watch the entrepreneurship challenge finals at 5:30 pm where the first place winner will receive $3,000, second place $2,000, & third place $1,000. The first place winner will also advance to the NFTE National Challenge. 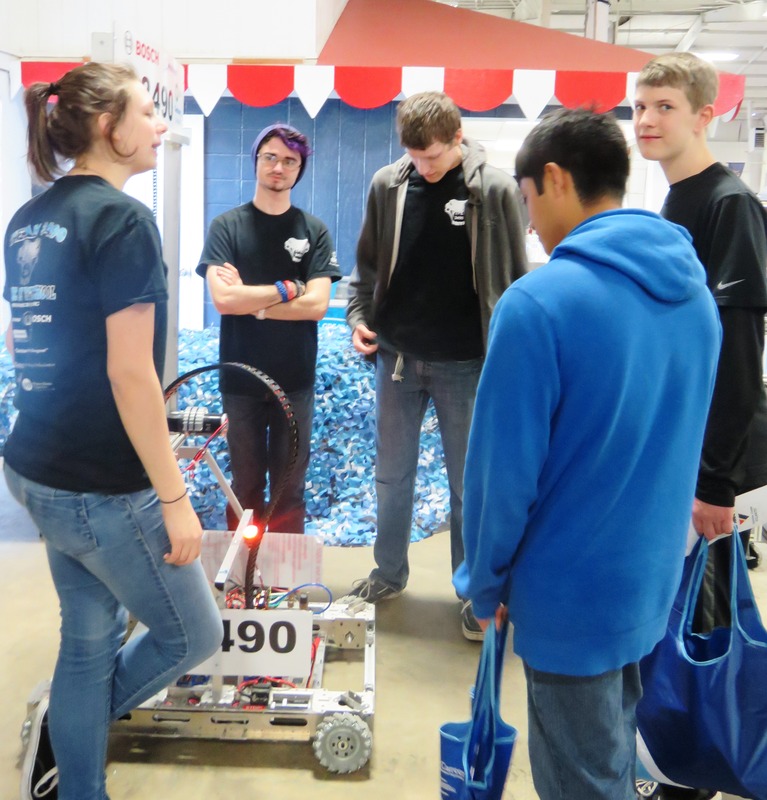 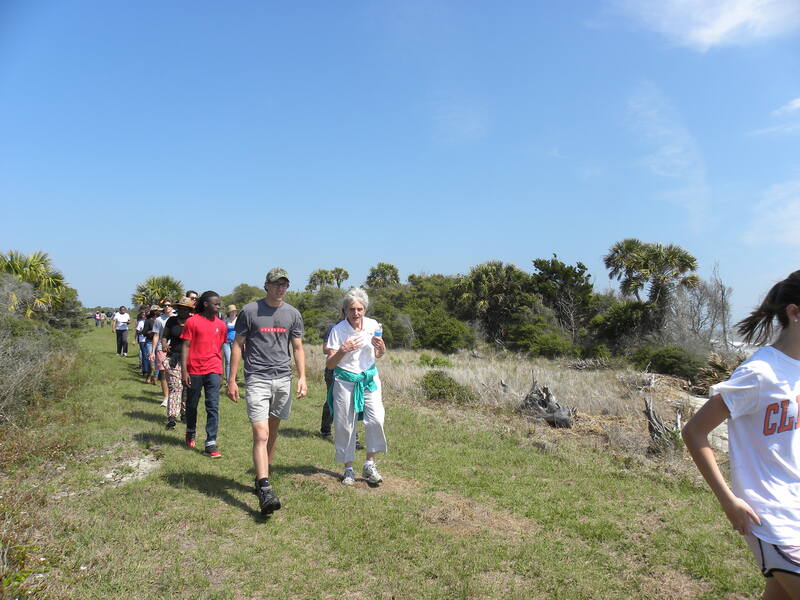 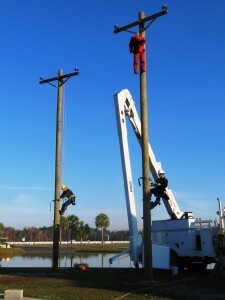 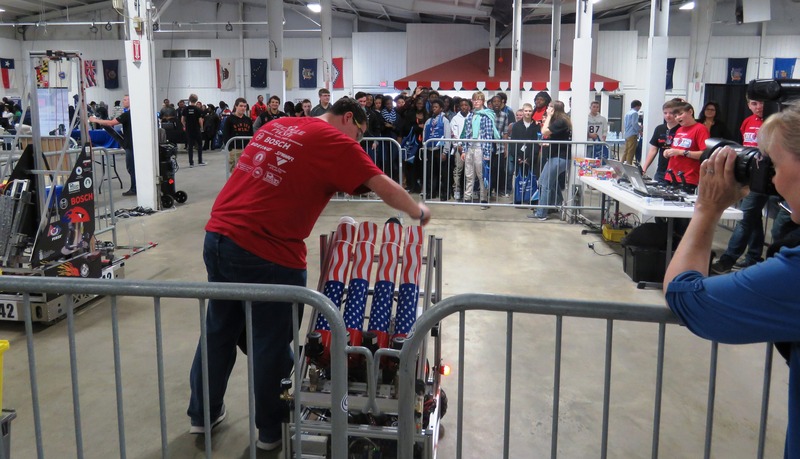 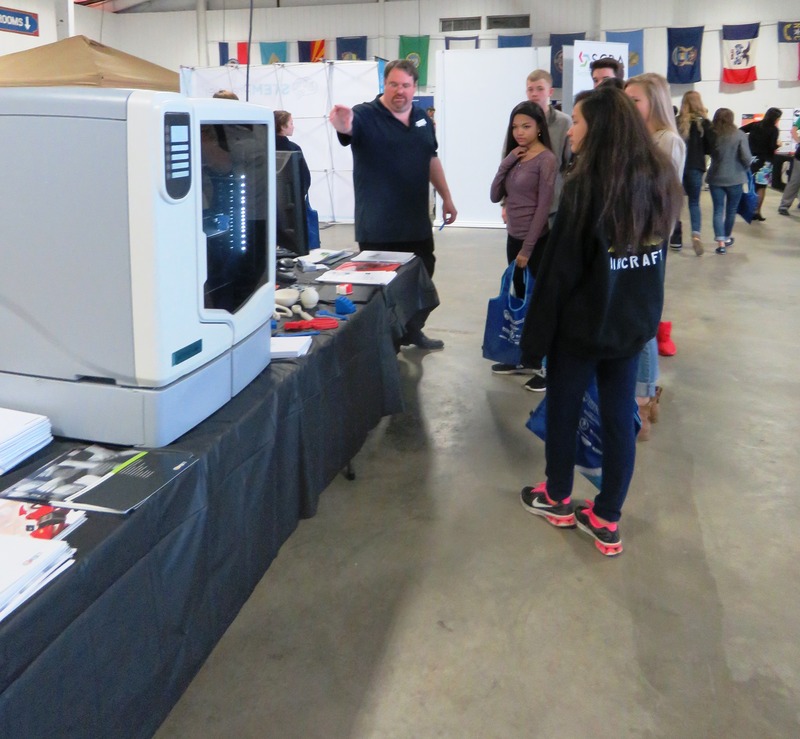 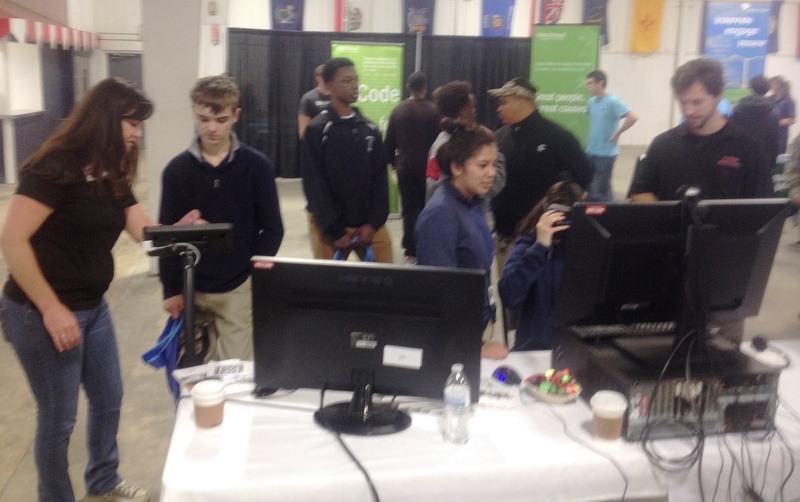 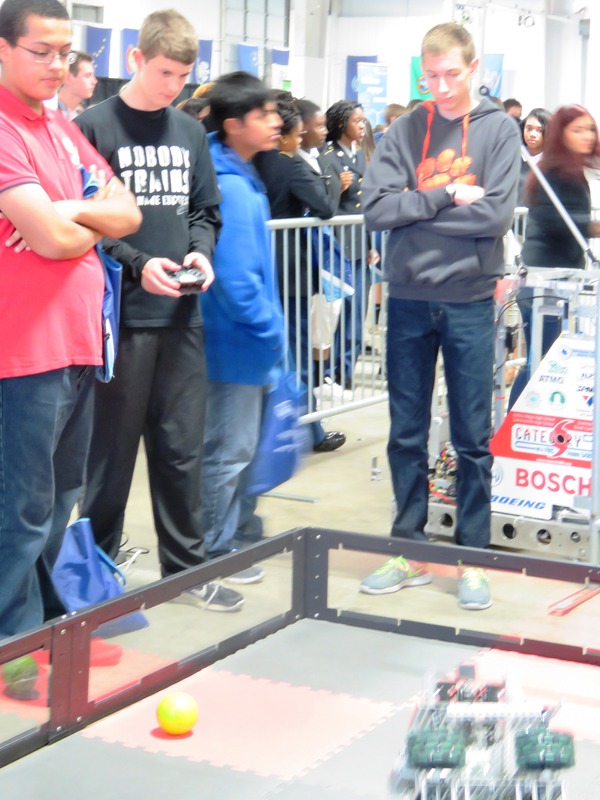 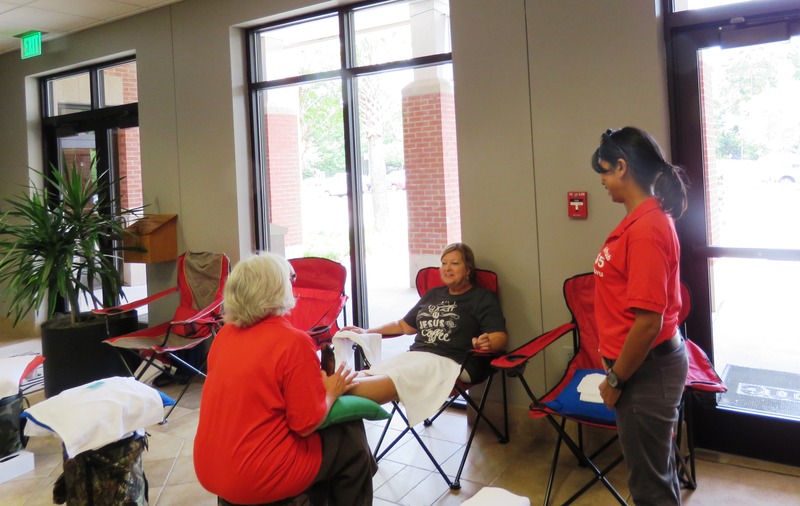 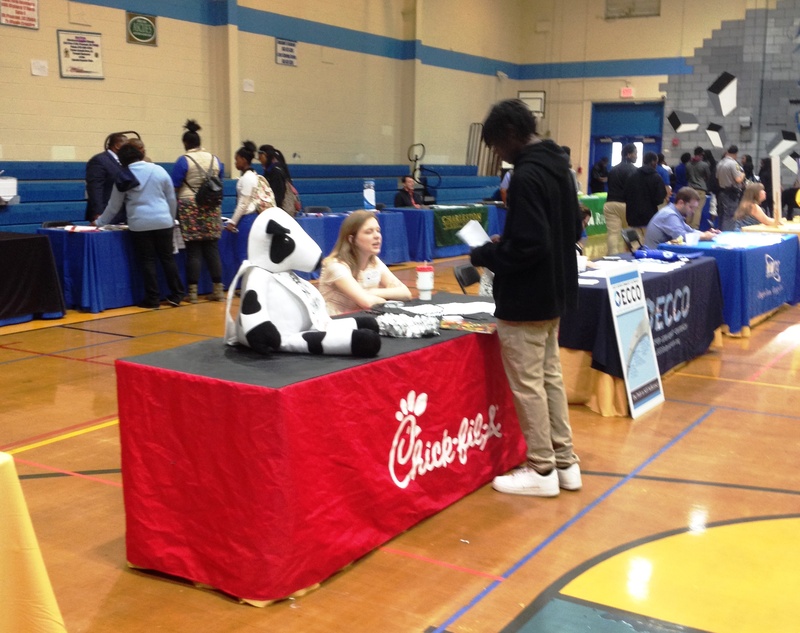 Other CCSD schools with students participating in this event included St. Johns High School, Lincoln Middle-High School and Baptist Hill Middle-High School. 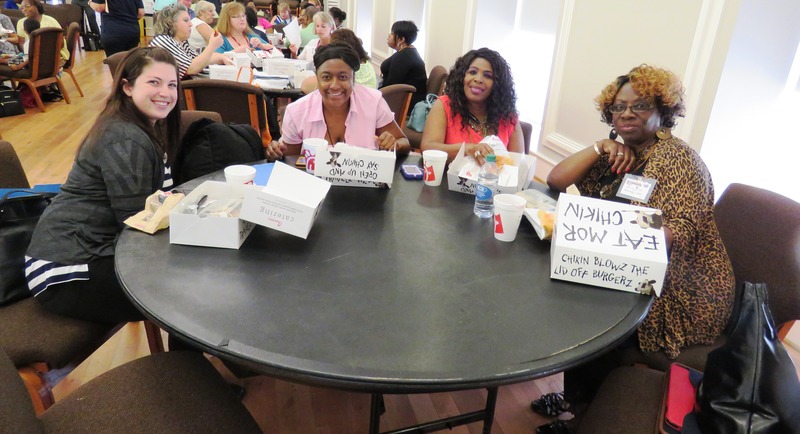 Picture above by Boncek Images – Top 3 winners of Regionals w/ Becky Vaughan of MWV & Yescarolina board member, YEScarolina Vice President Harriett Lee, and YEScarolina Program Coordinator Molly Crete. 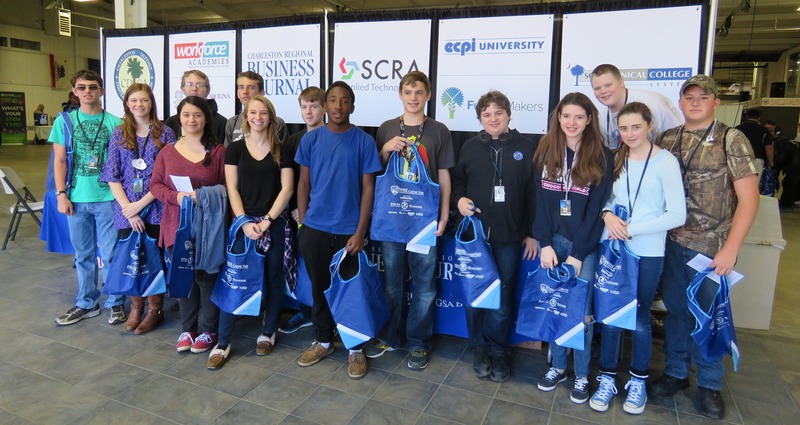 YEScarolina, a 501(c)3 non-profit, is the only organization in the state of South Carolina dedicated to teaching youth the principles of entrepreneurship and free enterprise. 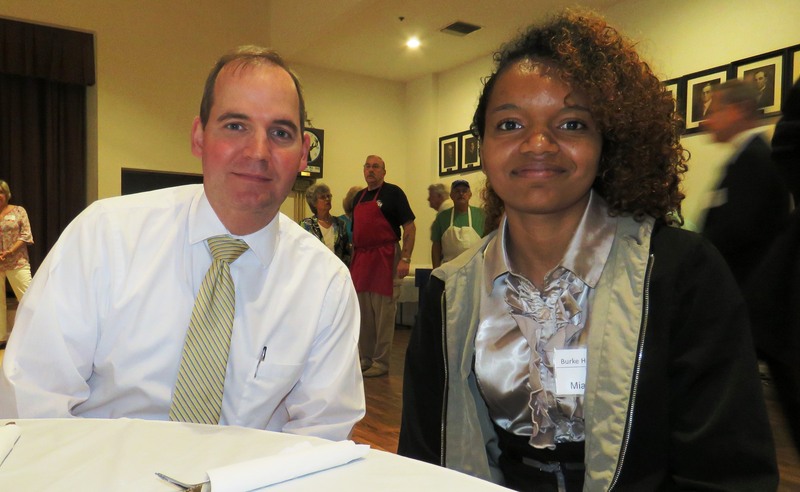 YEScarolina has helped thousands of young people from communities statewide build business skills and unlock their entrepreneurial creativity. 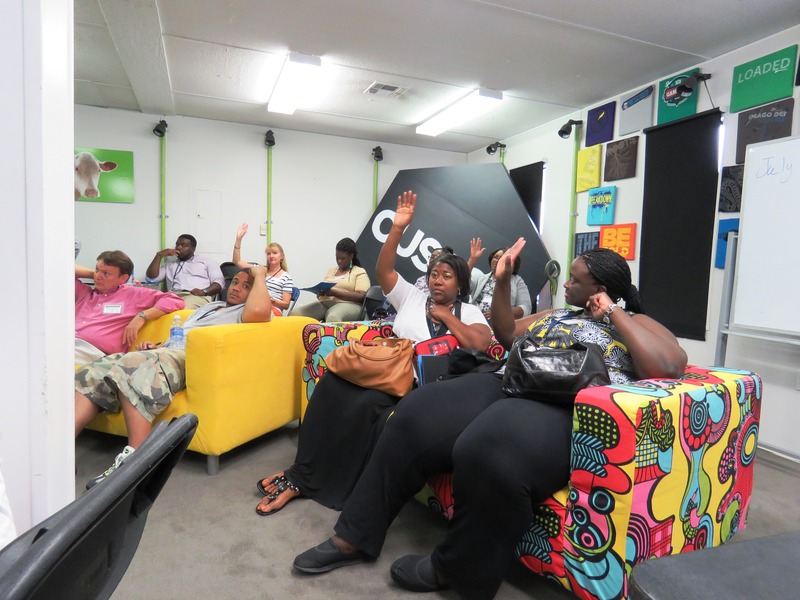 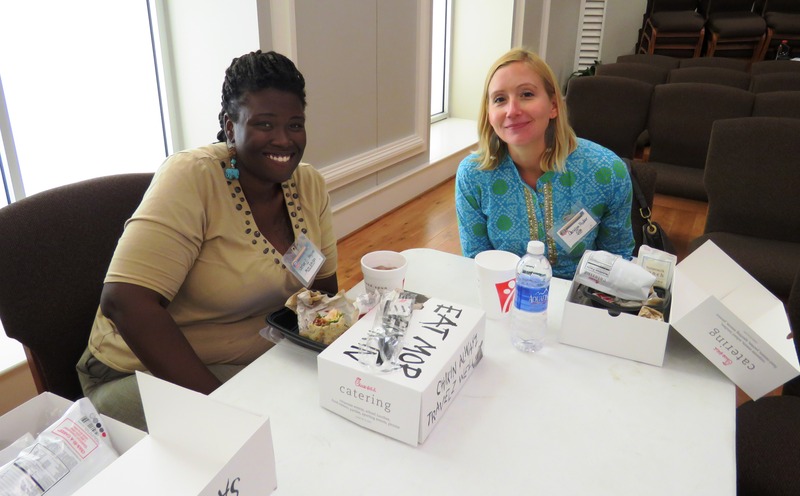 To date, YEScarolina has trained and certified over 725 South Carolina teachers, free of charge, on the subject of entrepreneurship. 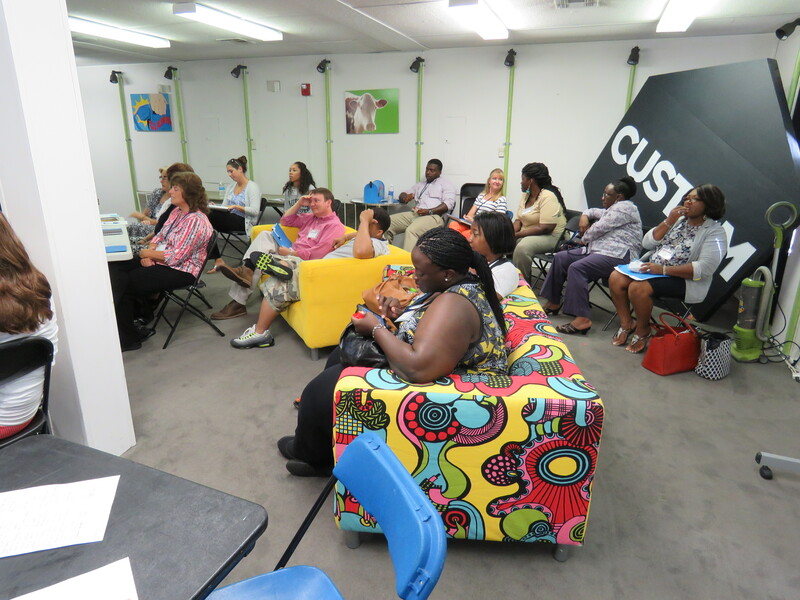 These educators in turn have touched and inspired thousands of young South Carolinians with a thirst for entrepreneurship. 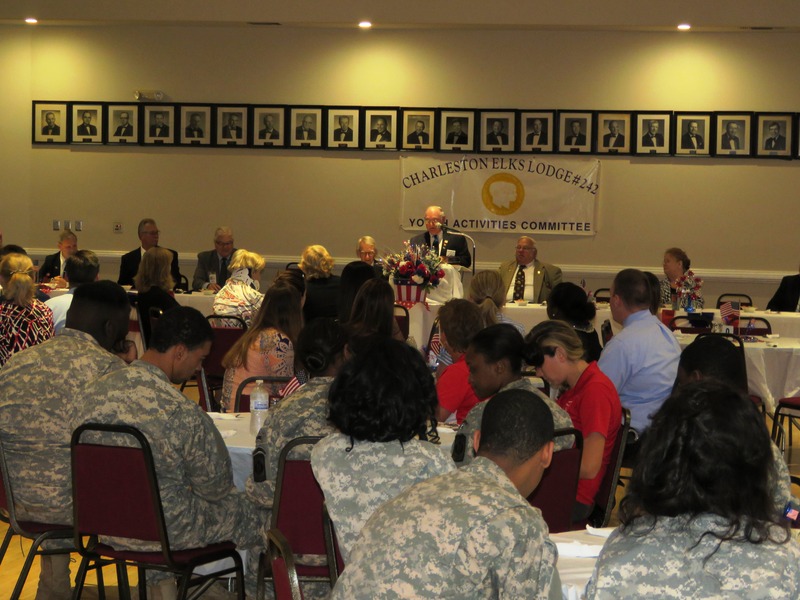 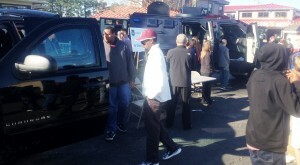 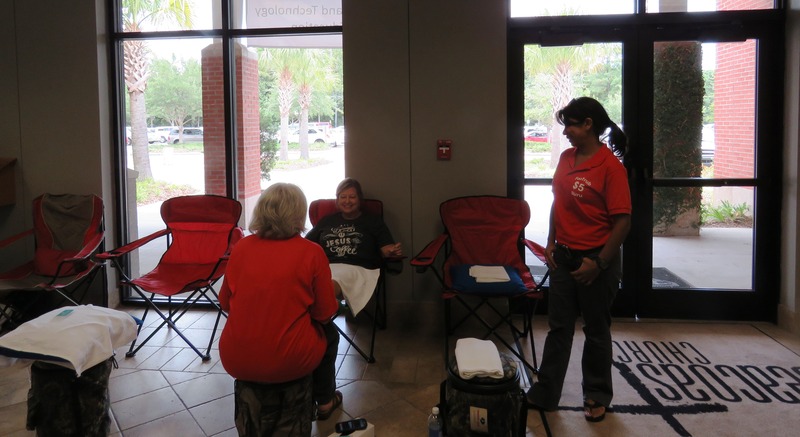 Contact Harriett Lee for more information hlee@yescarolina.com or 843-556-1909. 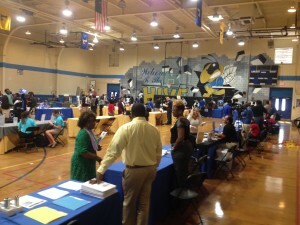 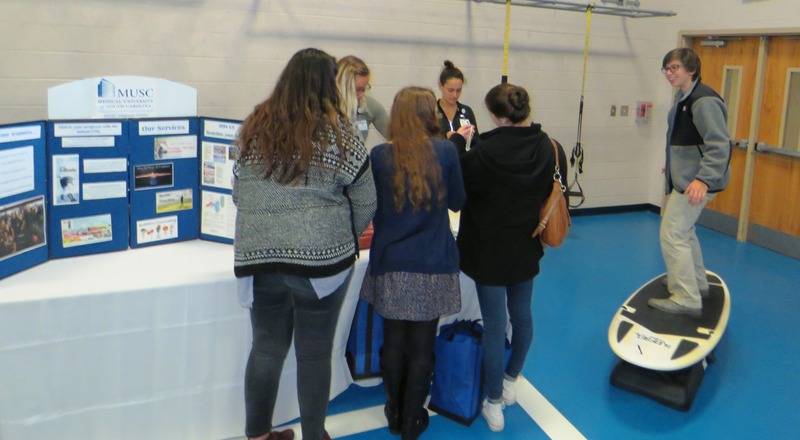 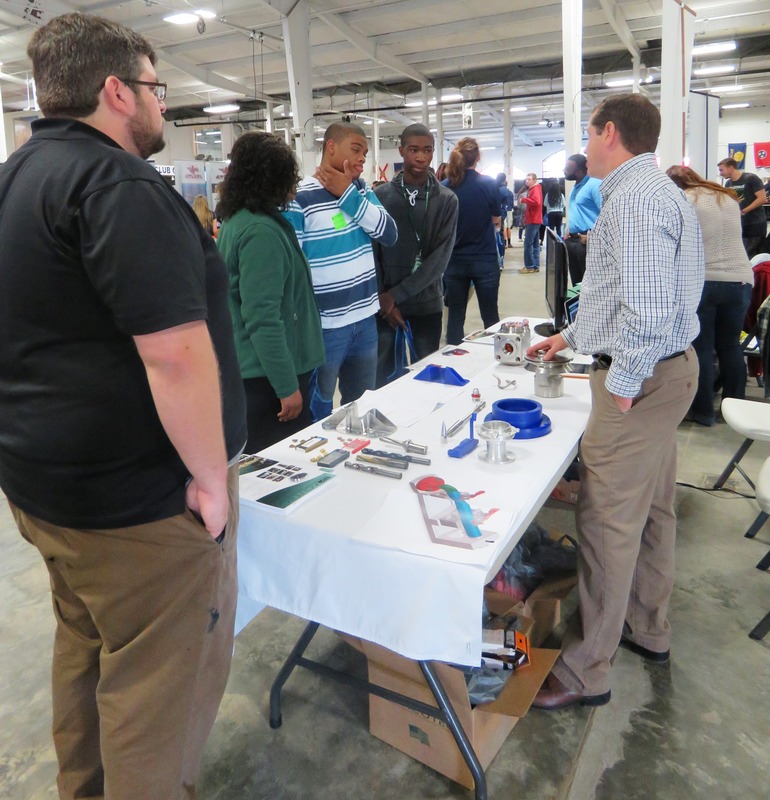 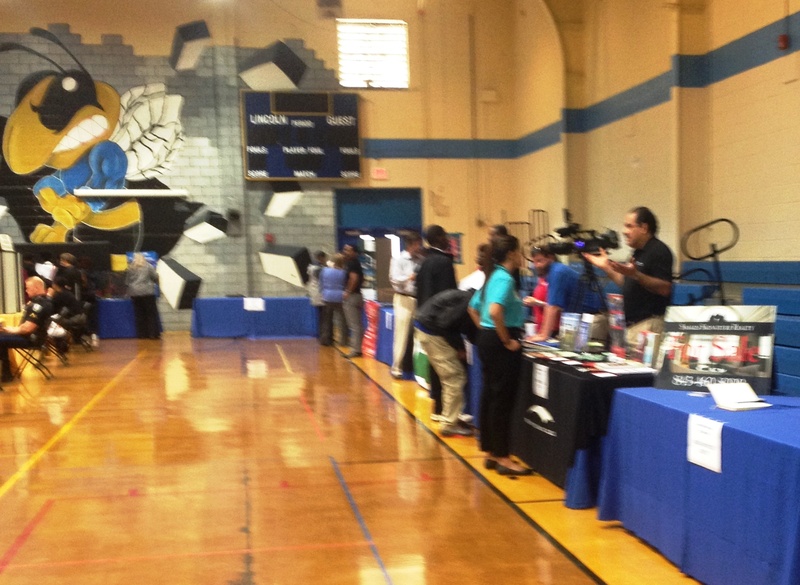 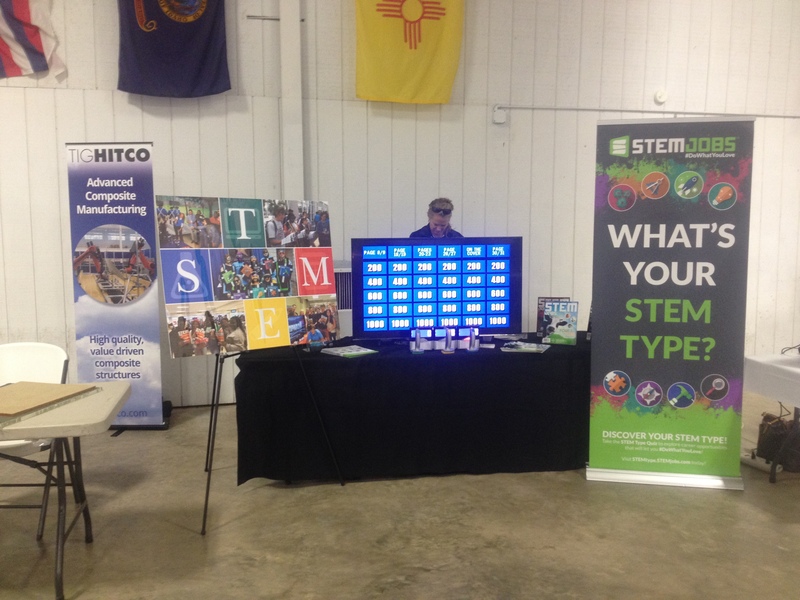 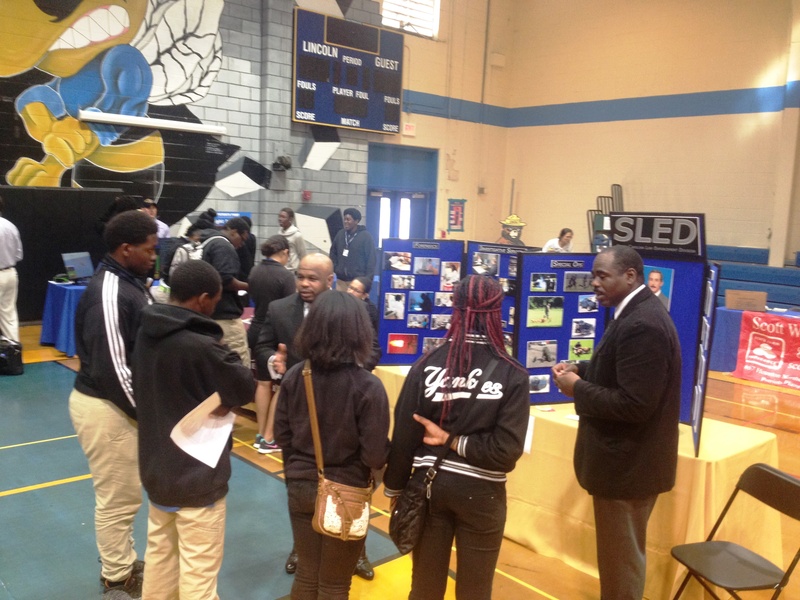 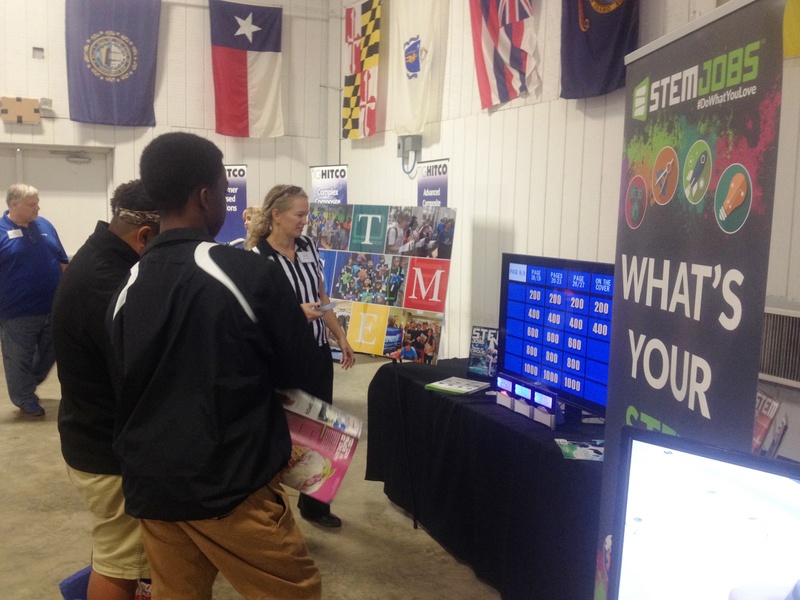 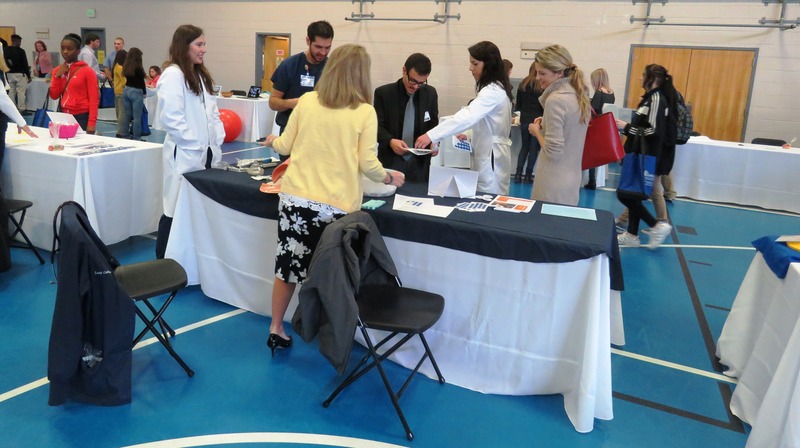 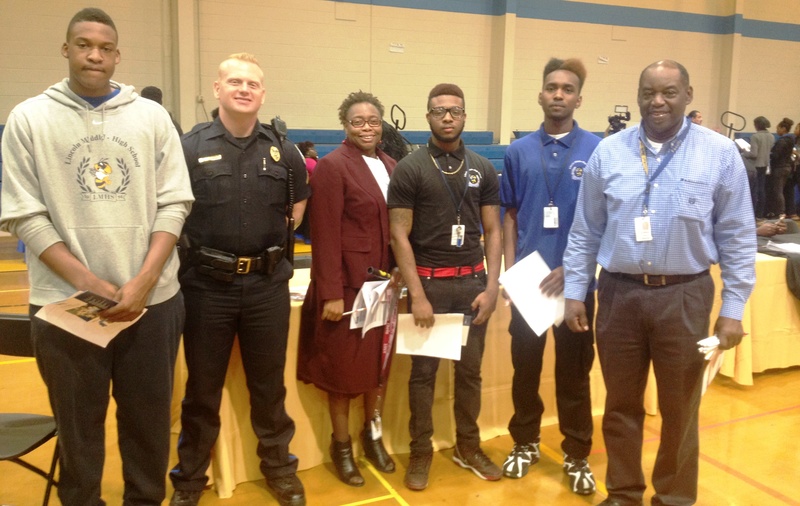 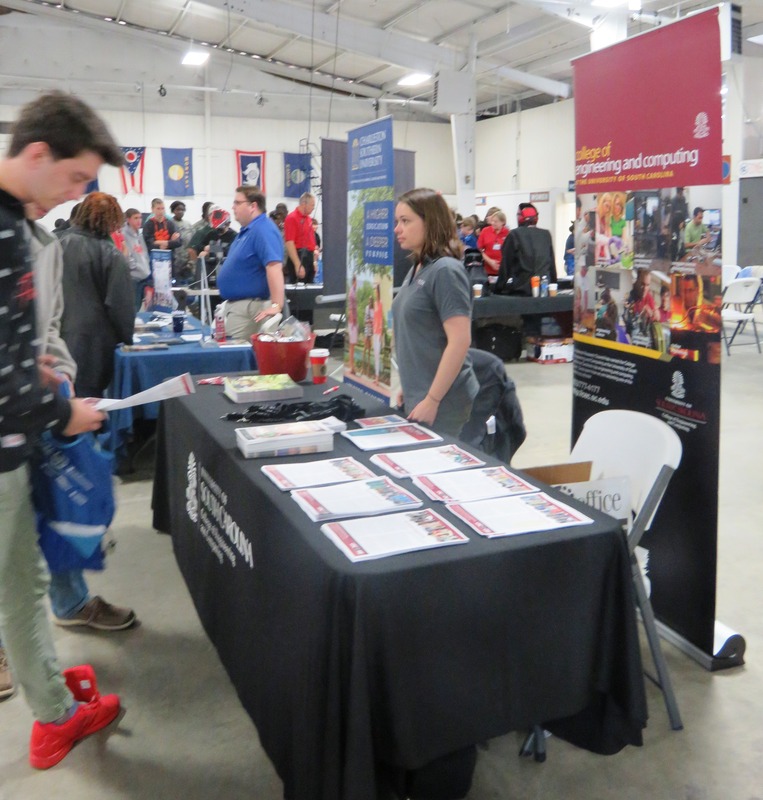 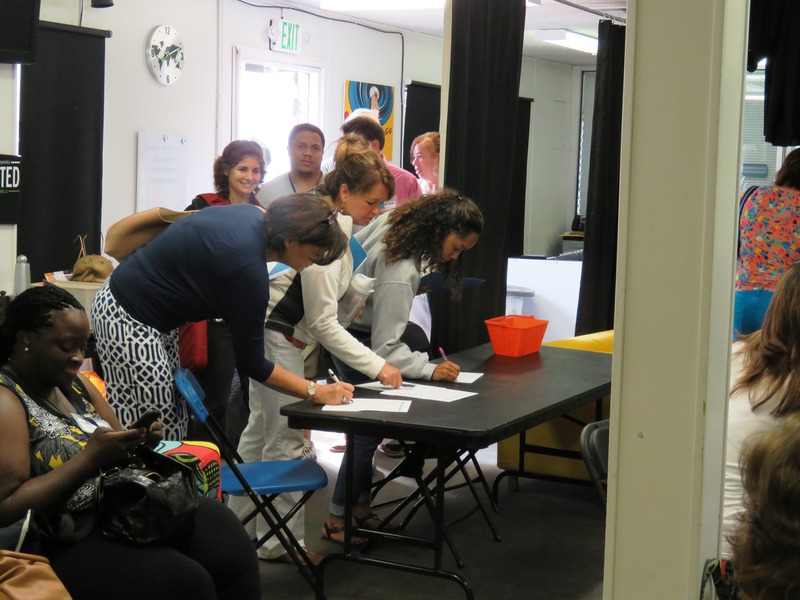 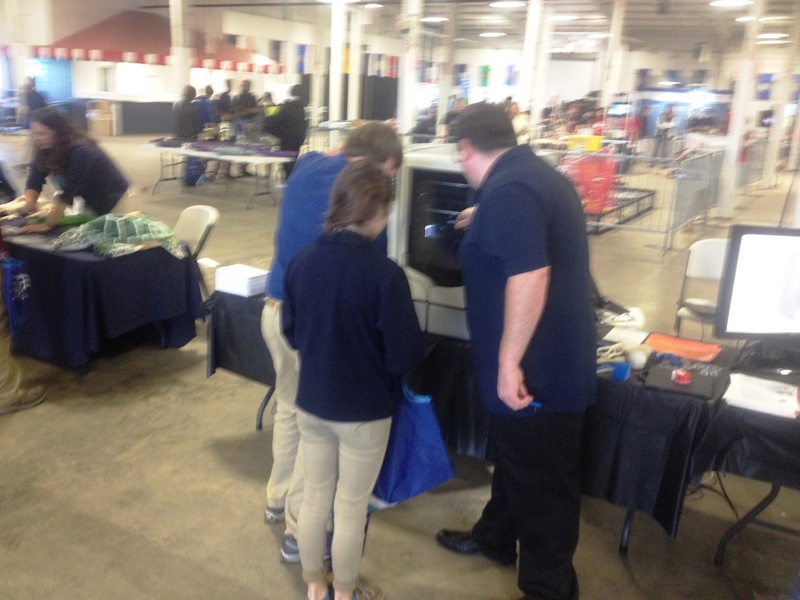 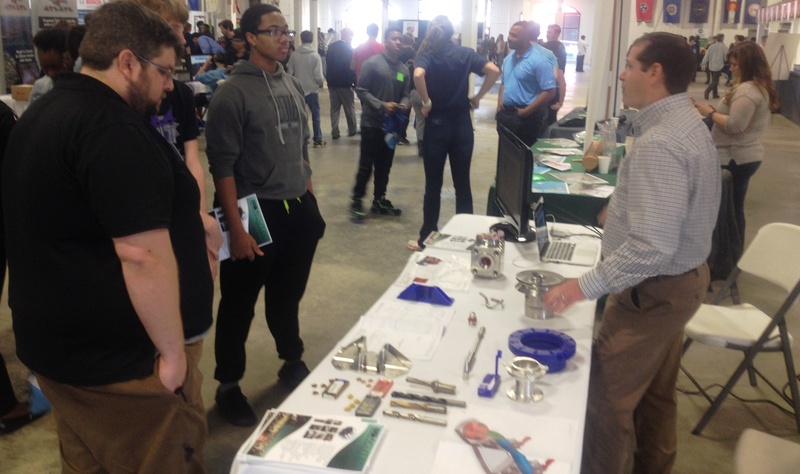 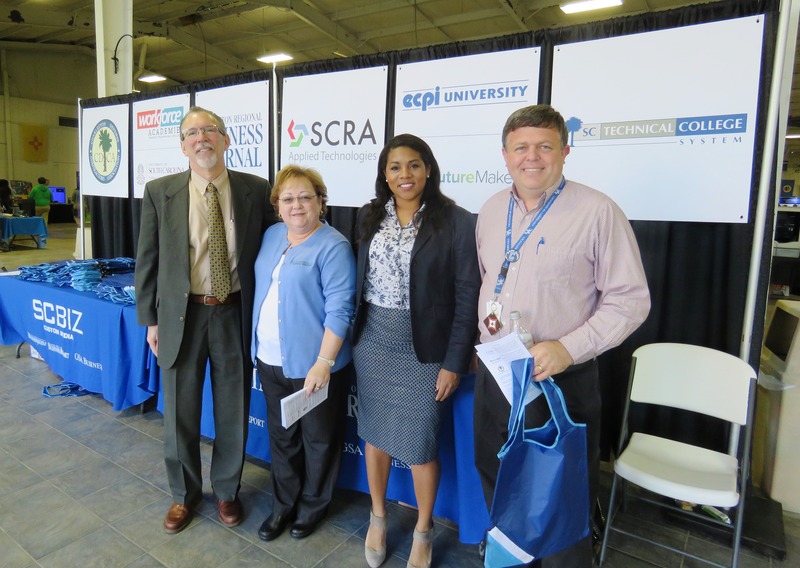 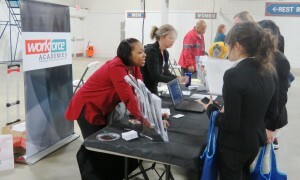 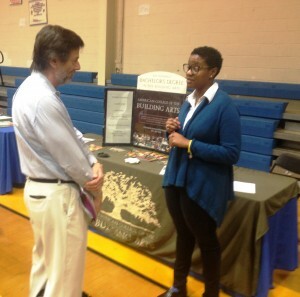 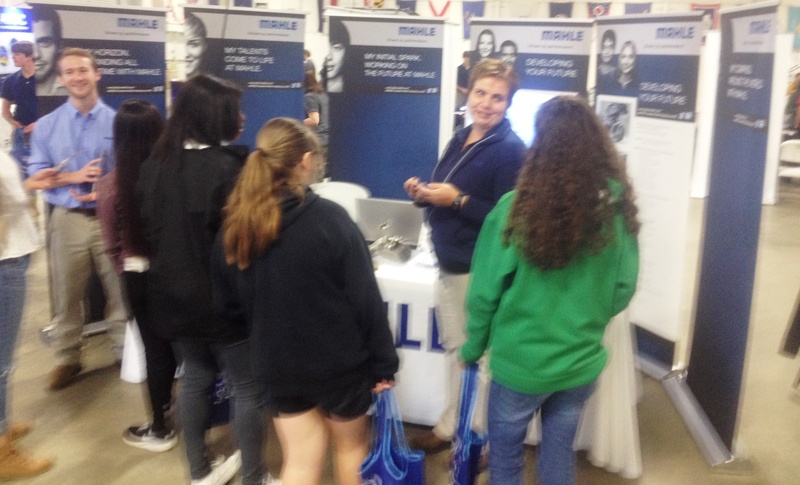 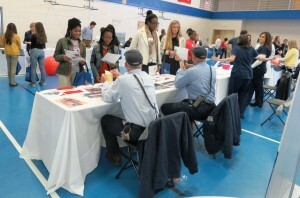 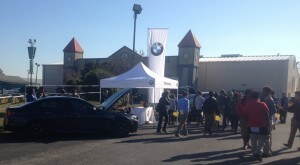 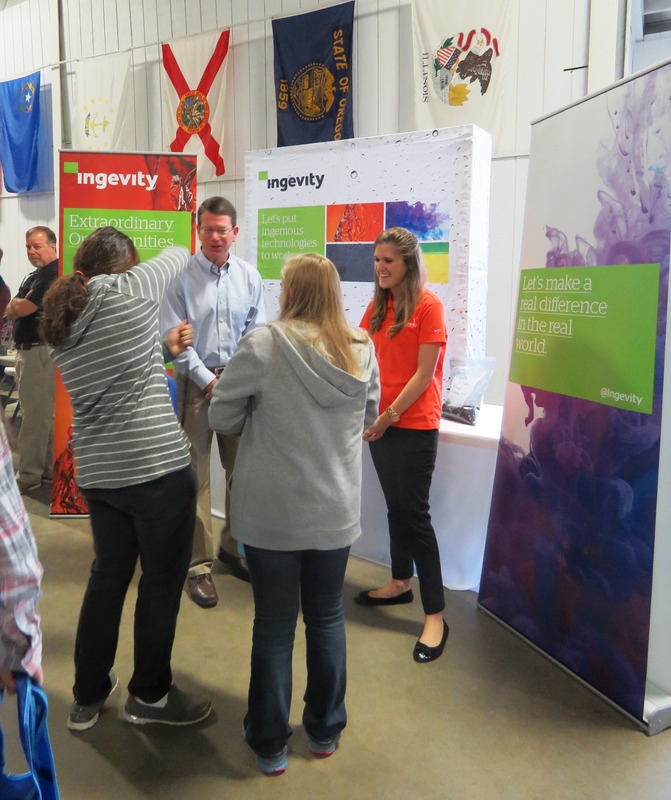 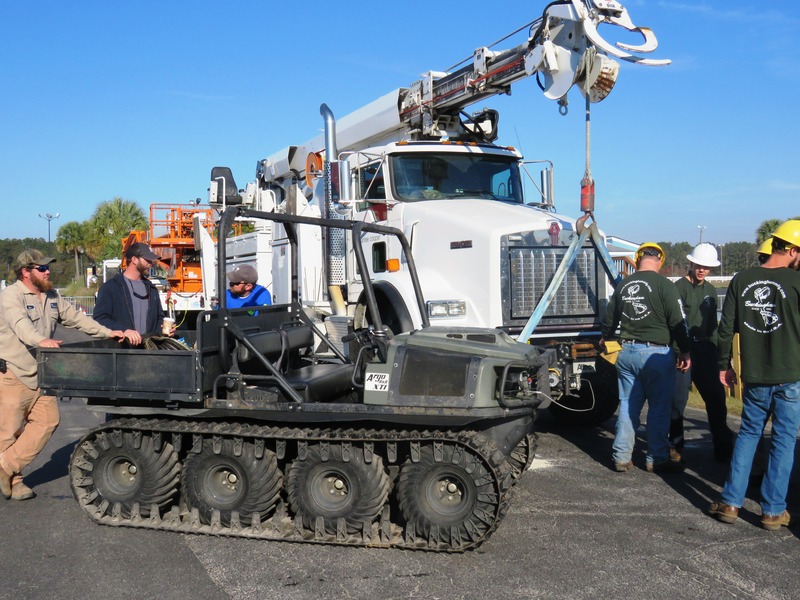 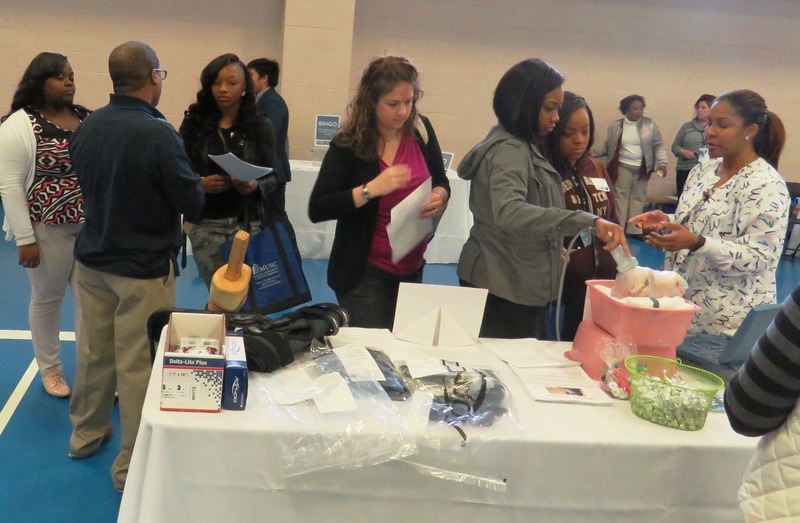 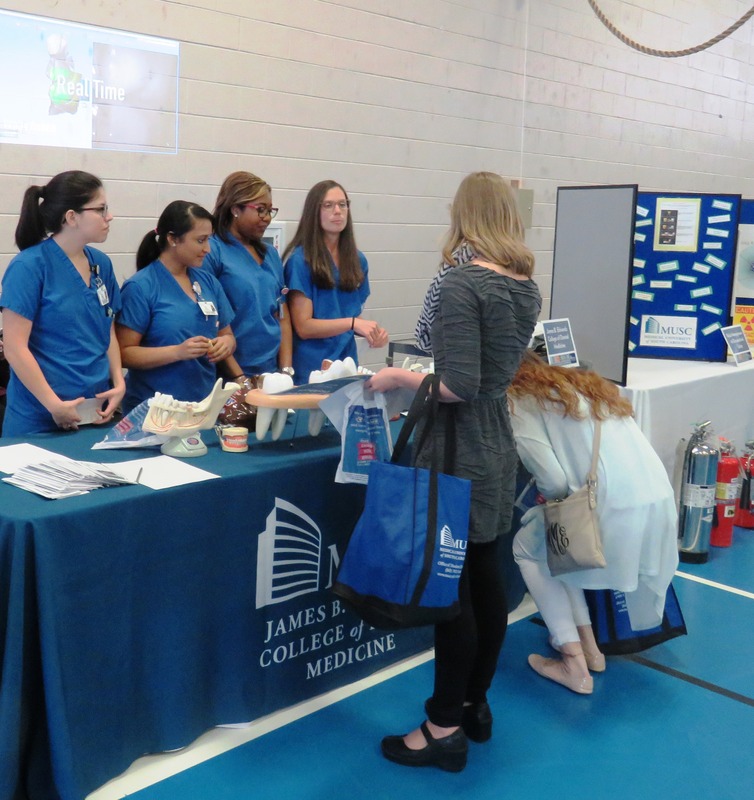 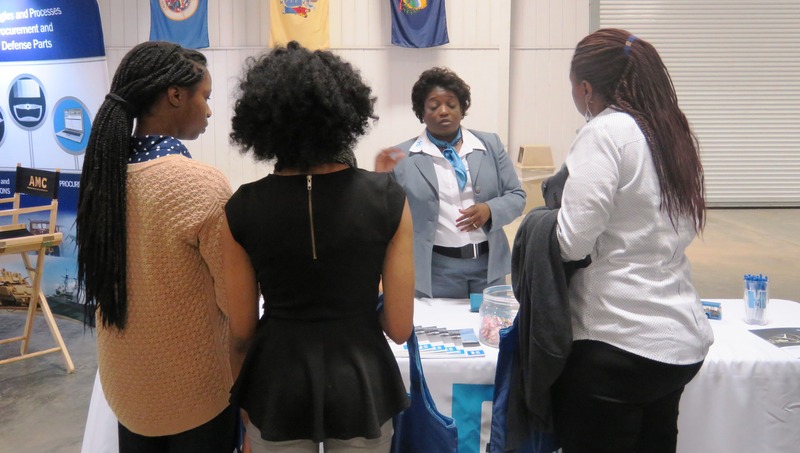 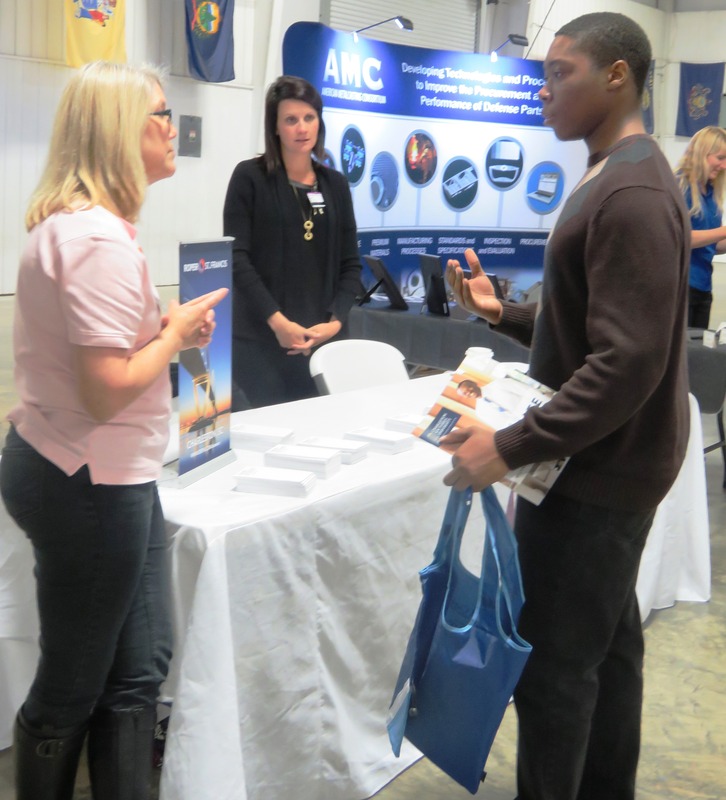 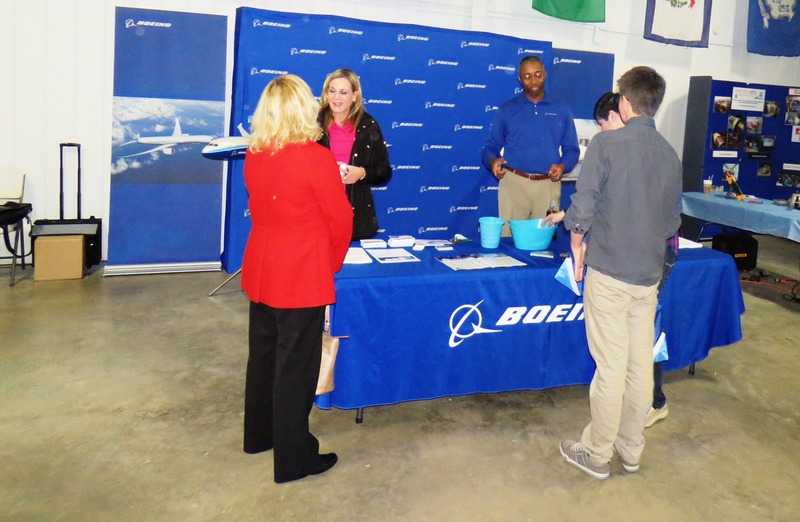 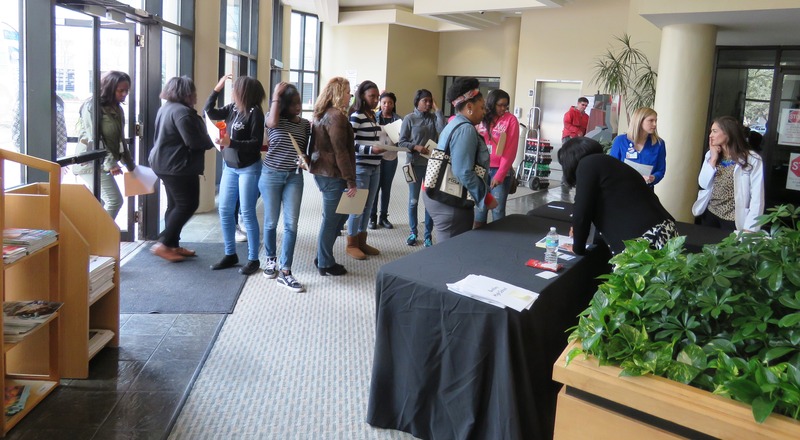 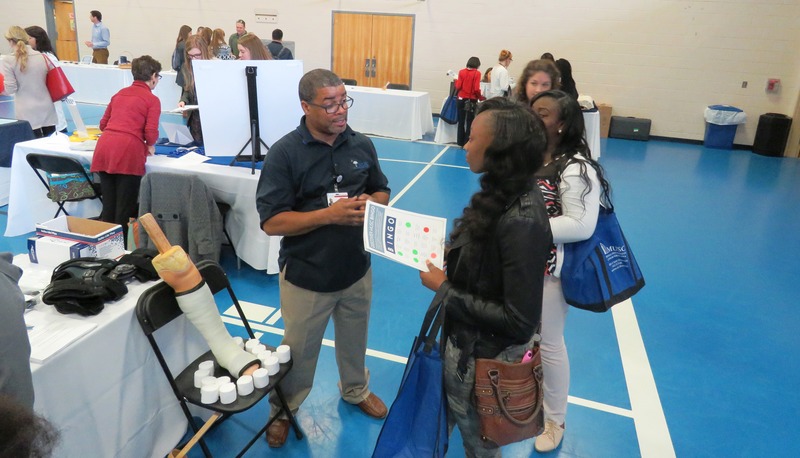 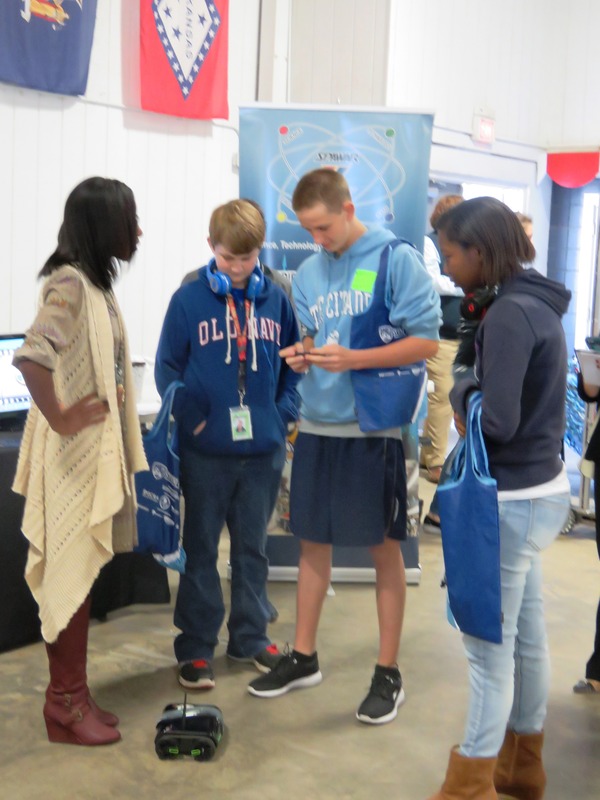 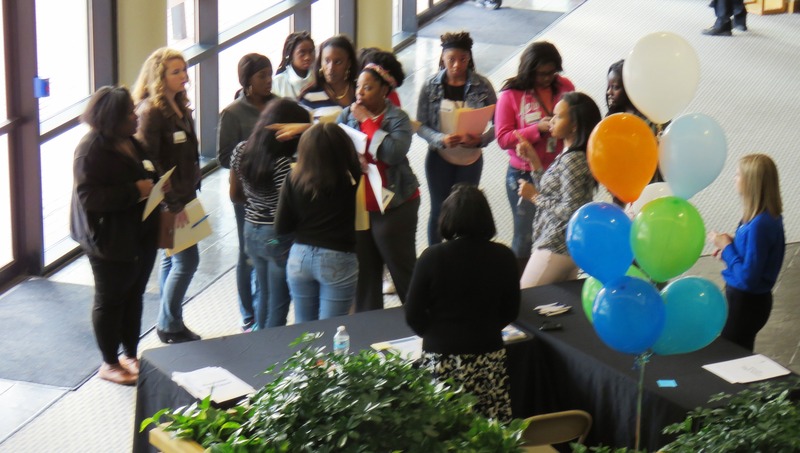 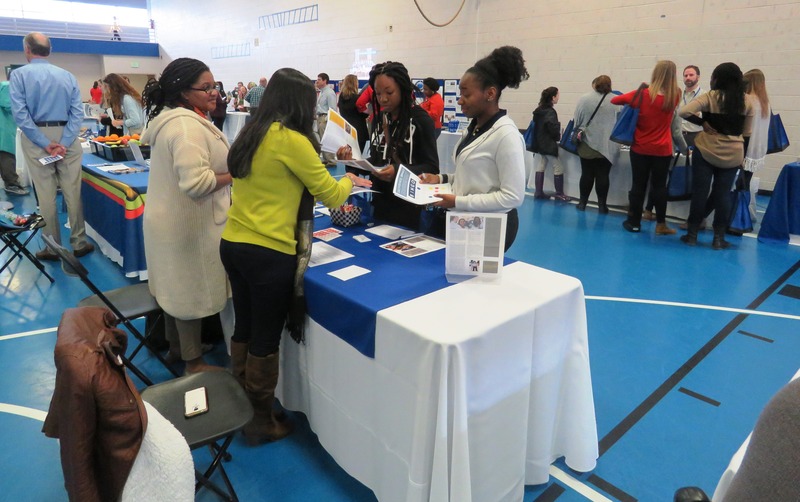 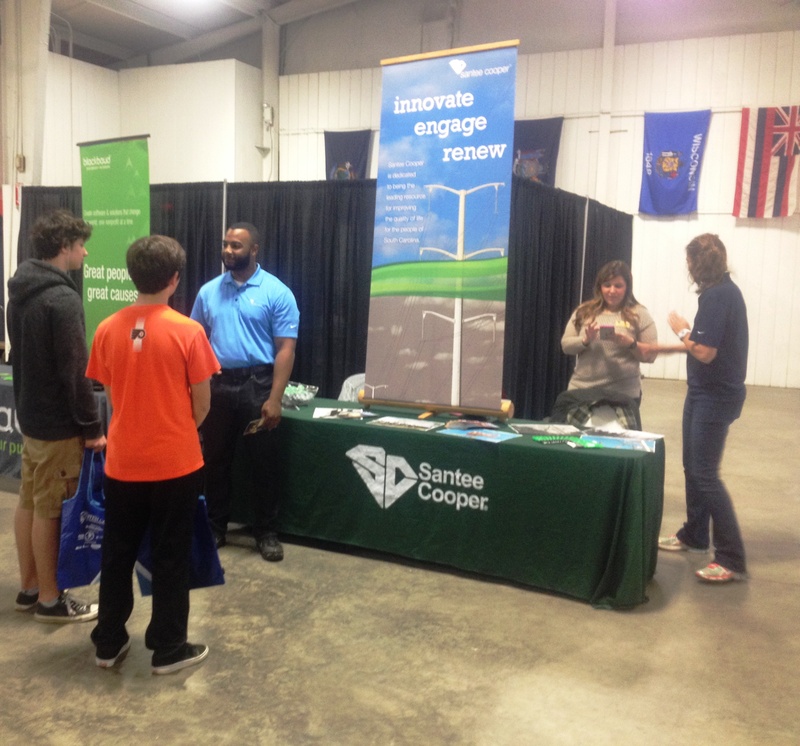 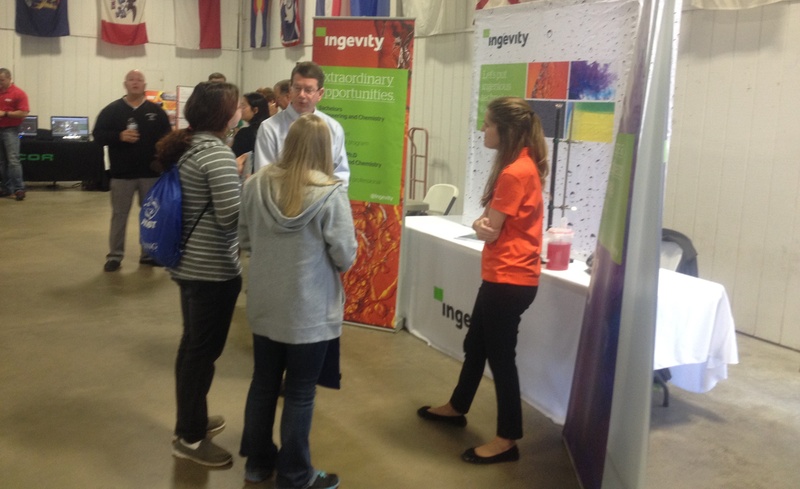 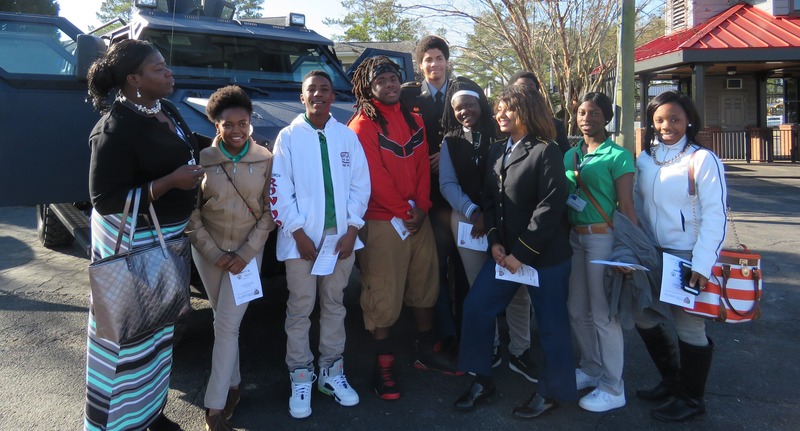 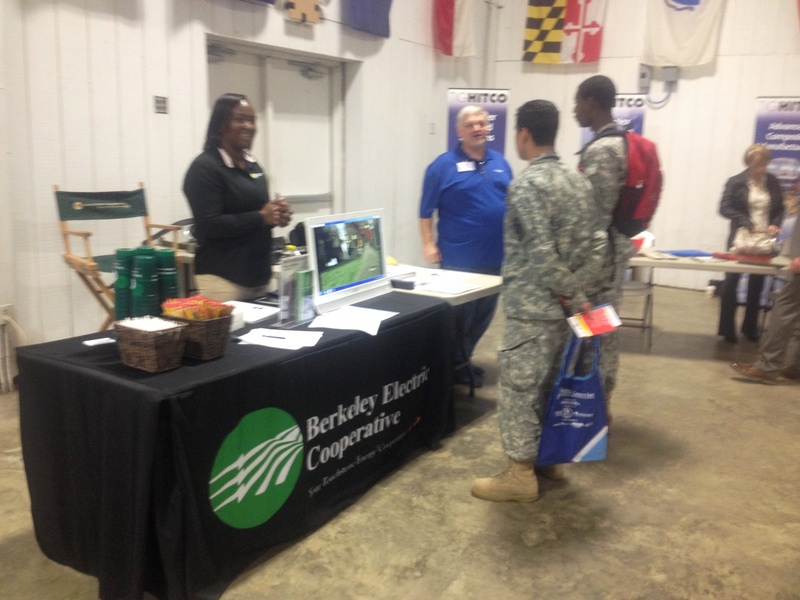 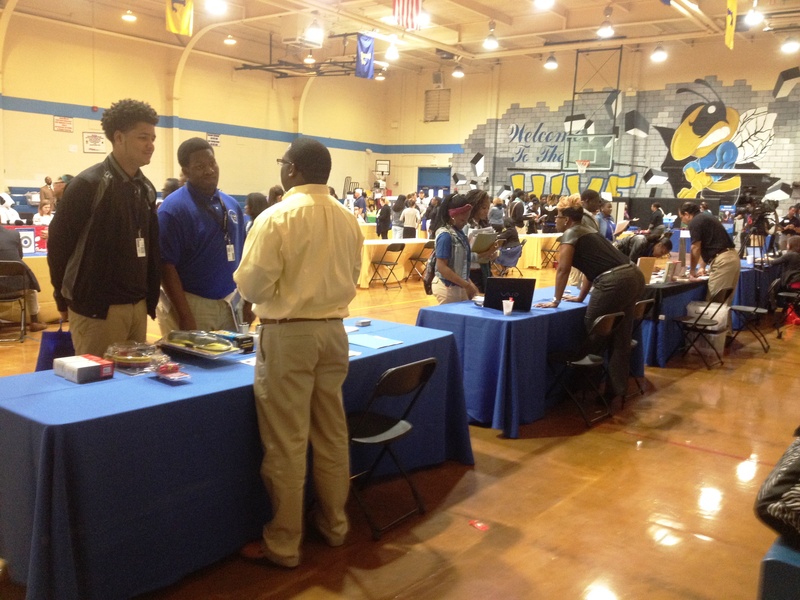 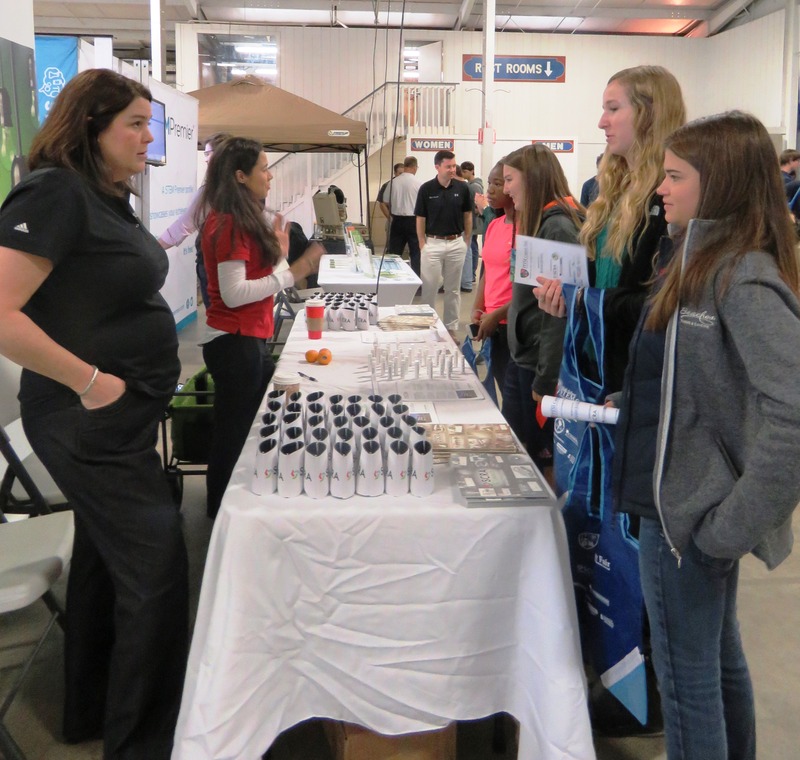 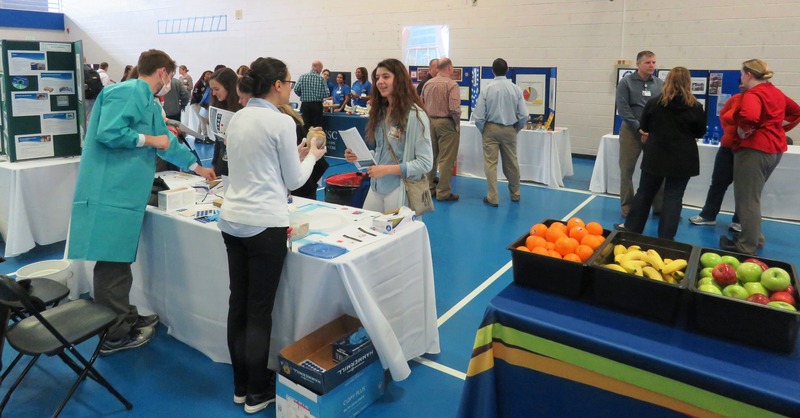 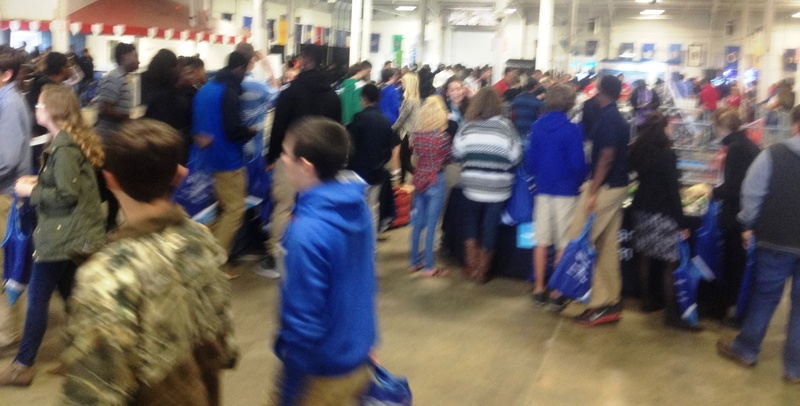 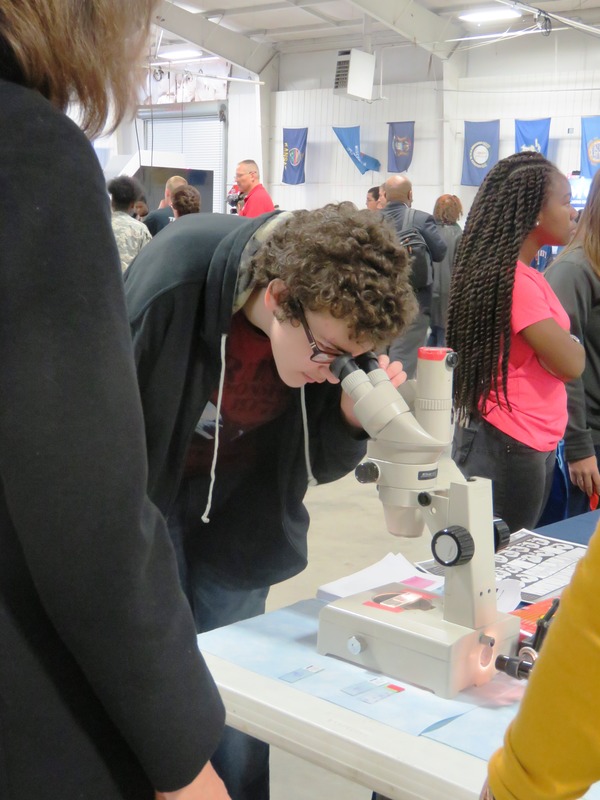 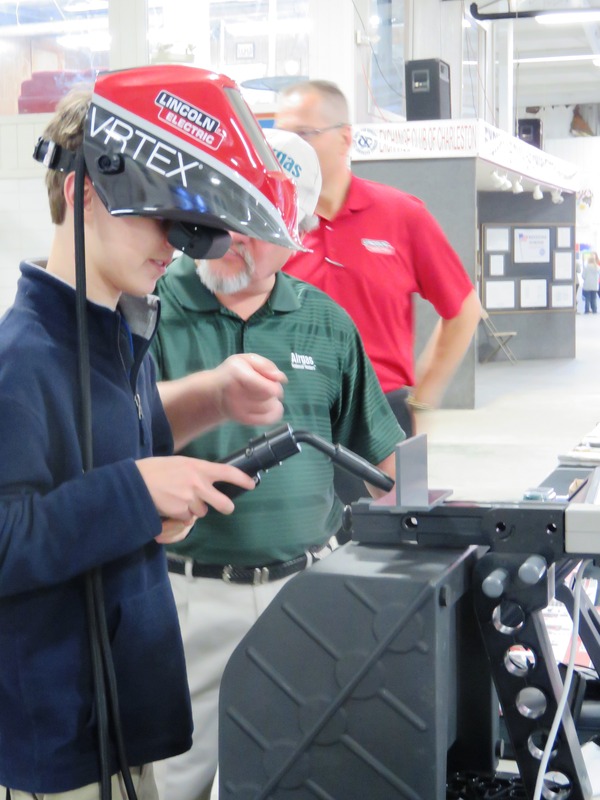 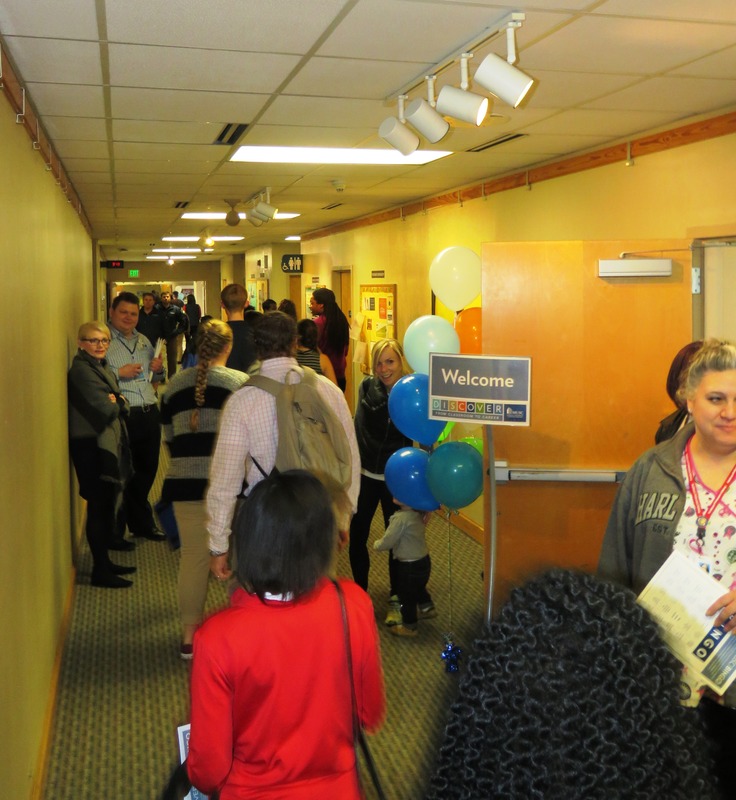 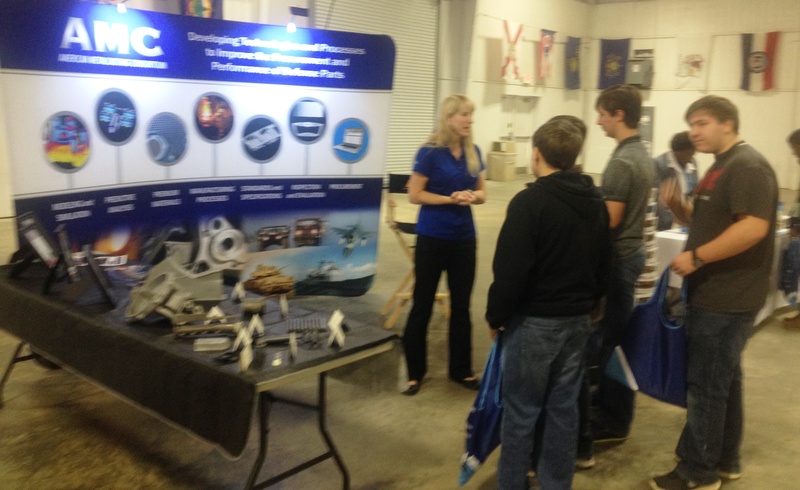 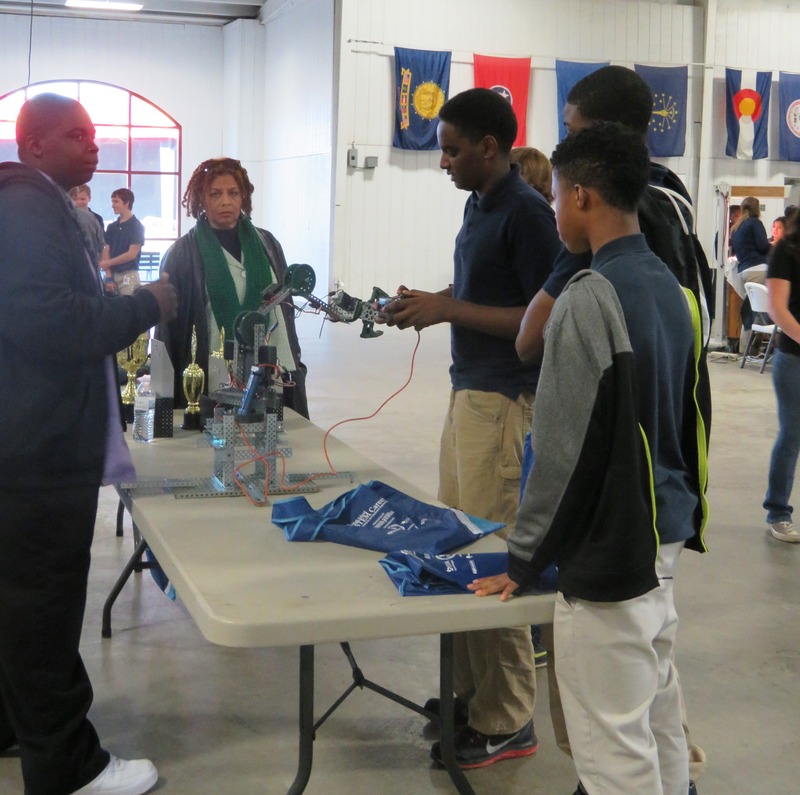 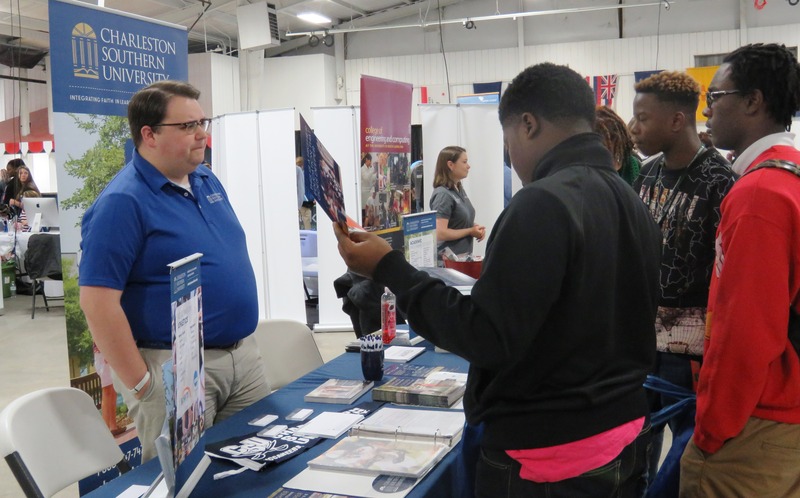 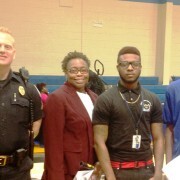 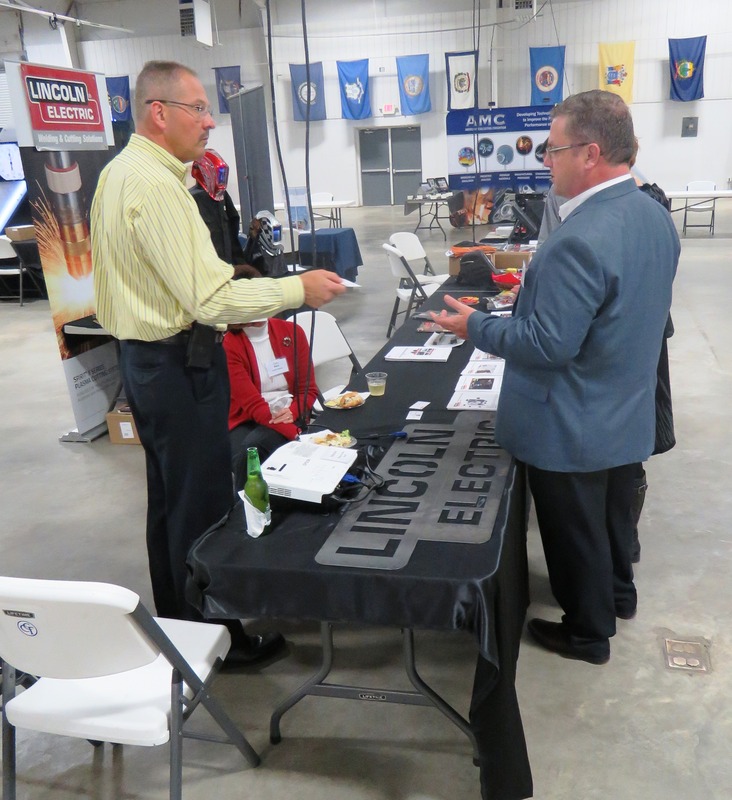 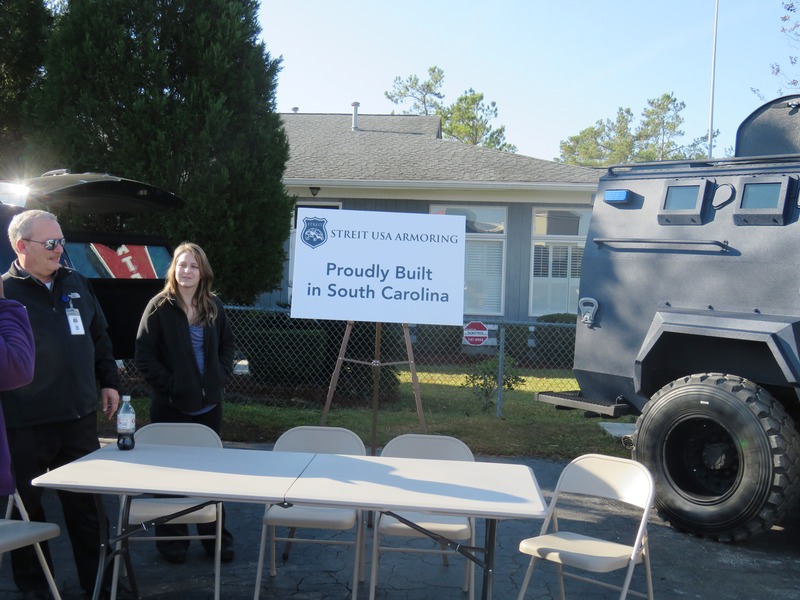 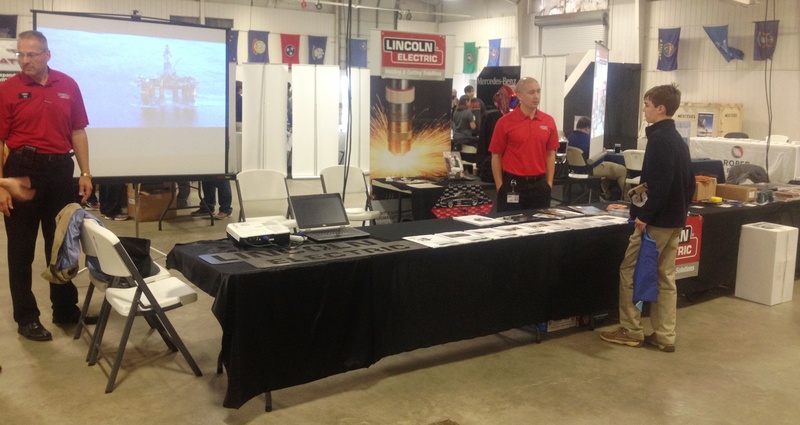 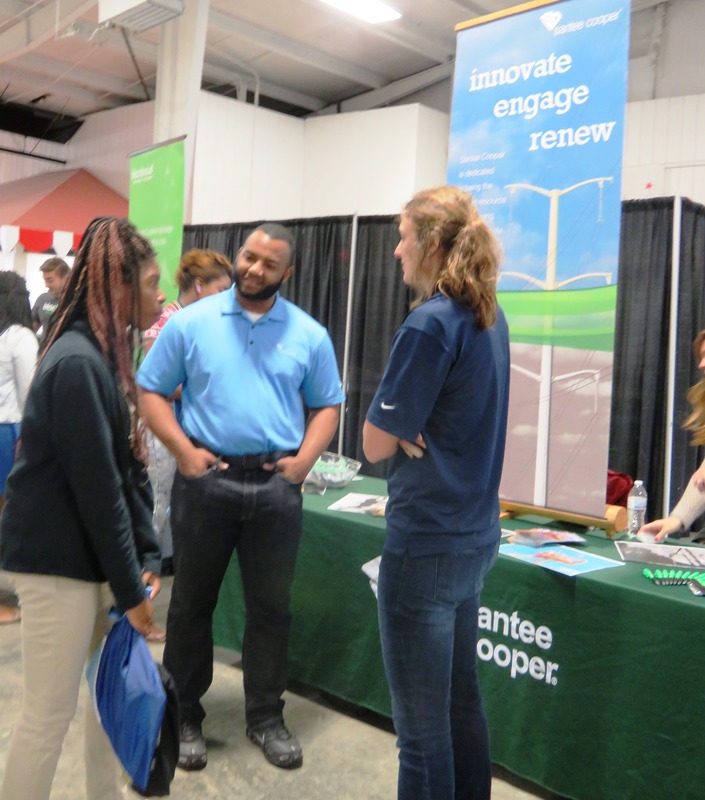 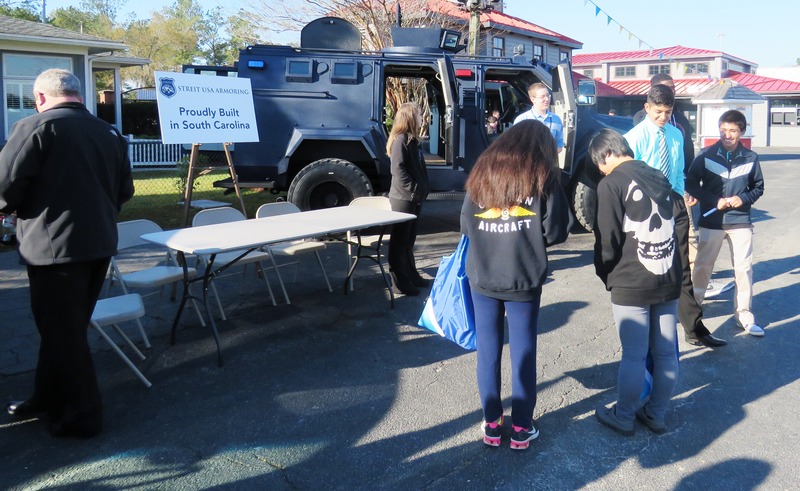 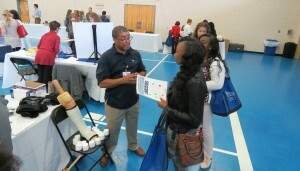 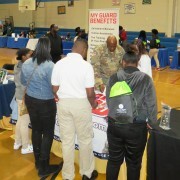 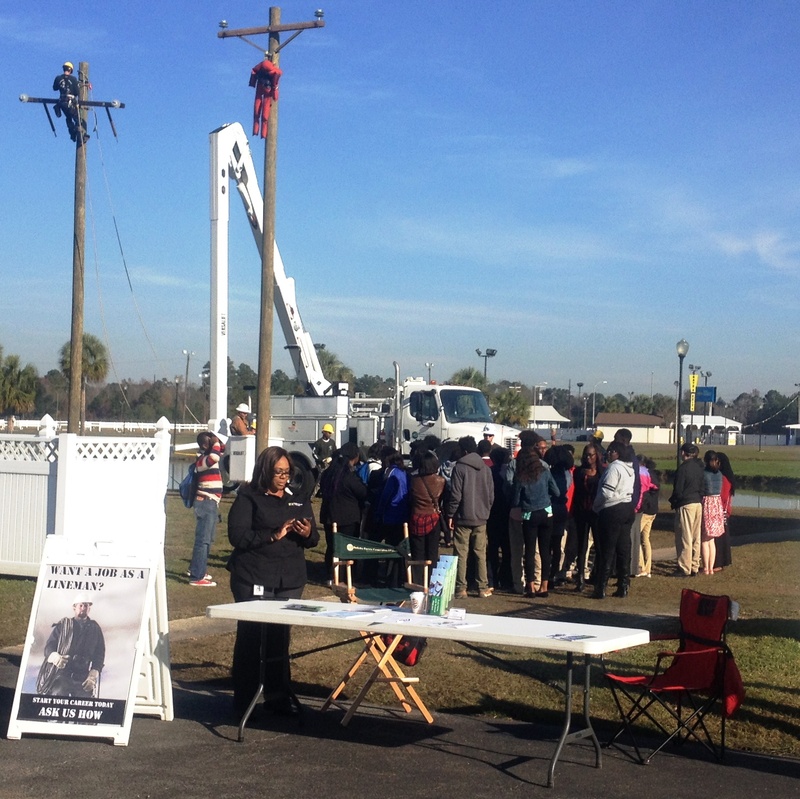 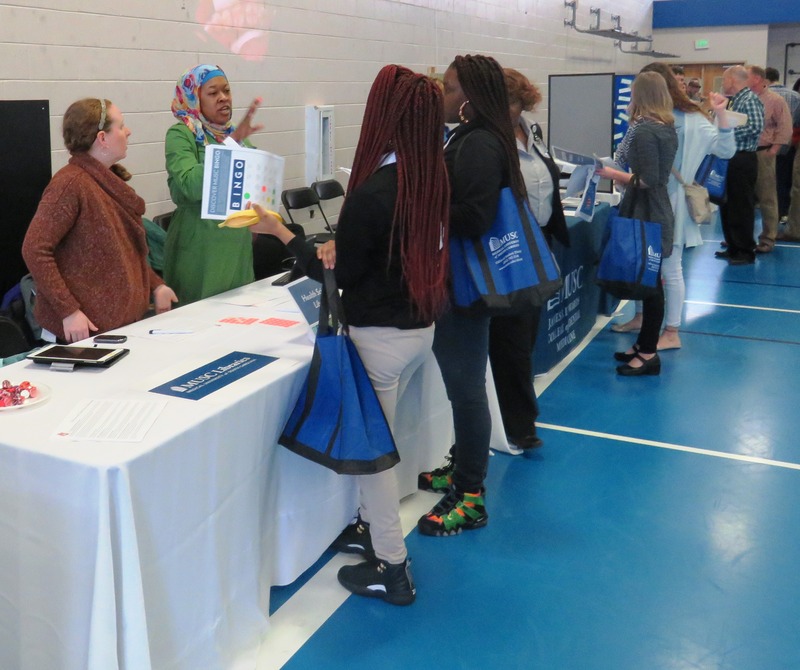 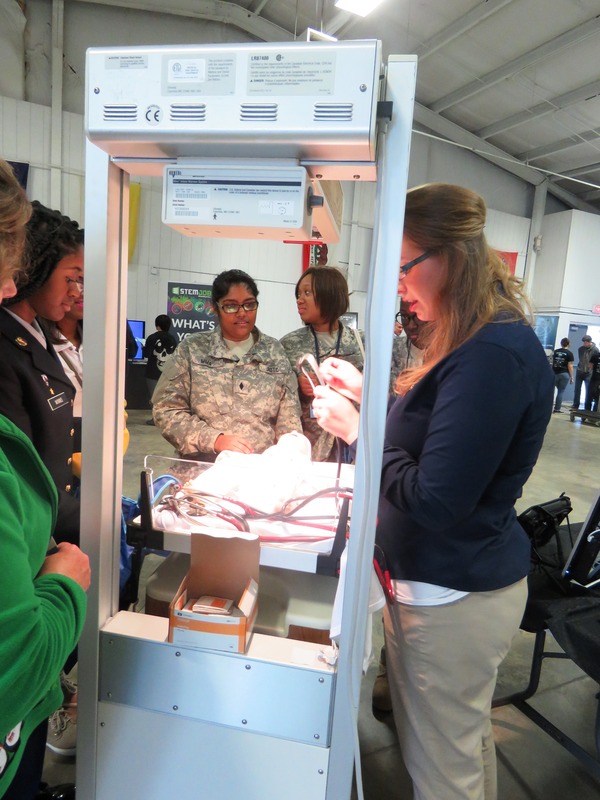 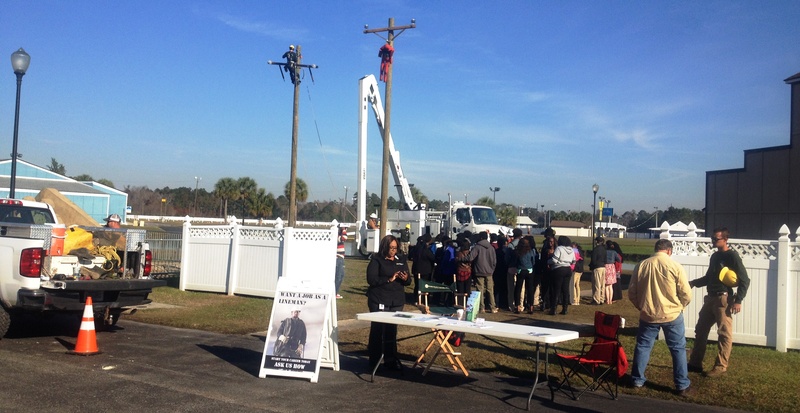 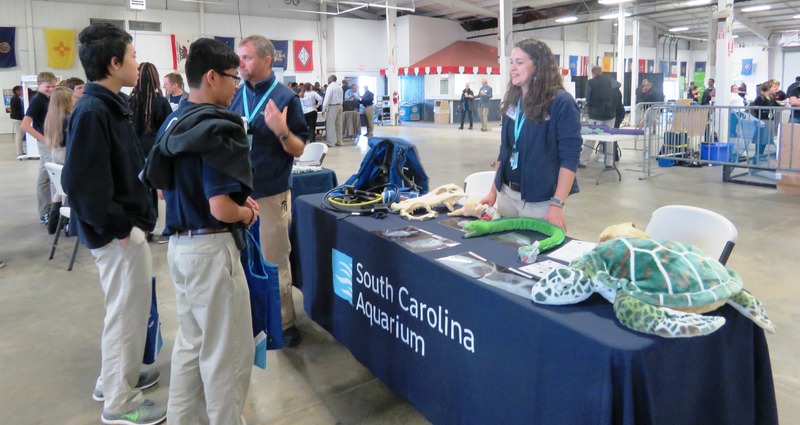 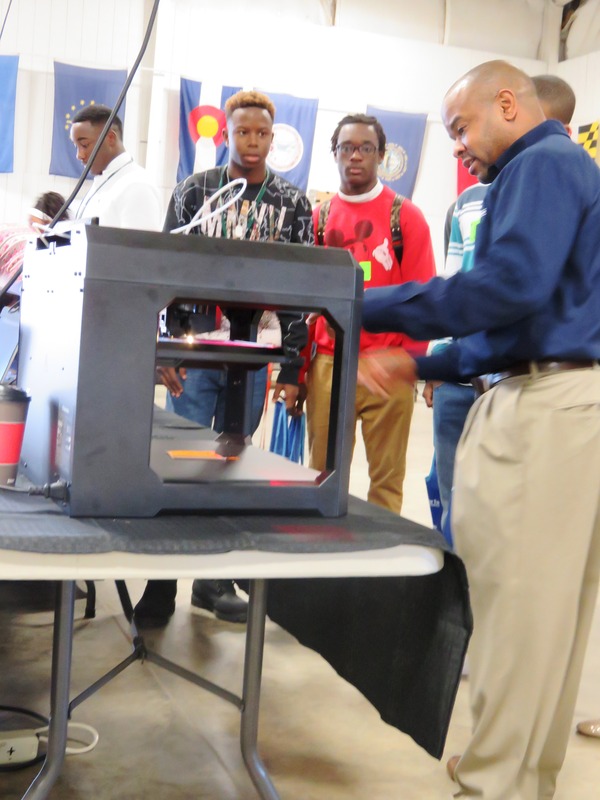 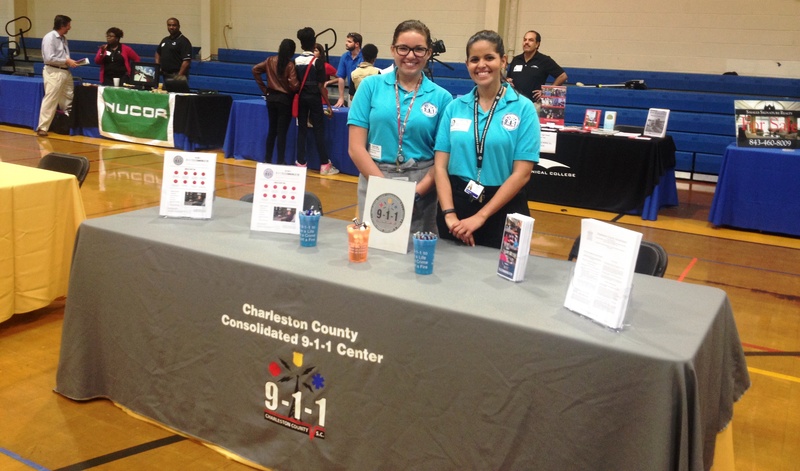 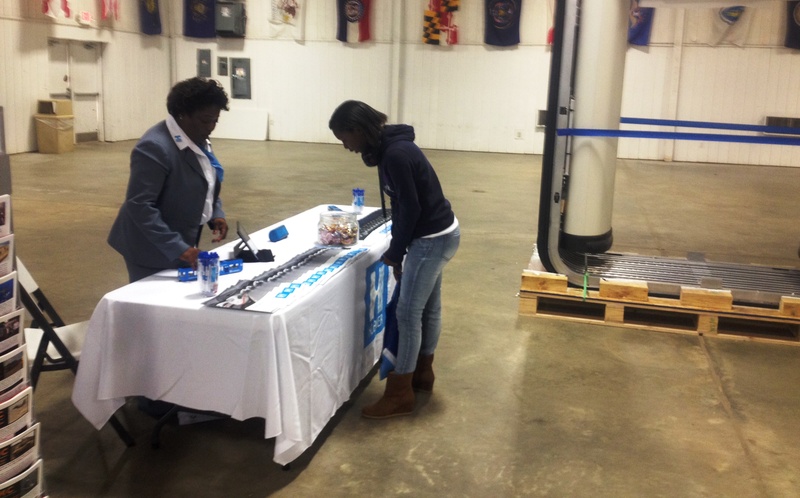 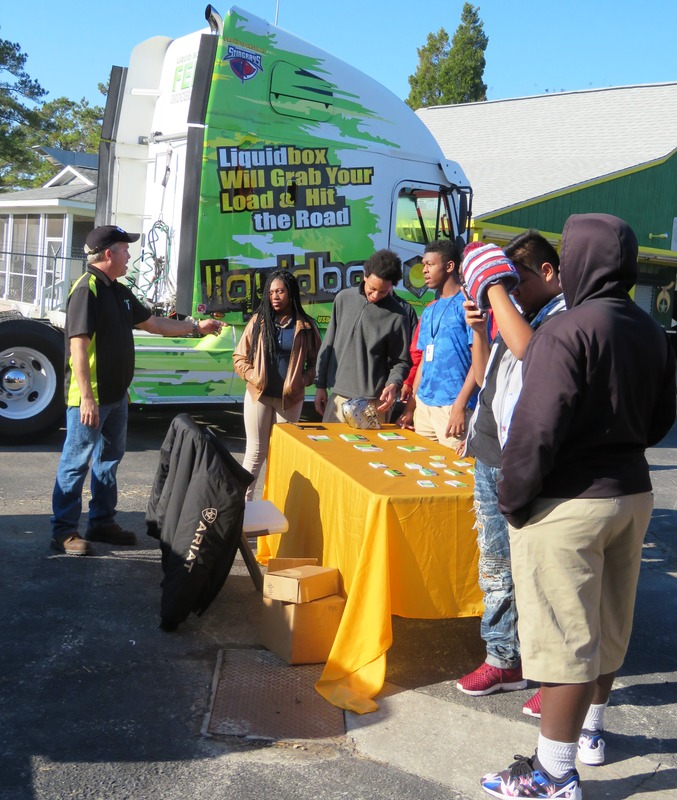 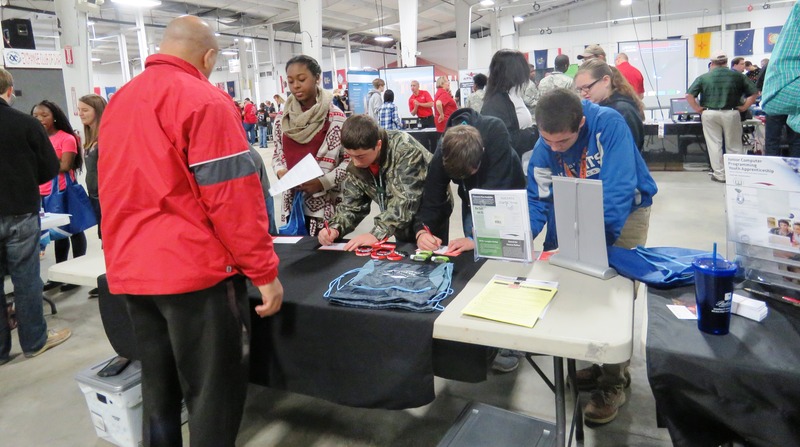 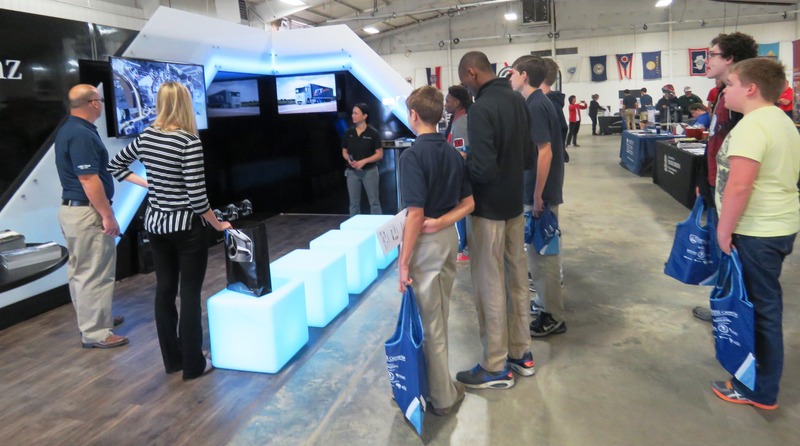 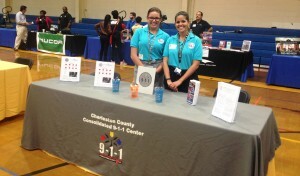 March 26 , 2015 – McClellanville, SC – Lincoln Middle-High School welcomed over 30 community partners and business professionals to their annual career day expo in their school gym. 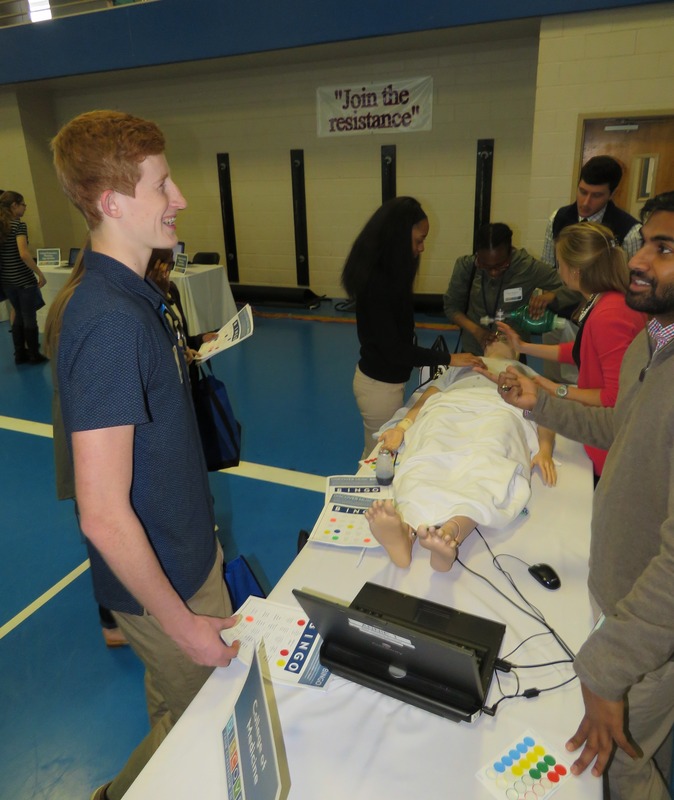 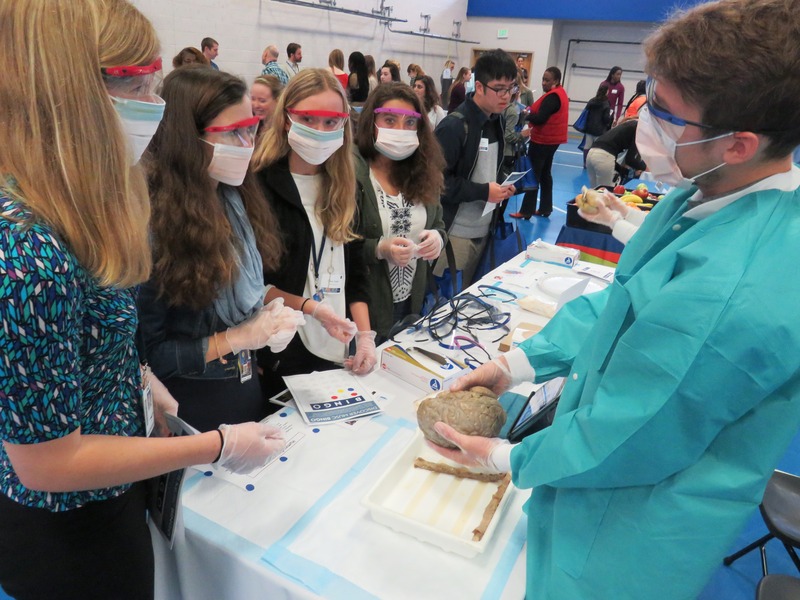 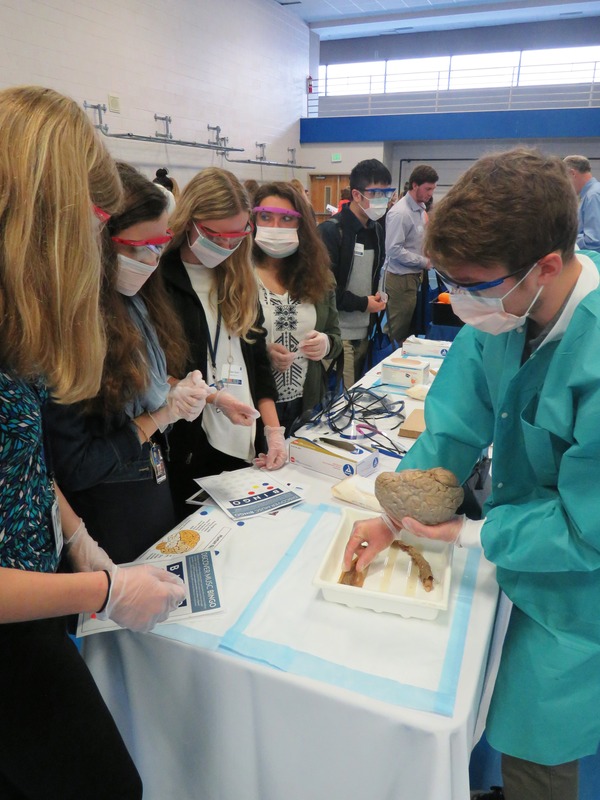 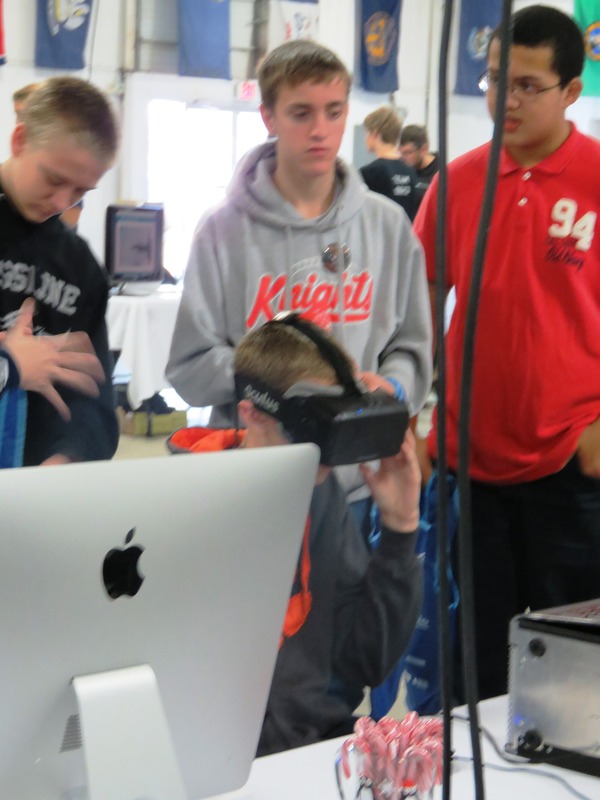 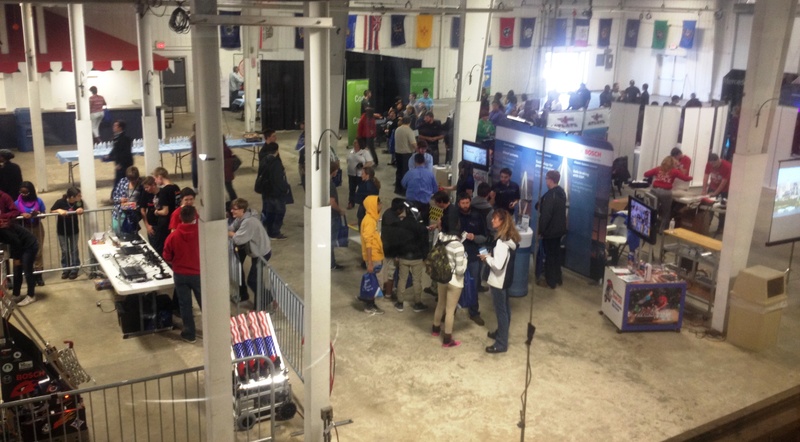 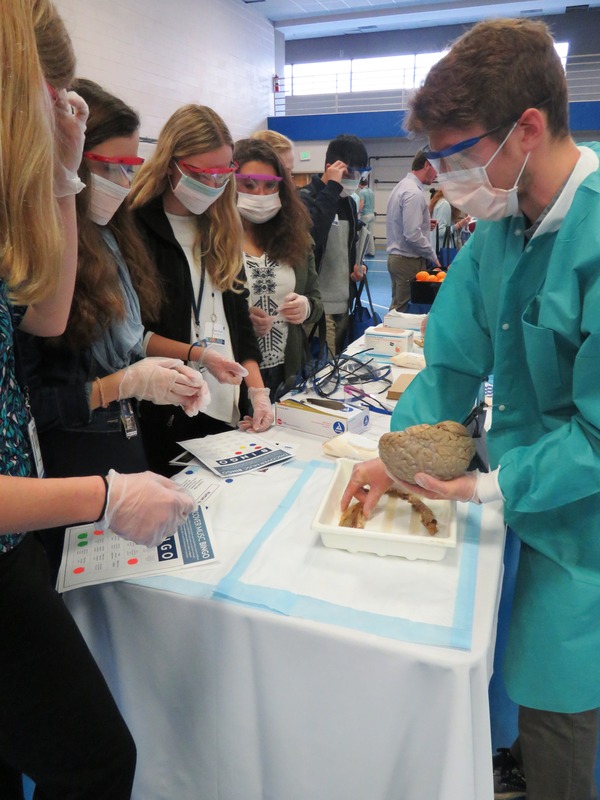 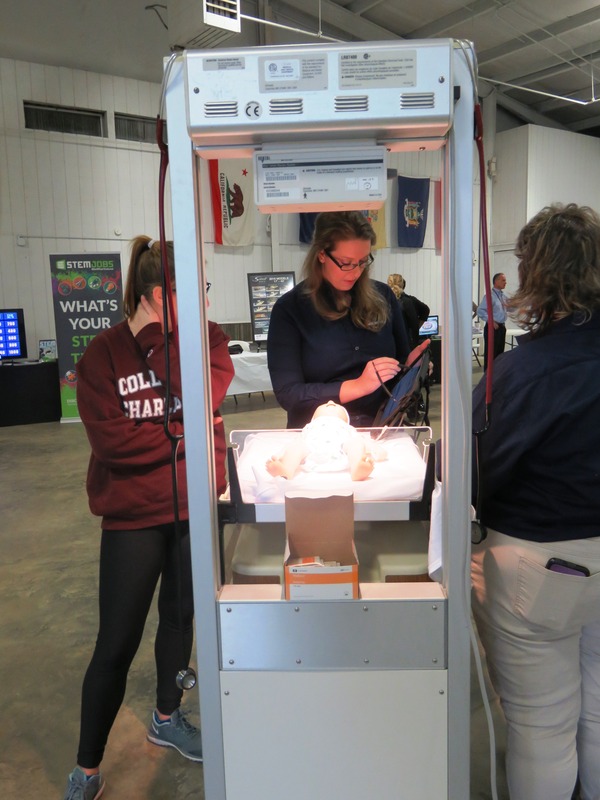 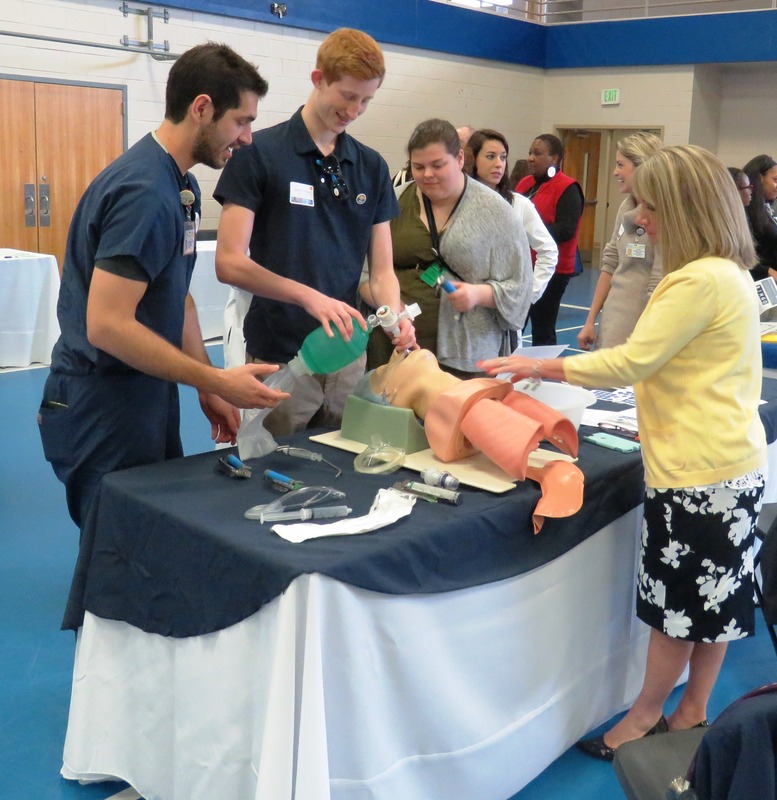 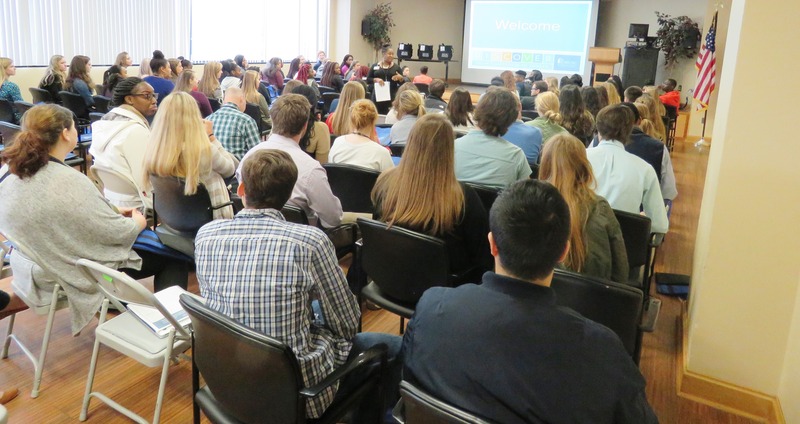 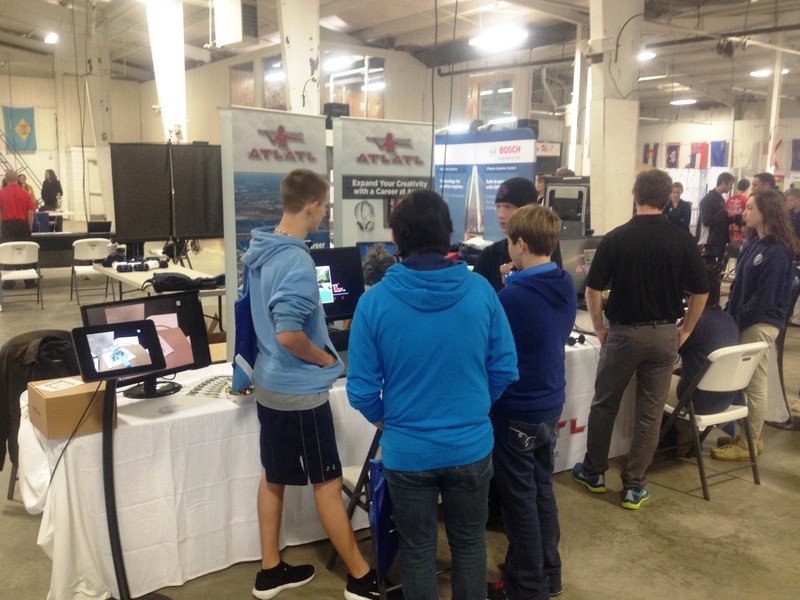 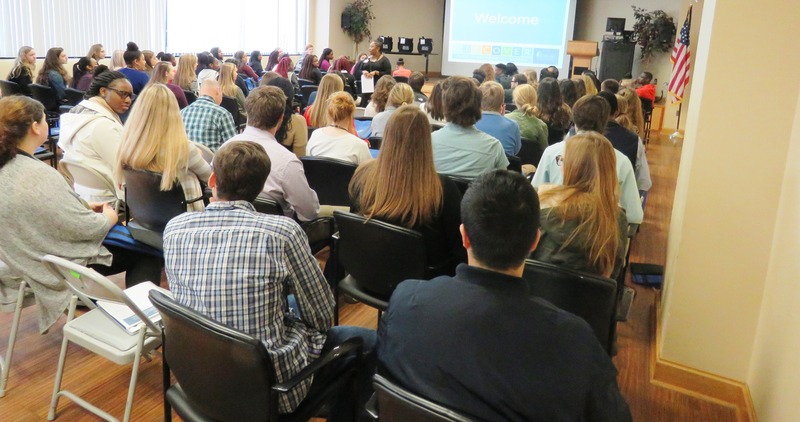 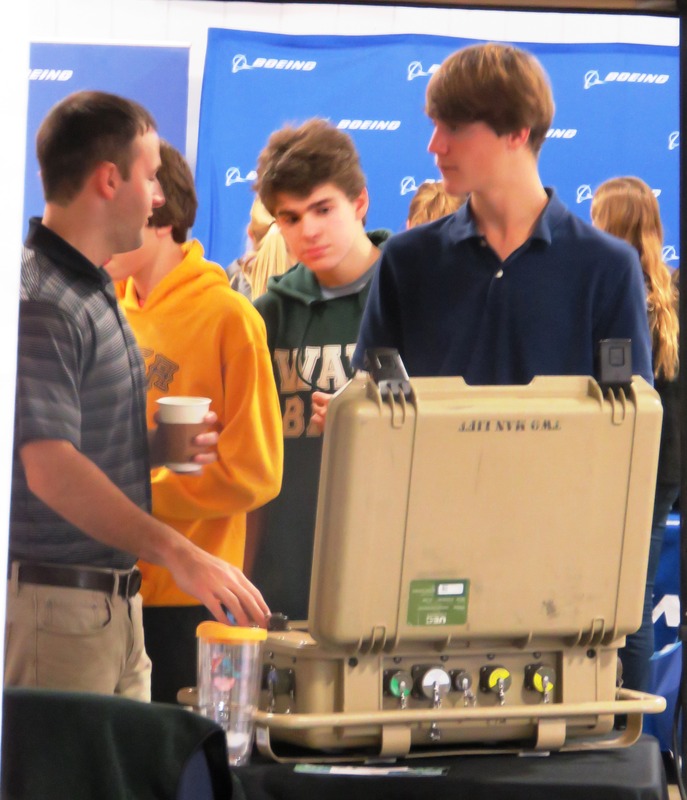 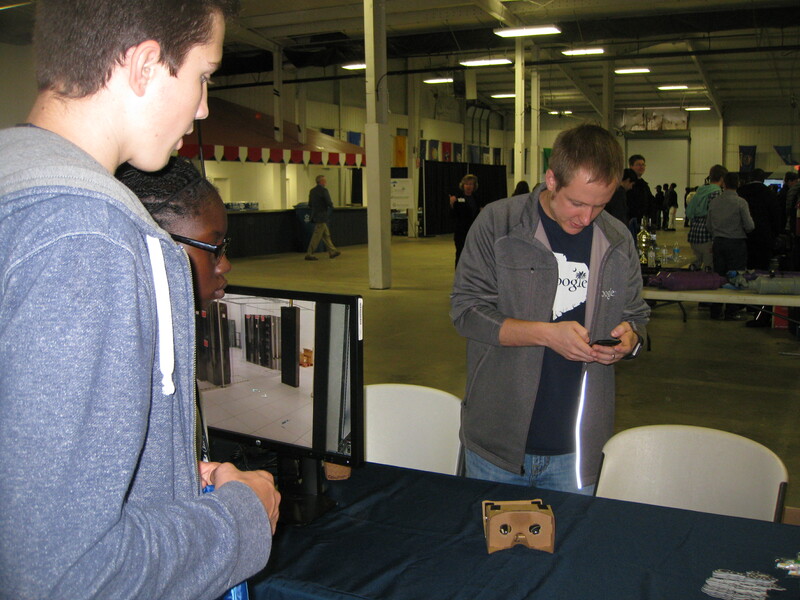 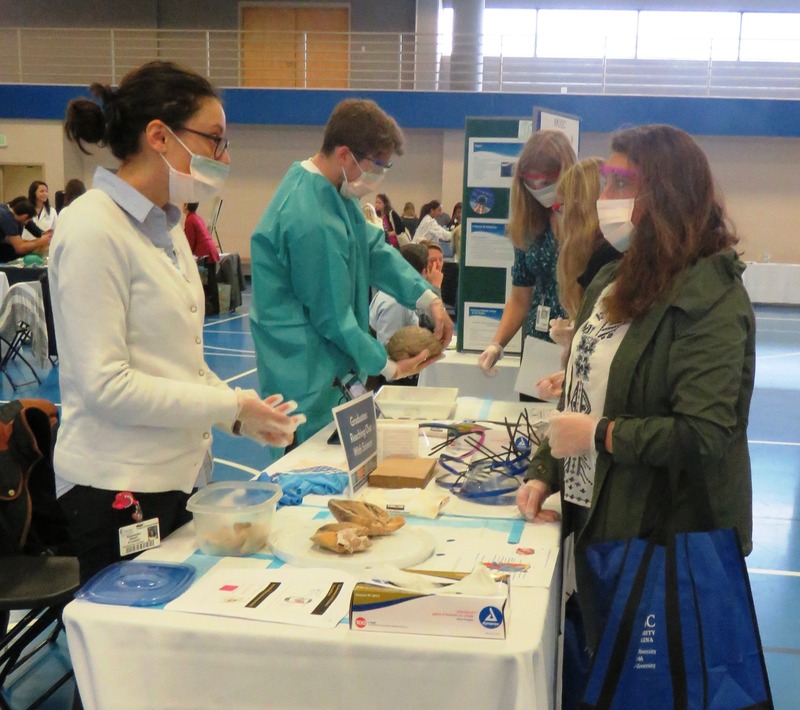 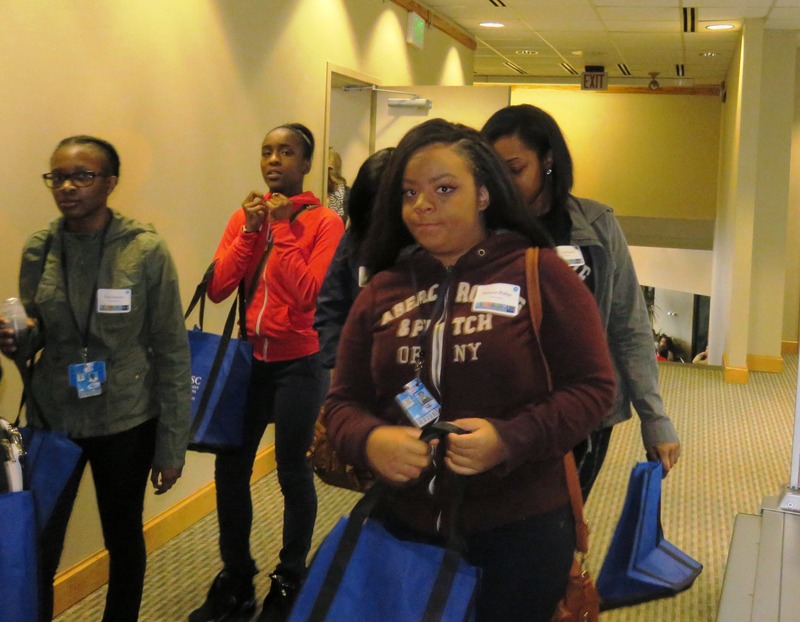 Students in grades 6-12 had the opportunity to engage professionals in conversation and get first-hand insight into a variety of career pathways. “We are thankful for everyone that made the event possible – special thanks to Ms. Leondra Stoney and Ms. Alvalene Rogers for their planning efforts” Ms. Jubar added. 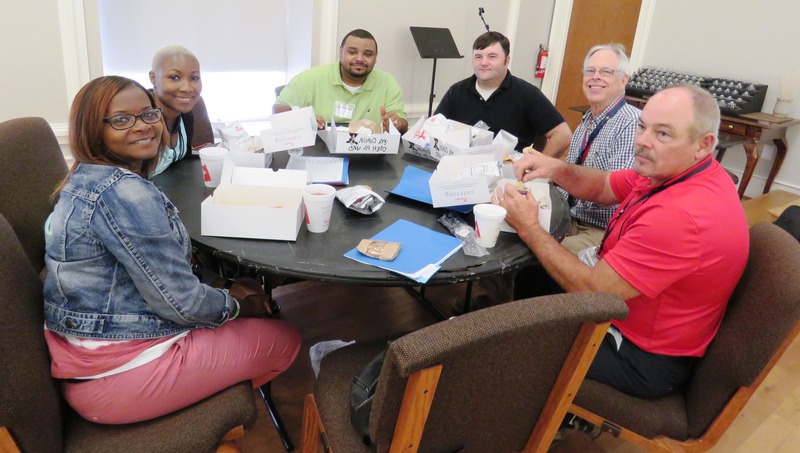 Culinary Arts instructor Ms. April Mazyck and her students supplied the breakfast for the visitors, and everyone enjoyed a sandwich from Honeybaked Ham company before leaving.